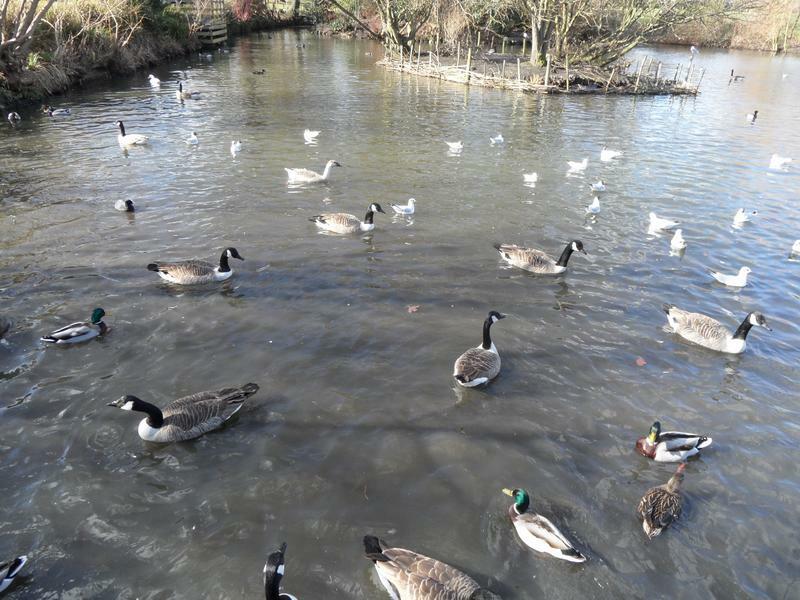 31st December 2014, half the pond is covered in ice which the geese hate, so out of the water. 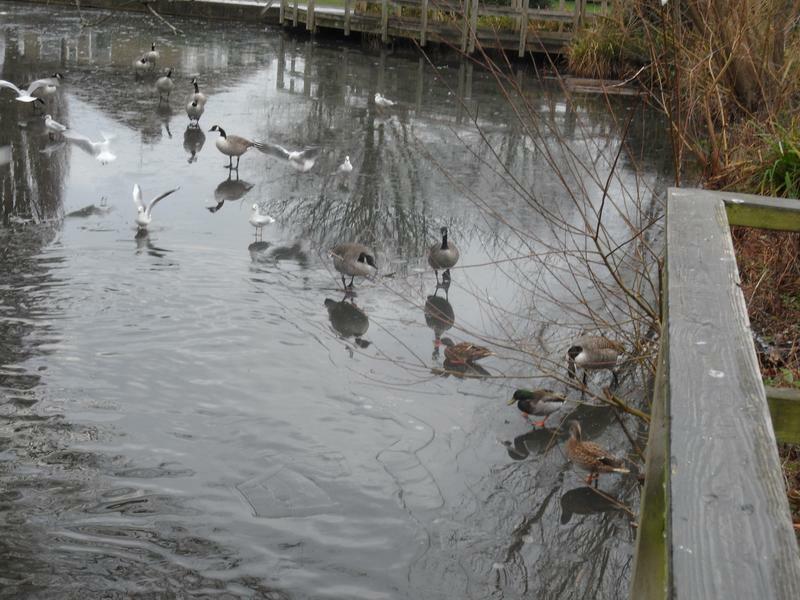 Ducks, geese and birds skating on the ice, their feet really can not cope, too slippery. 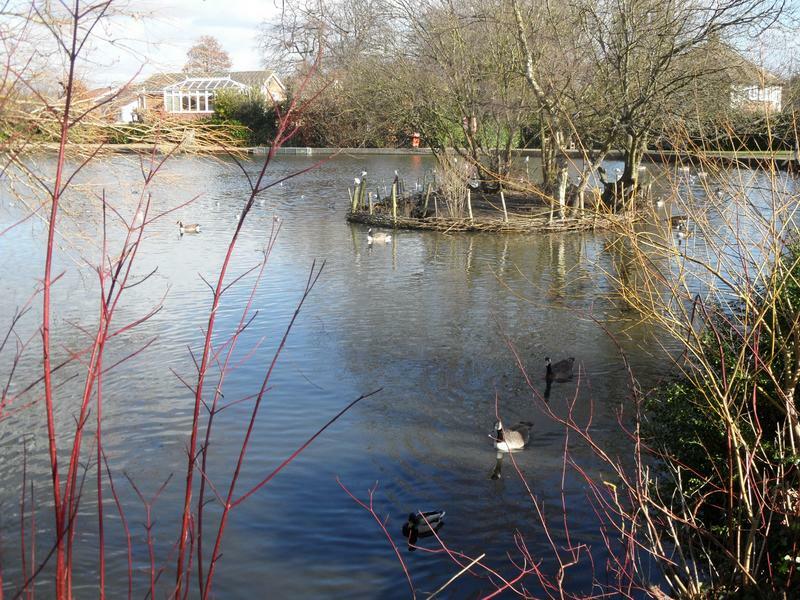 Only the far side of the pond has ice, there is plenty of open water still. 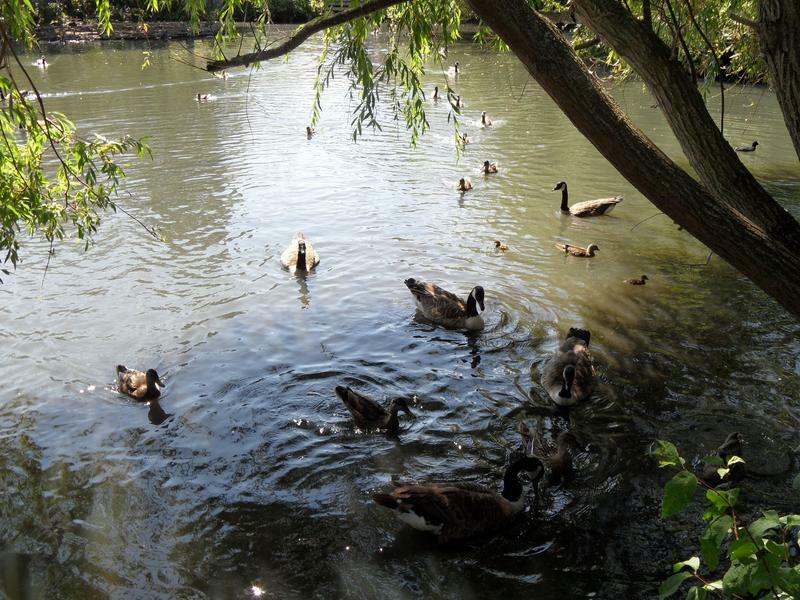 The ducks and geese are not very hungry, maybe lots of other visitors. 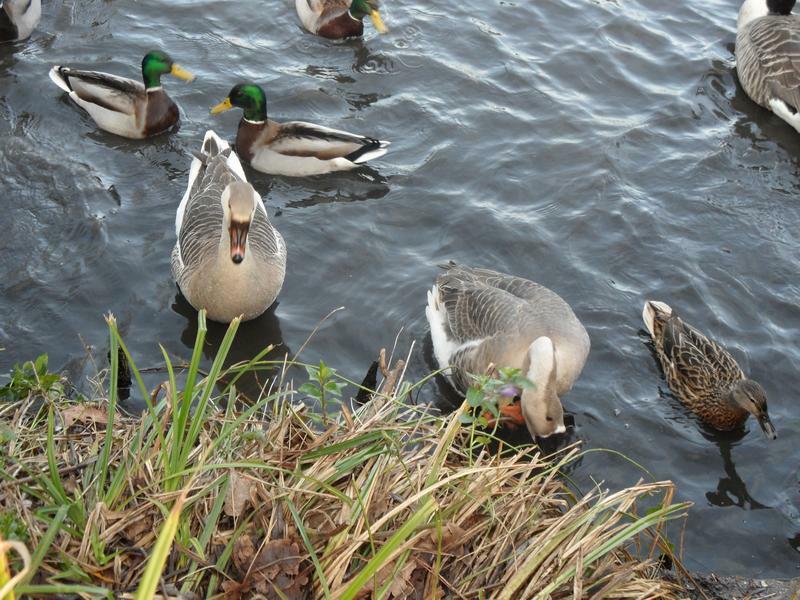 11th January 2015, two Bean Geese, winter visitors from Northern Europe. 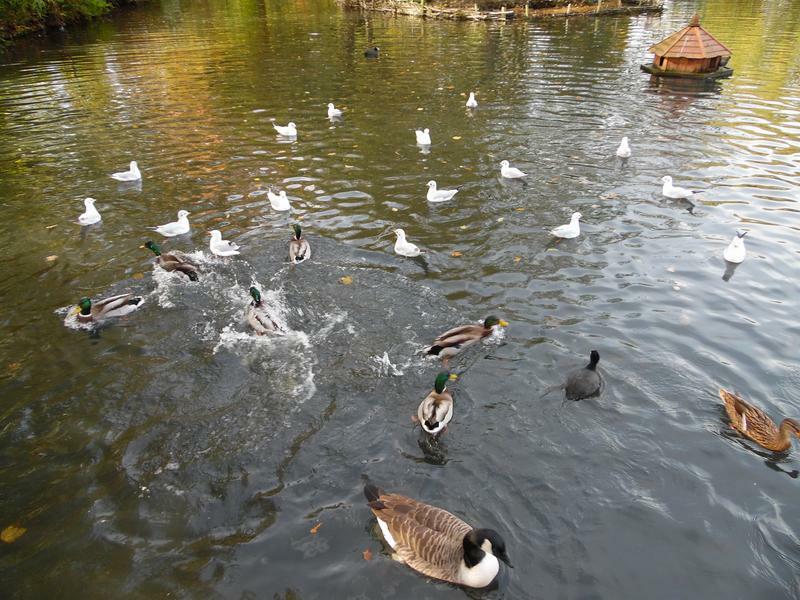 No more ice on the pond this winter. 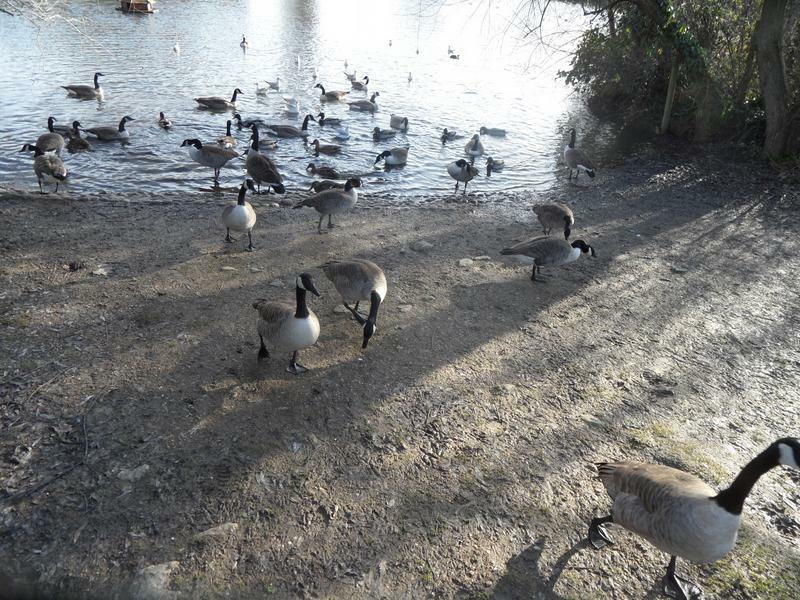 The Canada Geese are hungry today, many leaving the pond for food. 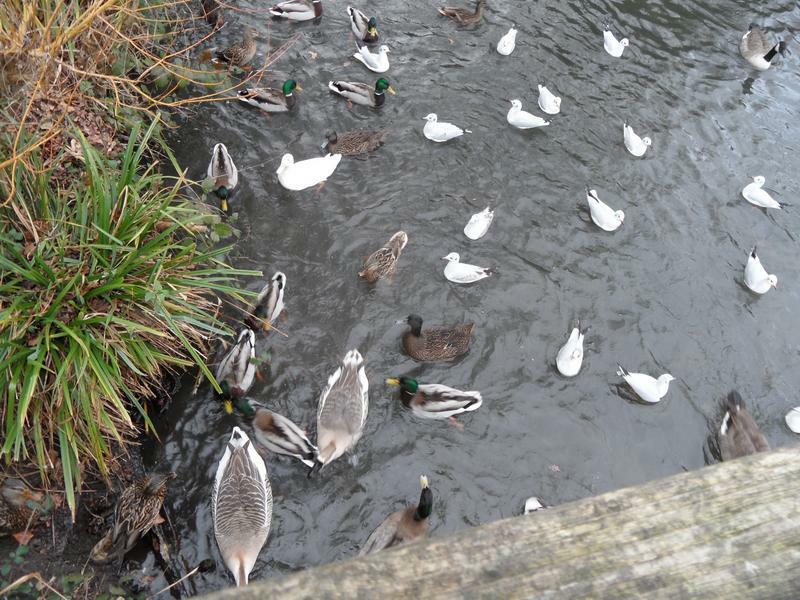 18th January 2015, no-one seems that hungry this week. 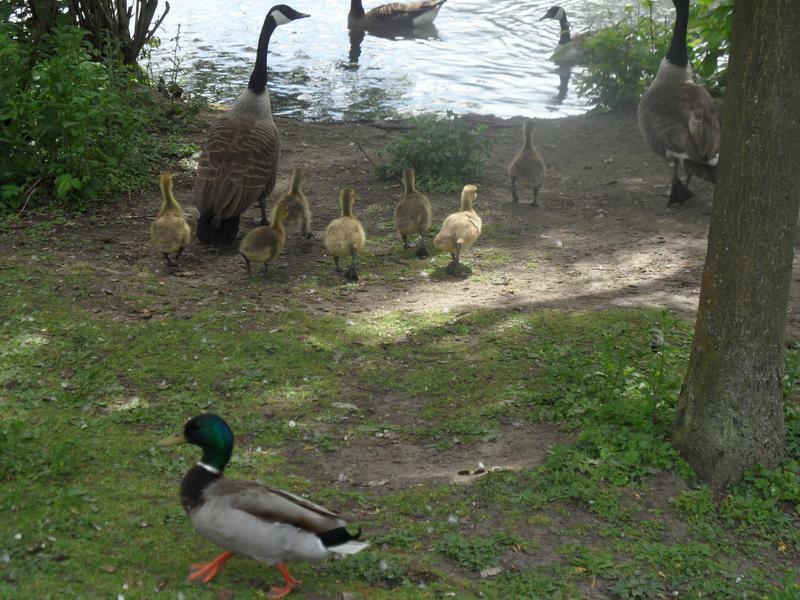 The Bean Geese near the large island, with the White Mallard and family. 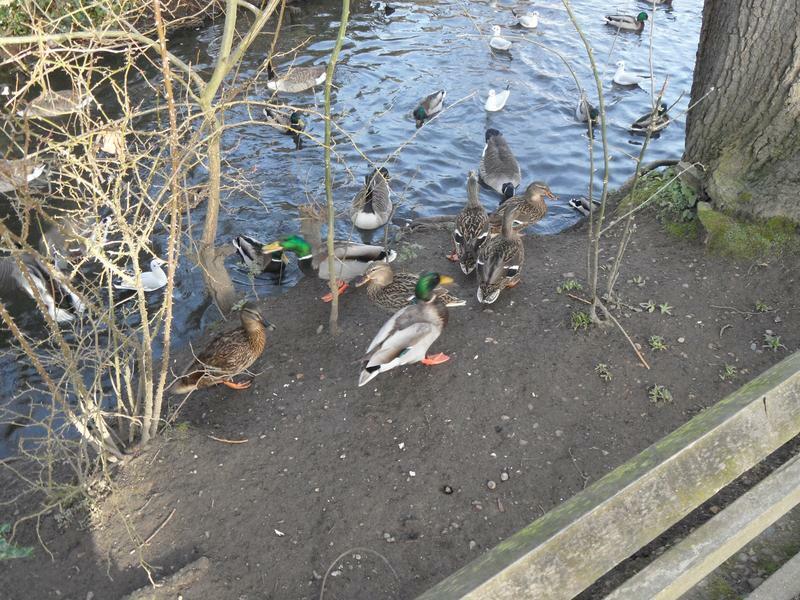 1st February 2015, more hungry this week. 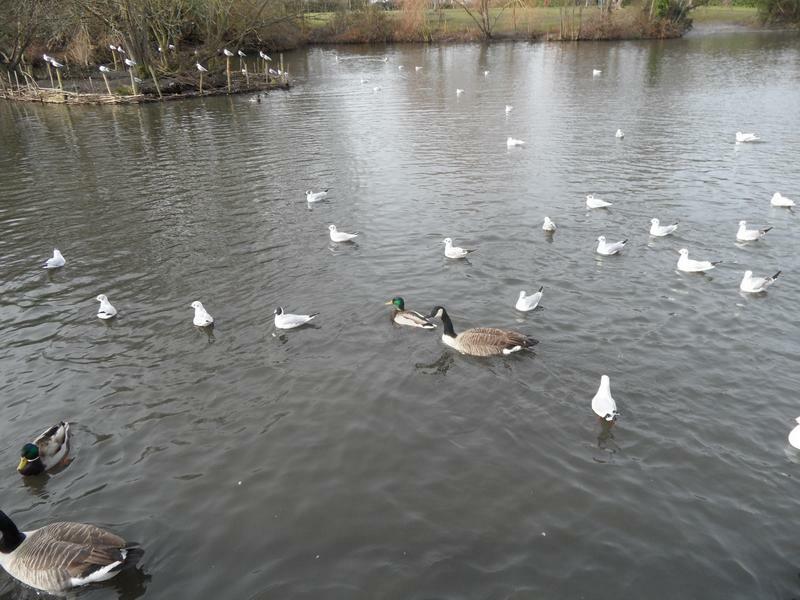 Still a lot of gulls around. 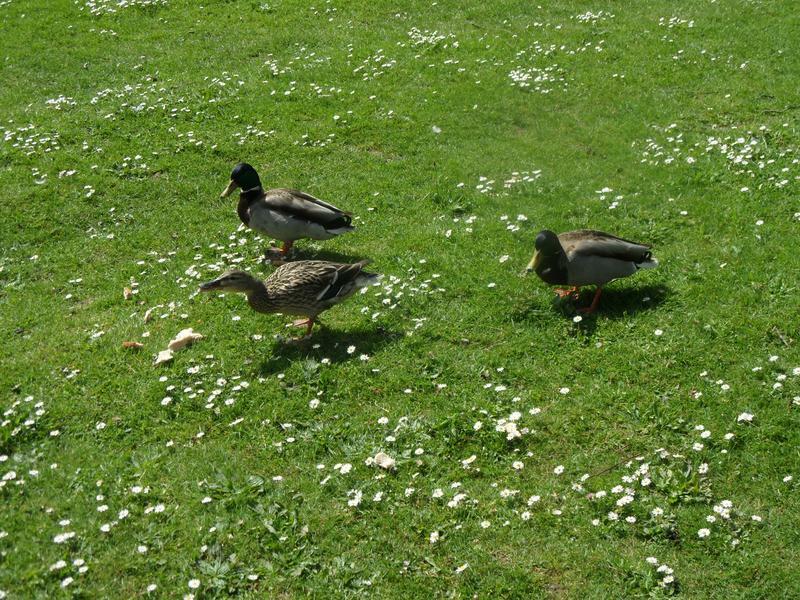 Don't often see ducks in this area of the park, they have to fly or a long walk. 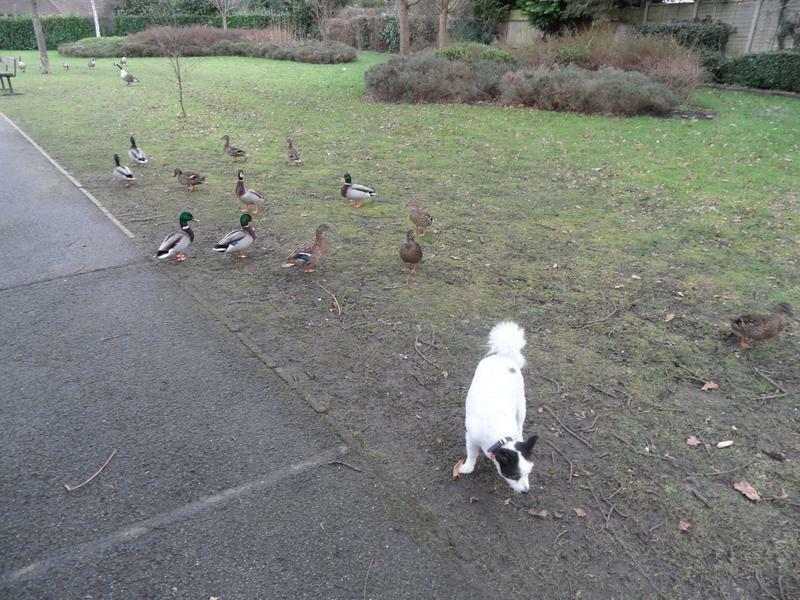 Lucy the dog is ignoring them. 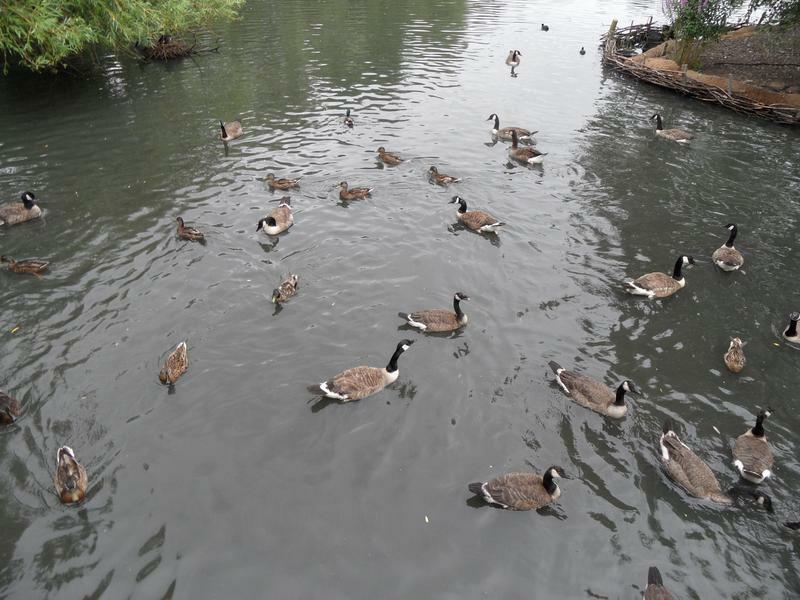 Many more ducks and geese around the large island. 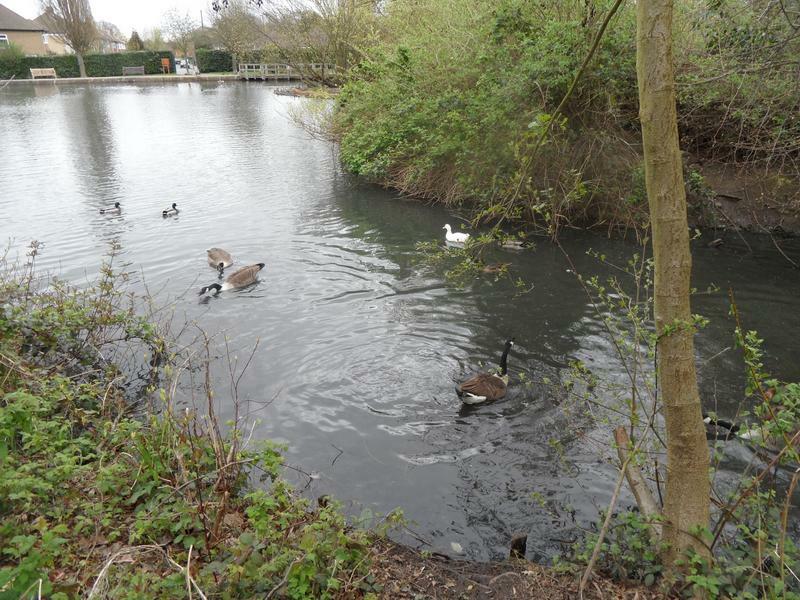 But virtually none at the other end of the pond. 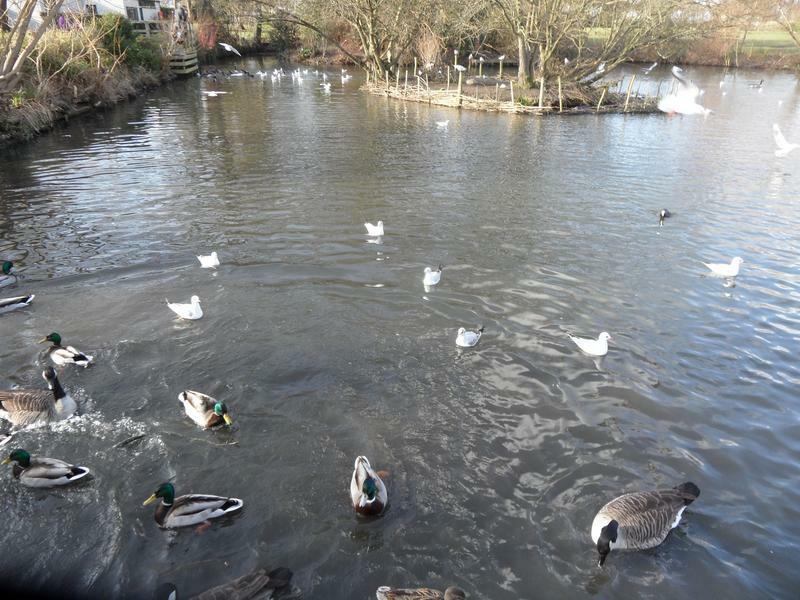 8th February 2015, brighter weather, but still cold. 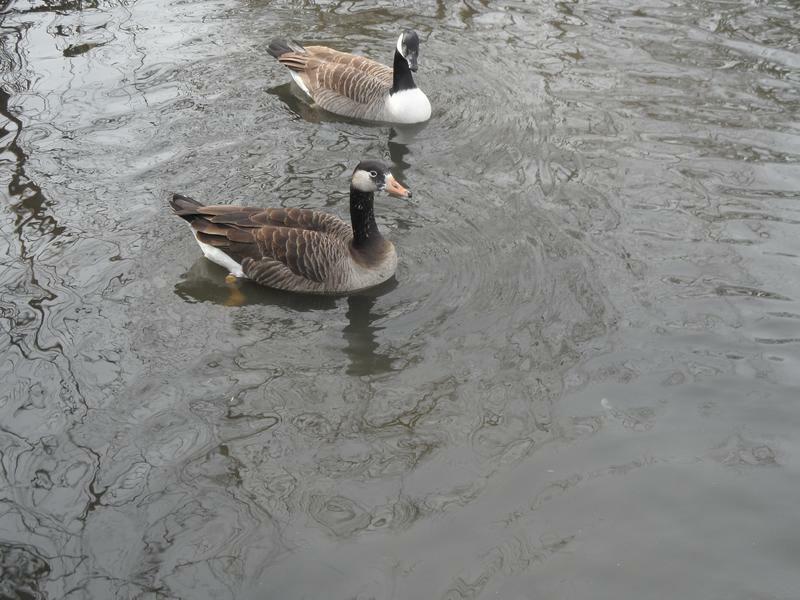 The two Bean Geese again. 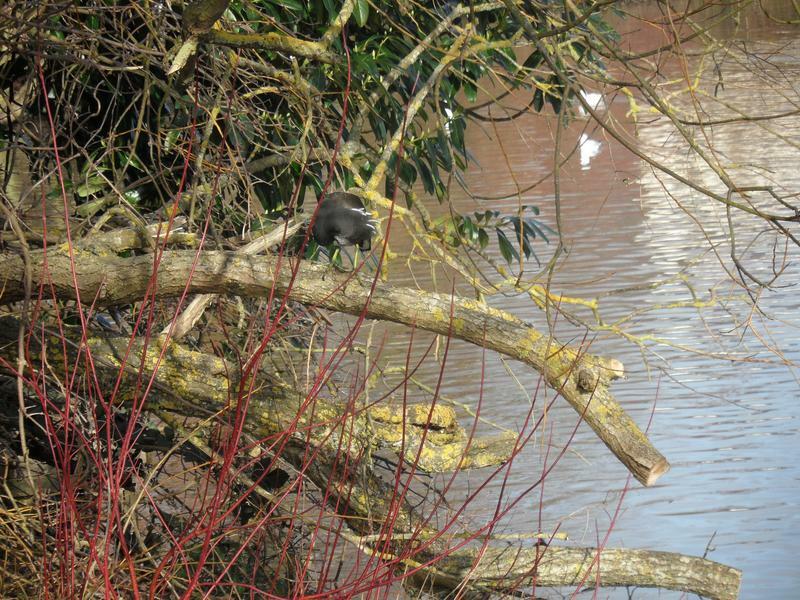 A Moorhen on a branch on the island. 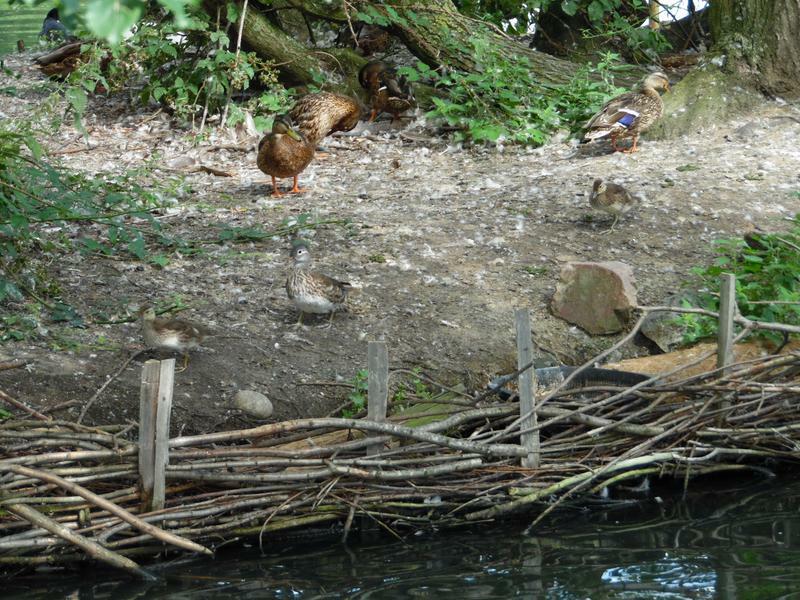 The ducks are hungry so climb the steep bank to get more food. 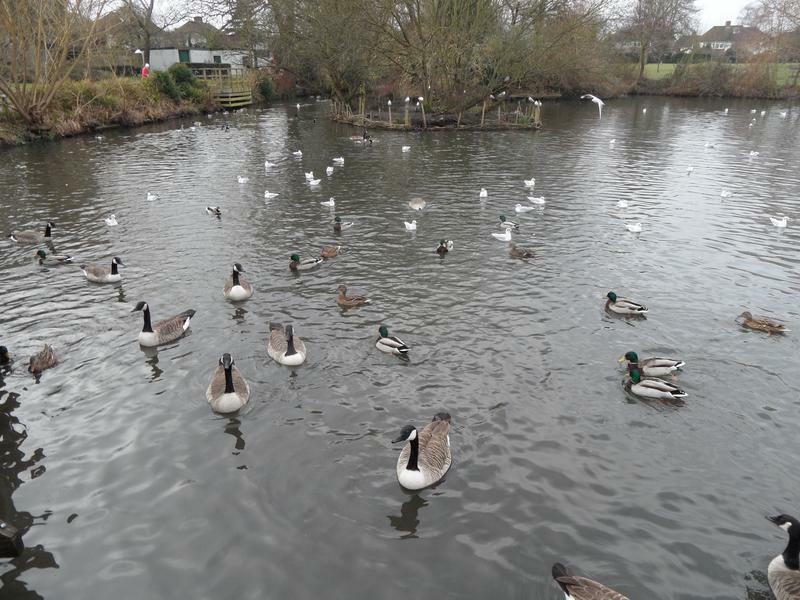 15th February 2015, still a lot of gulls. 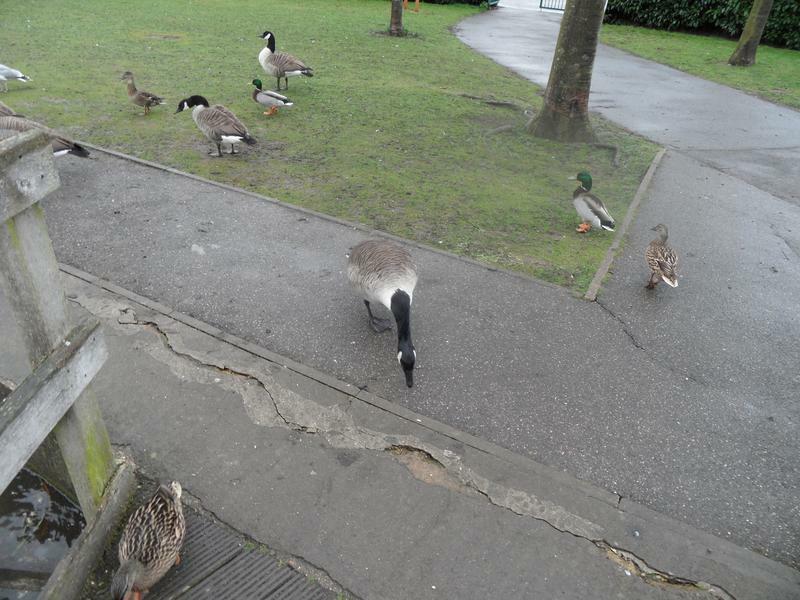 And hungry ducks and geese on the paths. 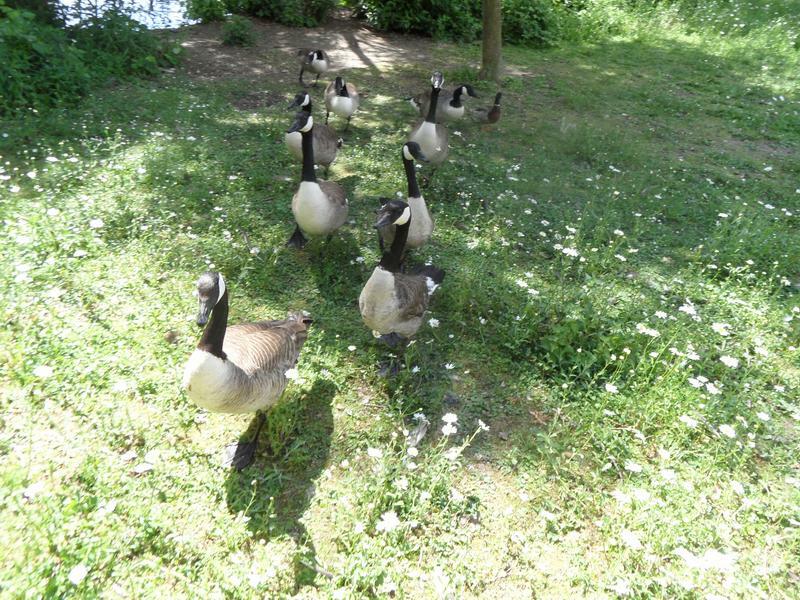 The geese are following us around the large island. 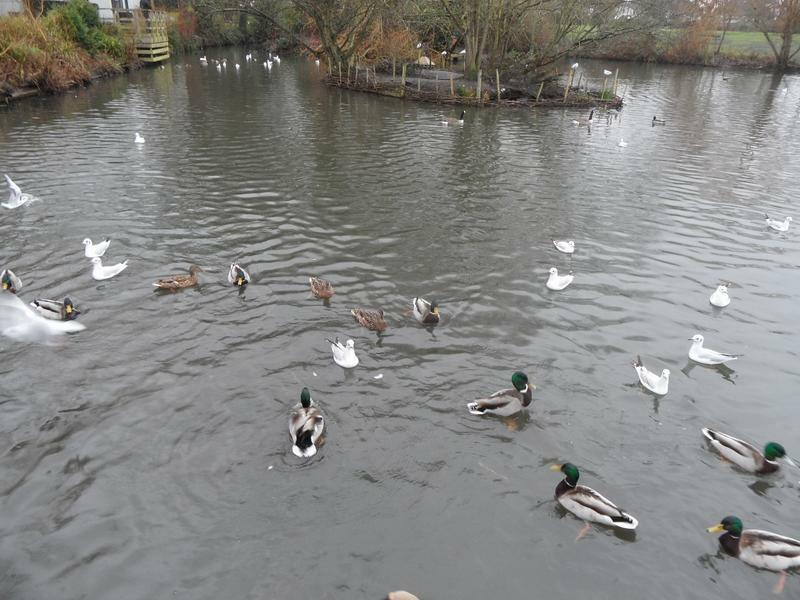 22nd February 2015, more gulls than ducks. 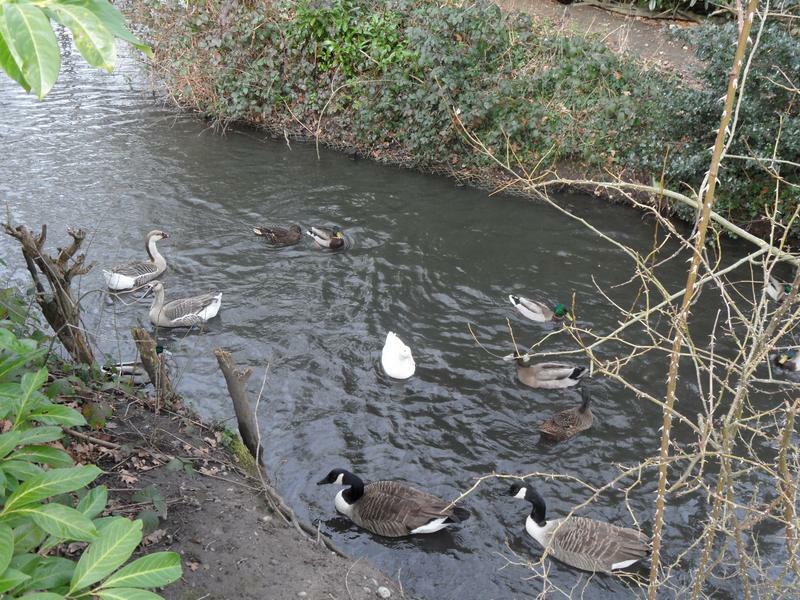 The Bean Geese are still together, but this is the last time we them both, one disappears soon afterwards, perhaps a victim of a fox. 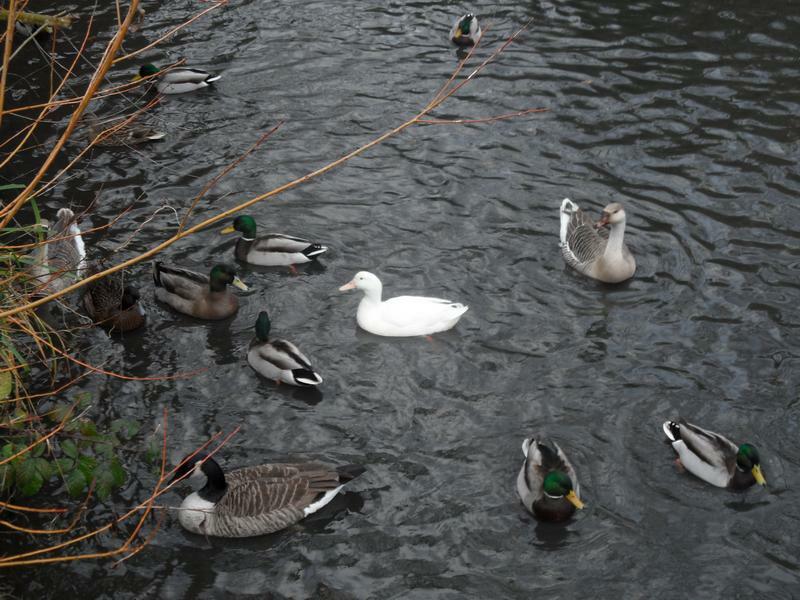 There used to be three White Mallards, now only one as well. 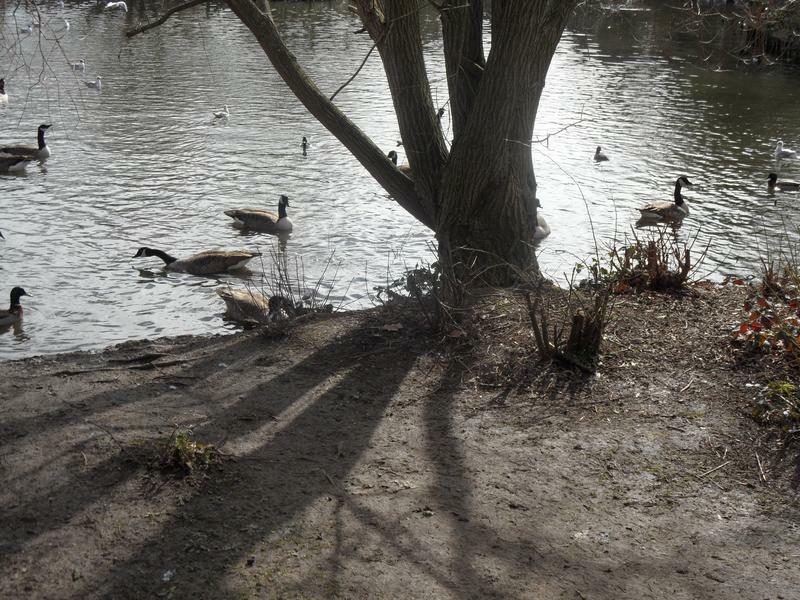 1st March 2015, just one Bean Goose behind the Canada Geese. 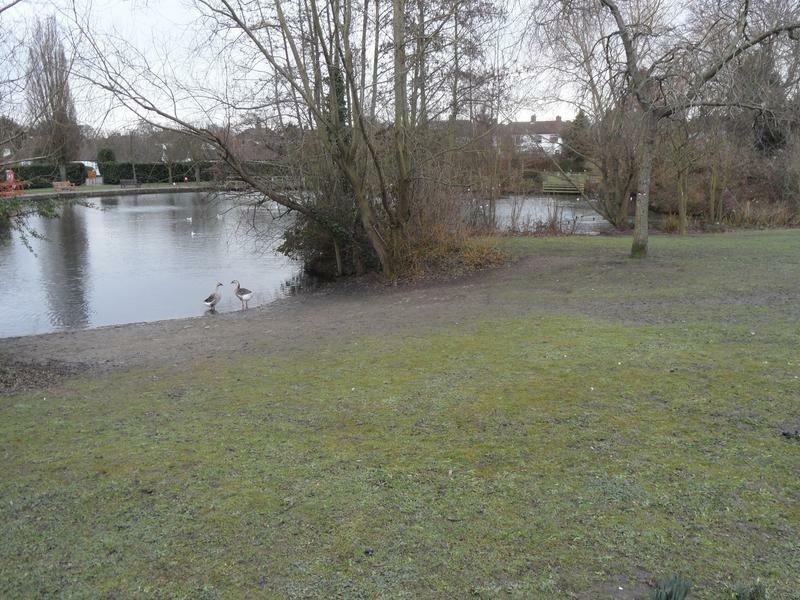 8th March 2015, fewer gulls here now. 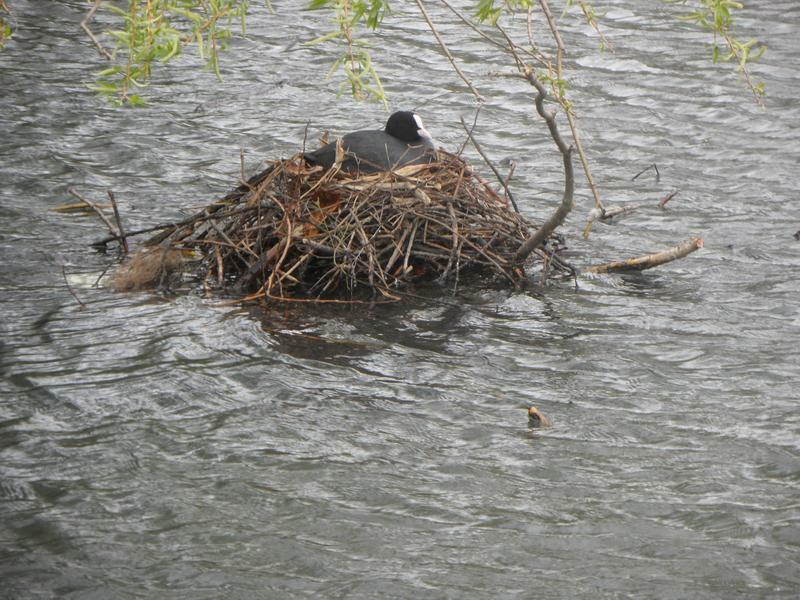 The first Coot nest on the small island. 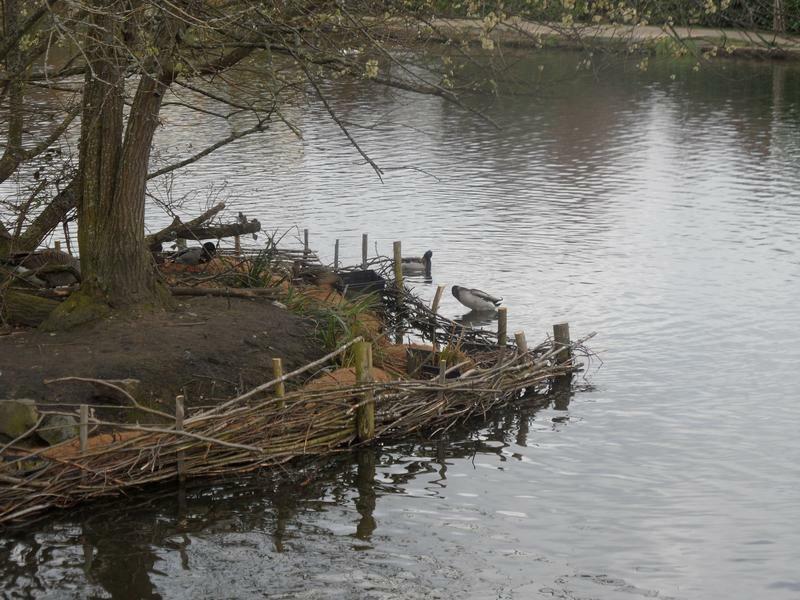 Not sure how that plastic crate got inside the new island fence. 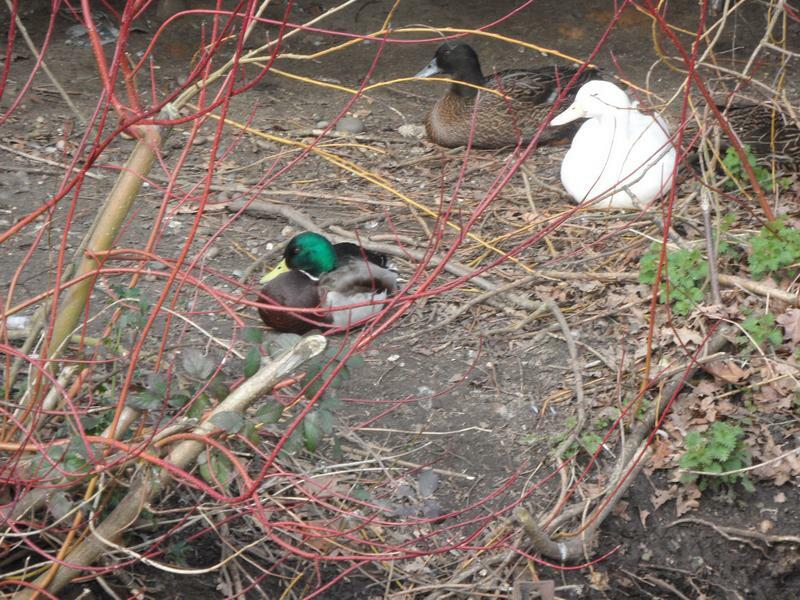 Three Mallards resting on the large island, no nesting yet. 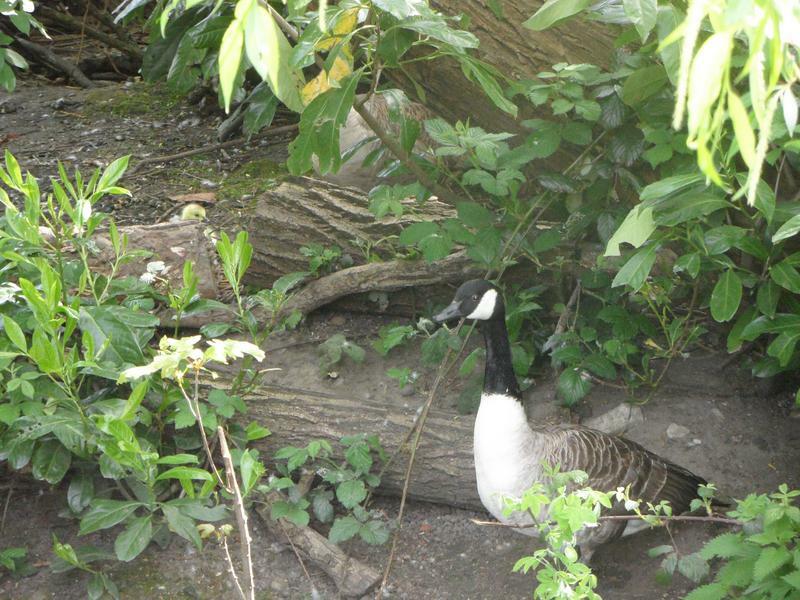 The one remaining Bean Goose. 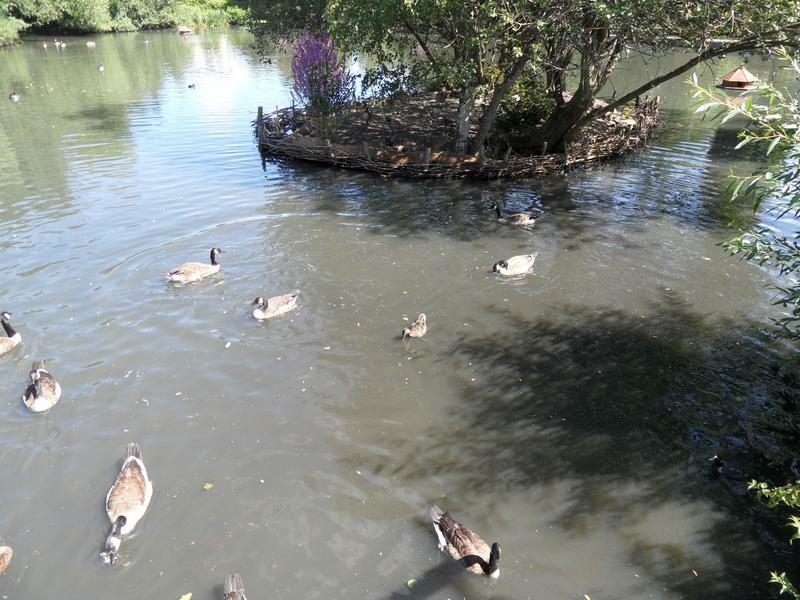 The far side of the pond. 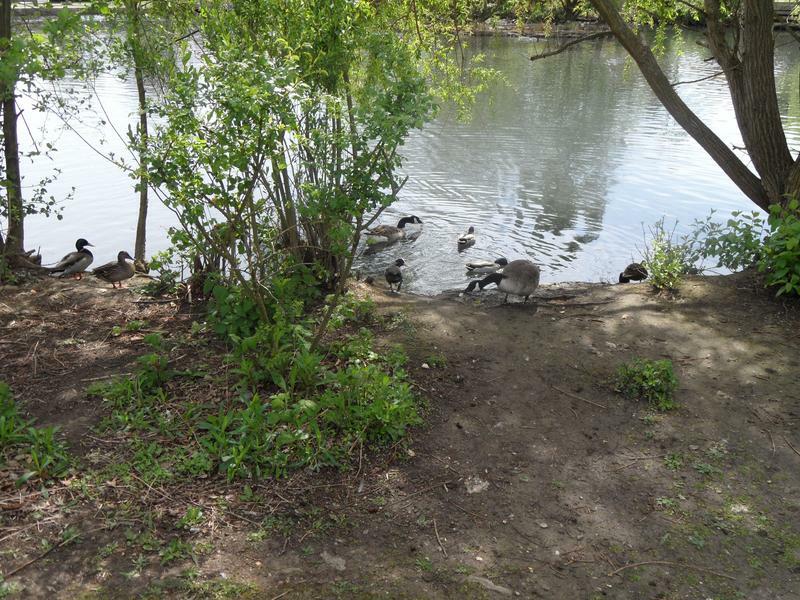 29th March 2015, hungry ducks and geese following us along the path. 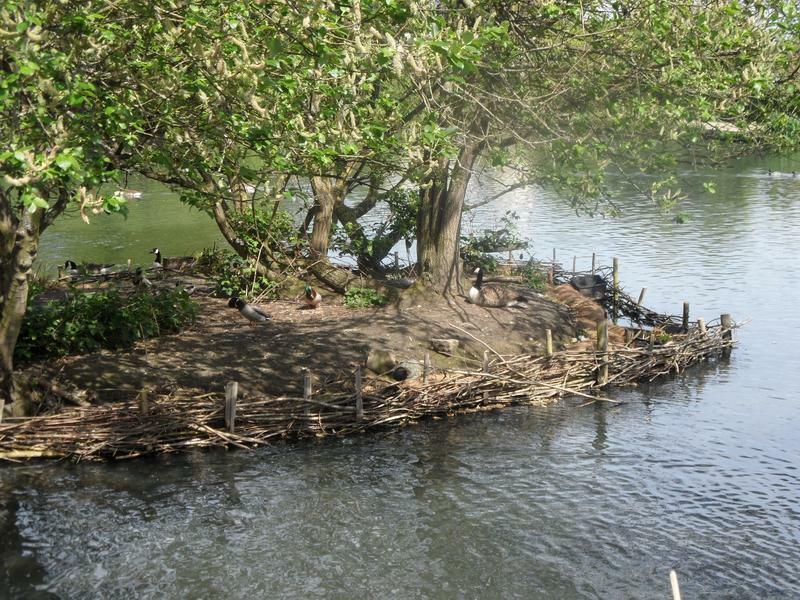 The path at this end of the pond has been closed for repair all winter but has finally been completed and re-opened. 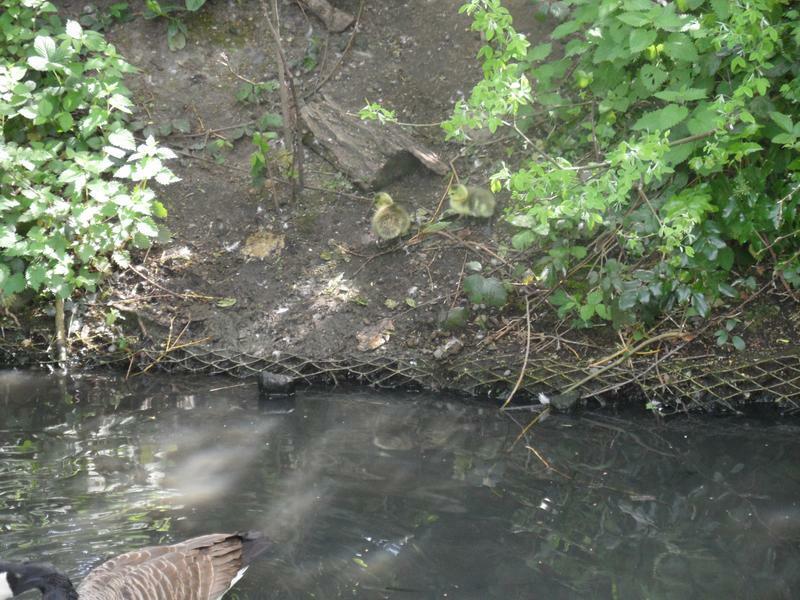 The Bean Goose showing pink feet. 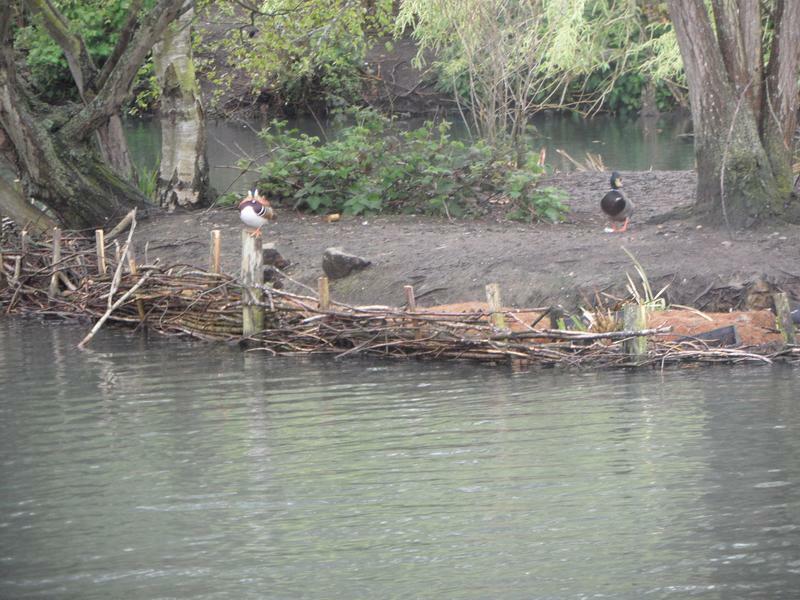 Sacks or rolls of something have been placed Inside the new fence around the island presumably to help stop erosion of the island. 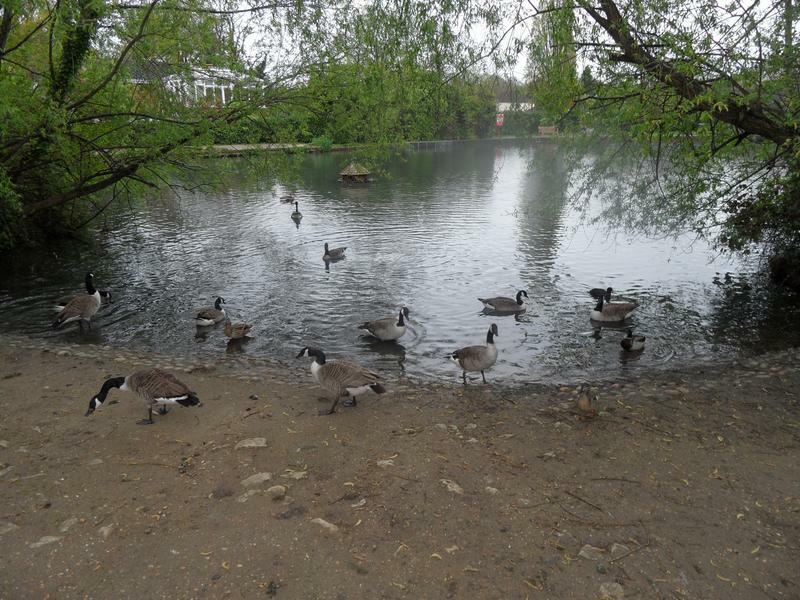 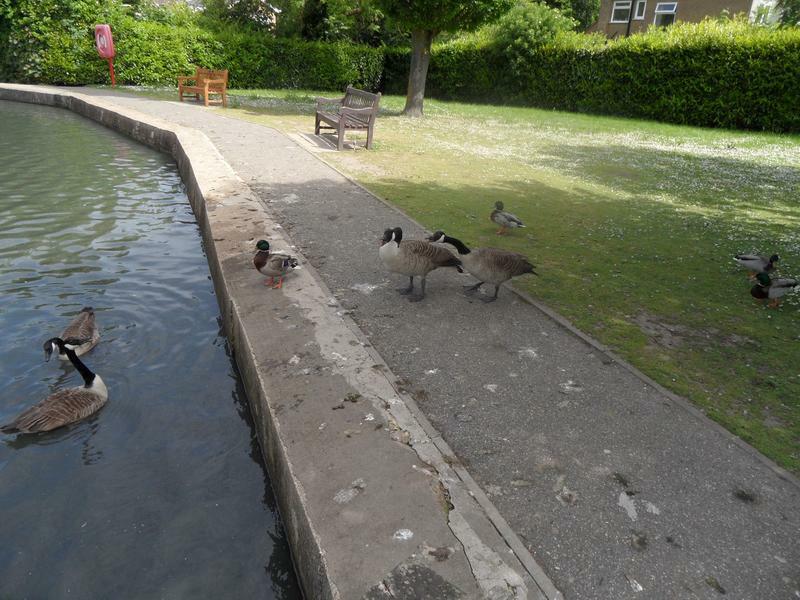 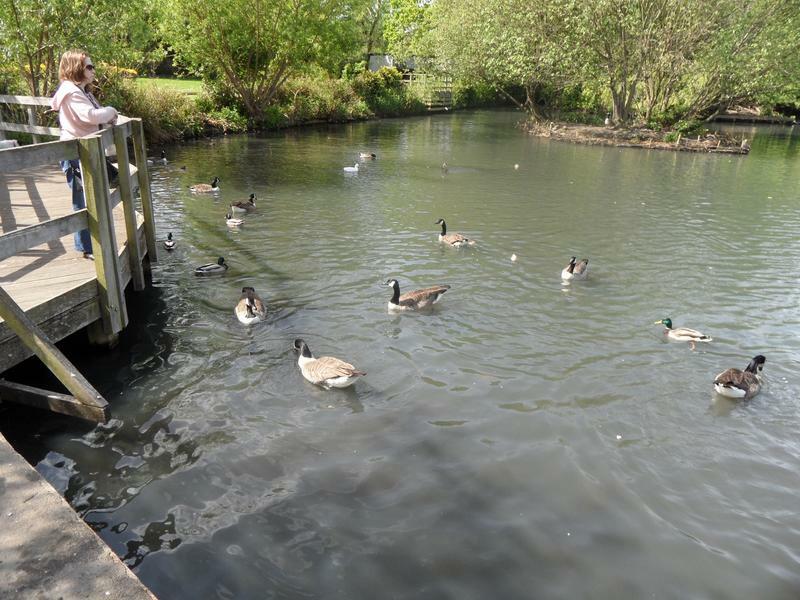 5th April 2015, several geese and ducks waiting for food. 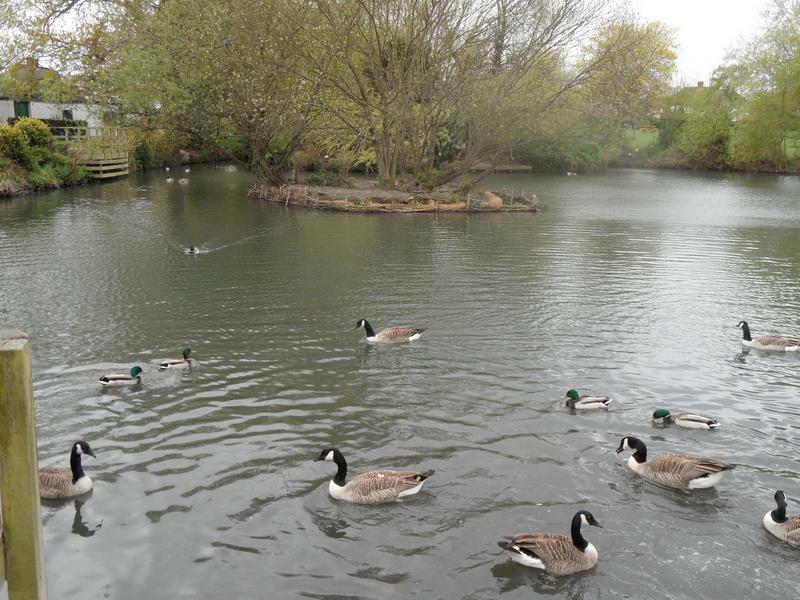 The pond is quiet today. 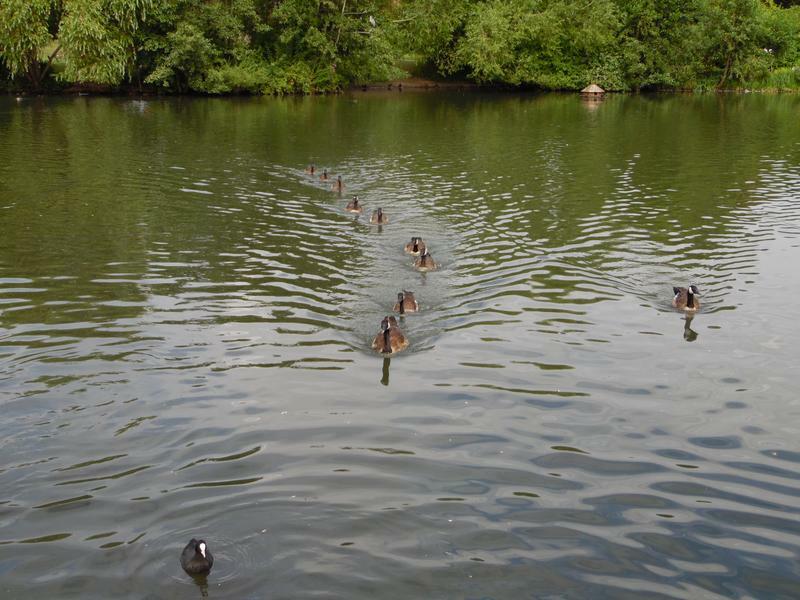 Ducks and geese heading our way for food. 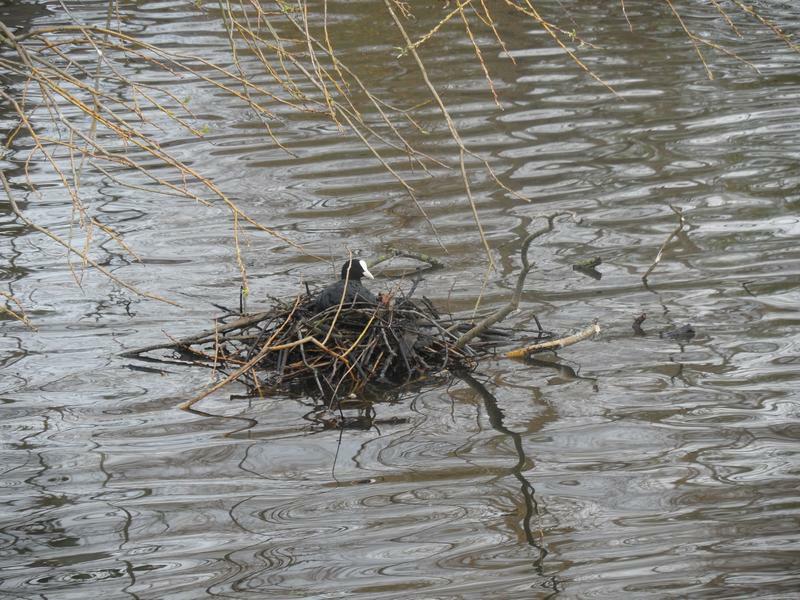 A massive Coot nest, at least two feet high since it's built on the pond bottom. 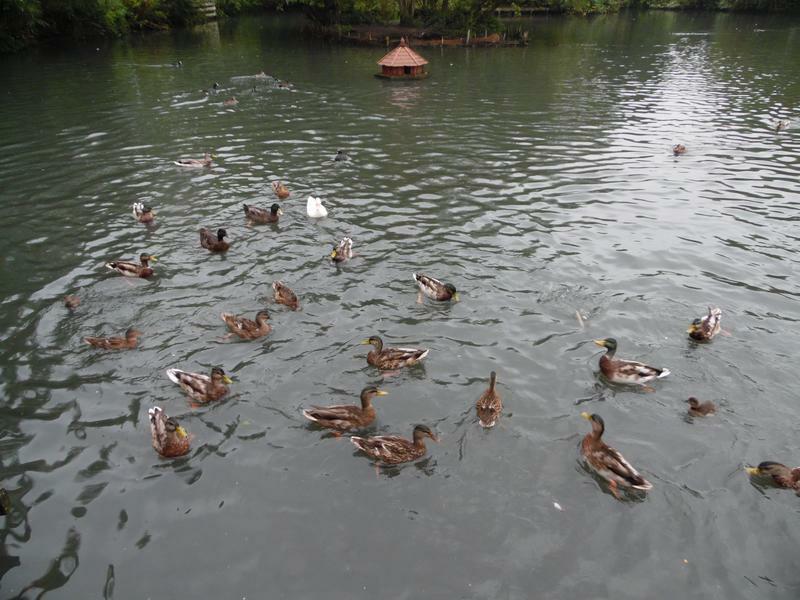 Various ducks sitting on the small island. 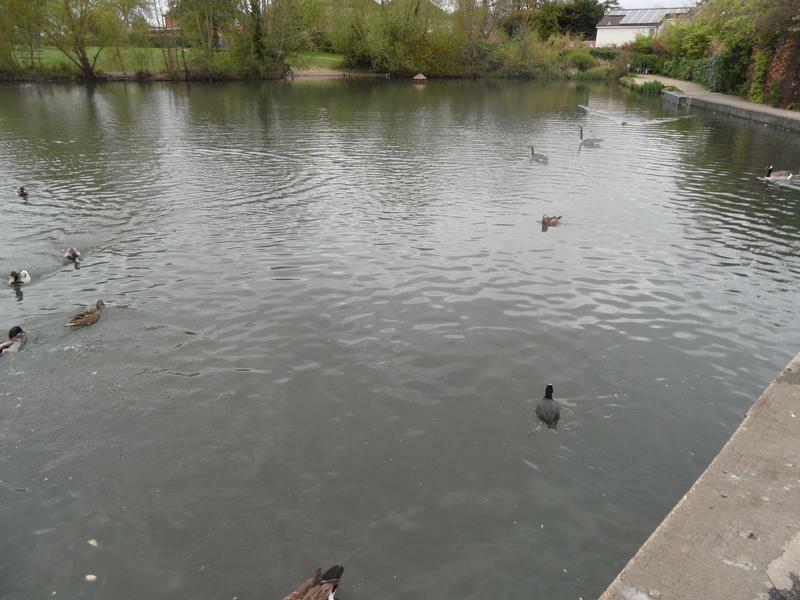 19th April 2015, quiet again, at least all the sea birds have gone for the summer. 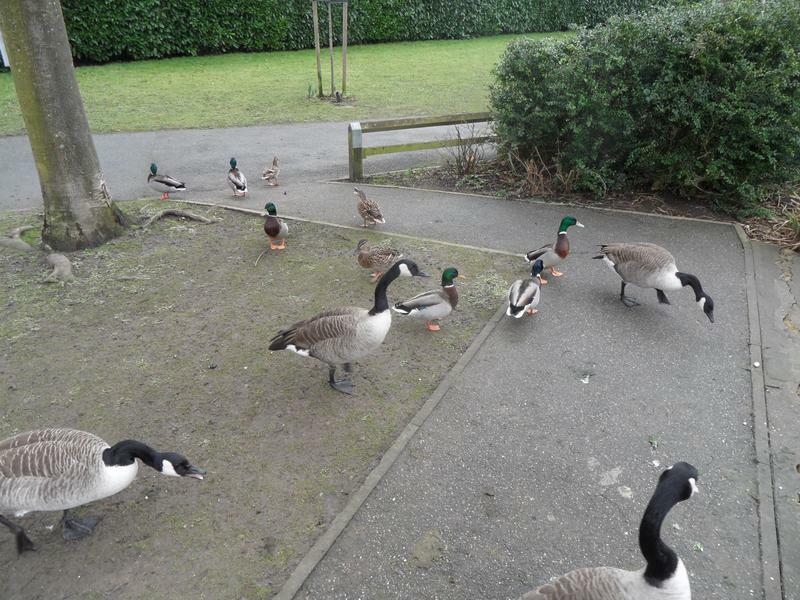 No-one is that hungry today. 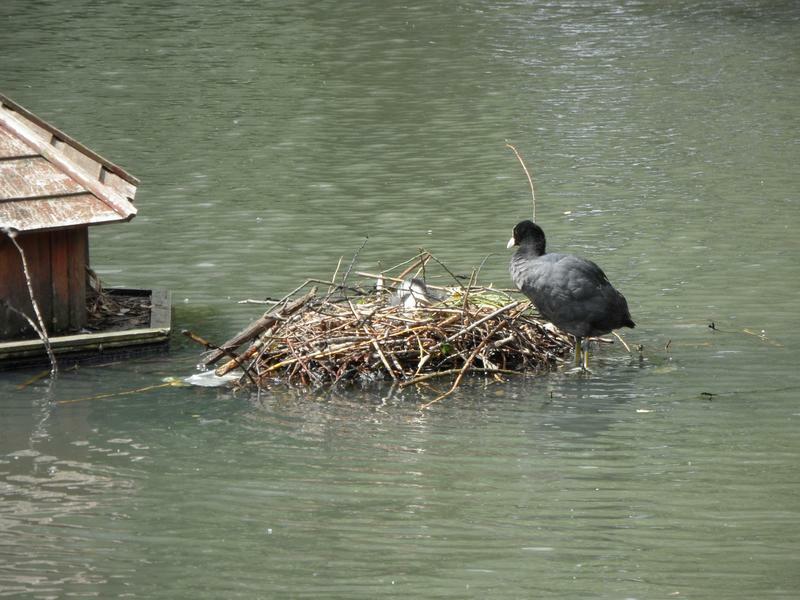 The Coot is still sitting on her eggs. 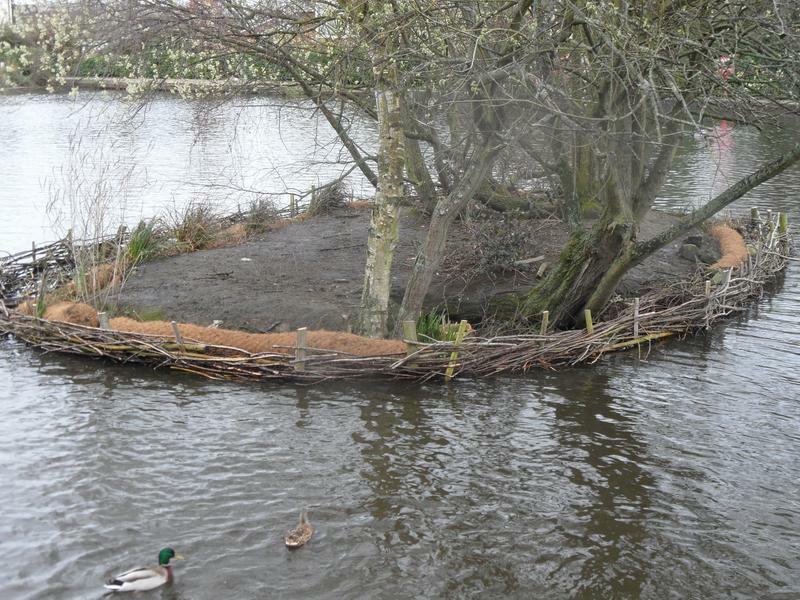 A little more activity behind the large island. 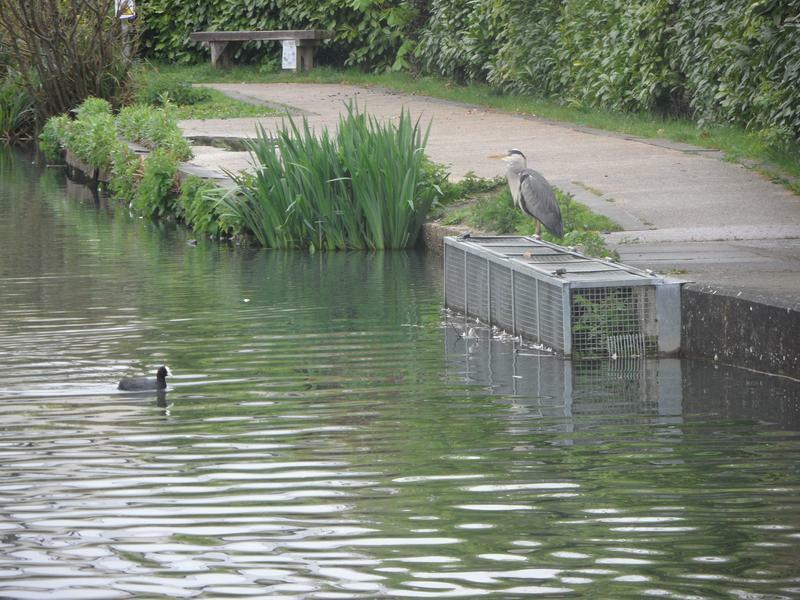 26th April 2015, don't like seeing Herons here, they eat ducklings. 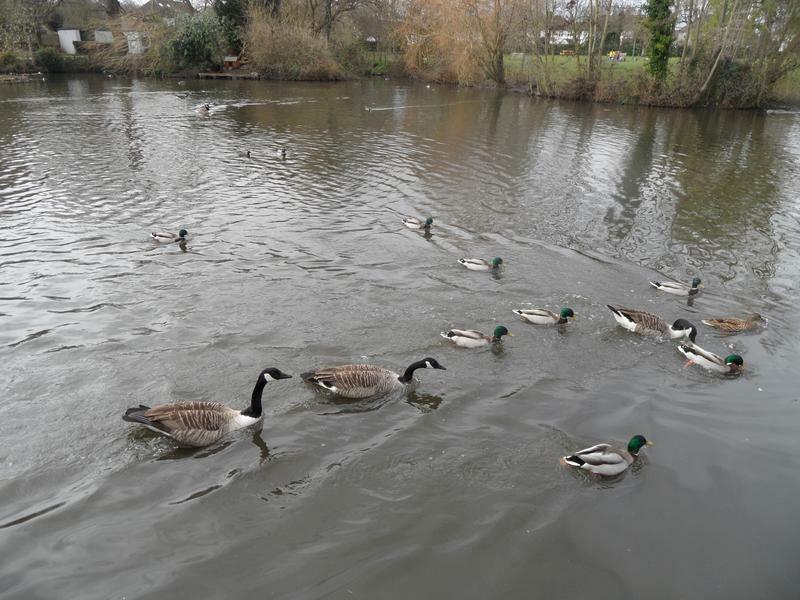 A few Mallards and Canada Geese today. 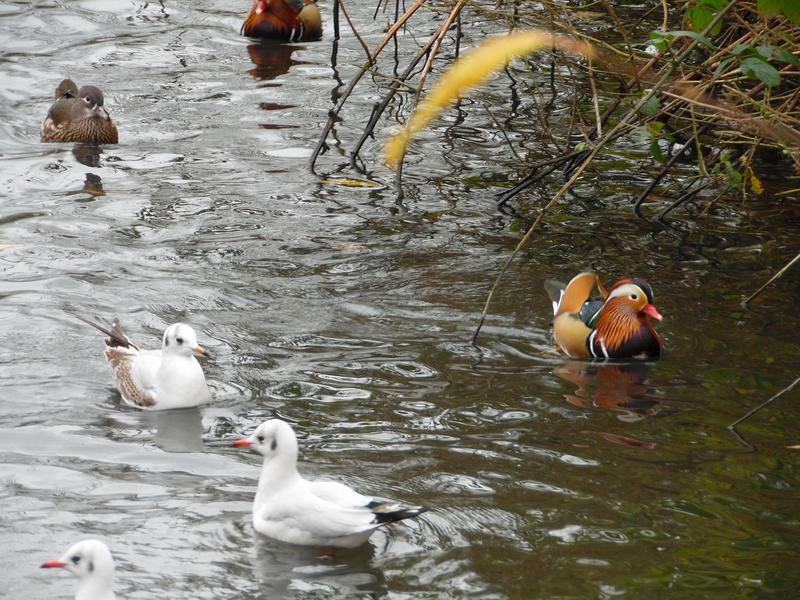 A Mandarin perched on a pole on the island. 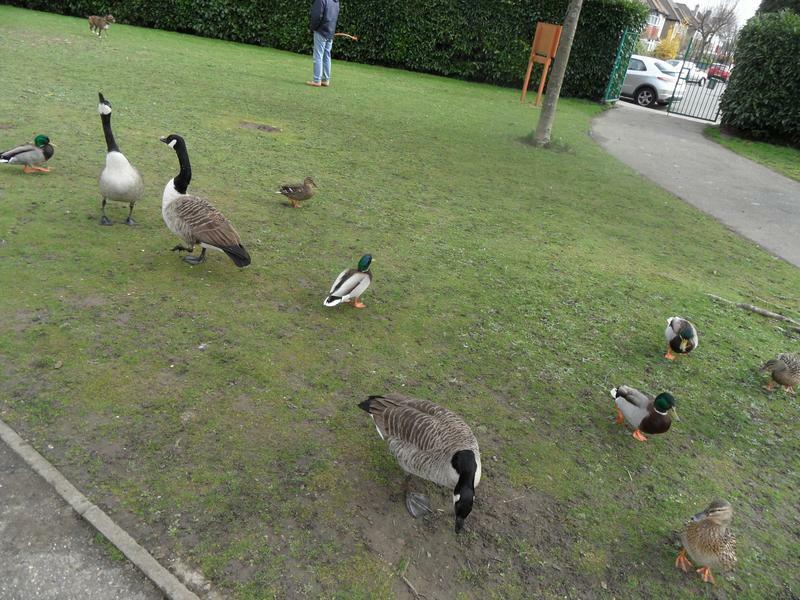 More ducks and geese on the grass. 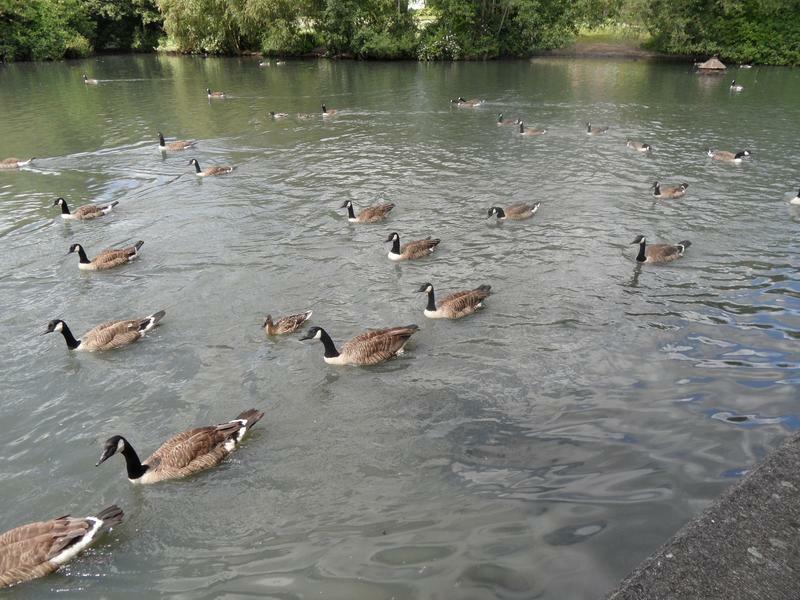 And the geese are hungry here. 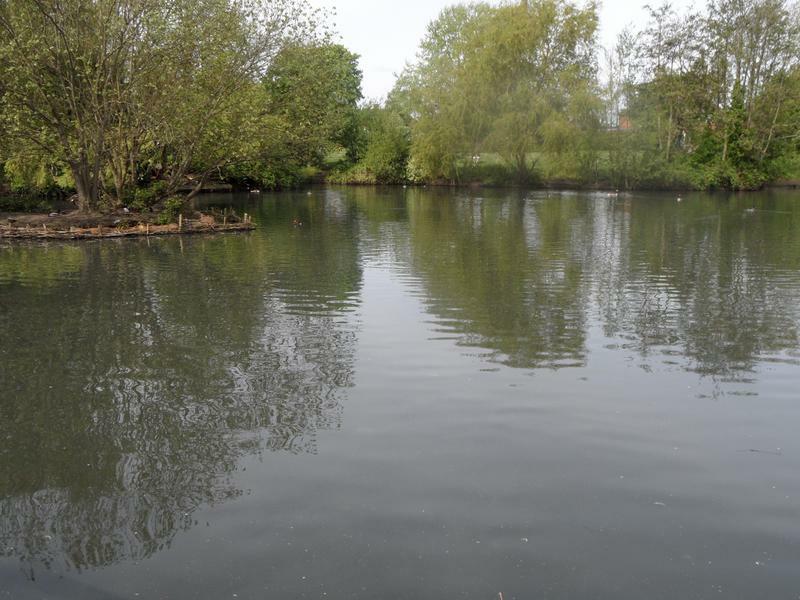 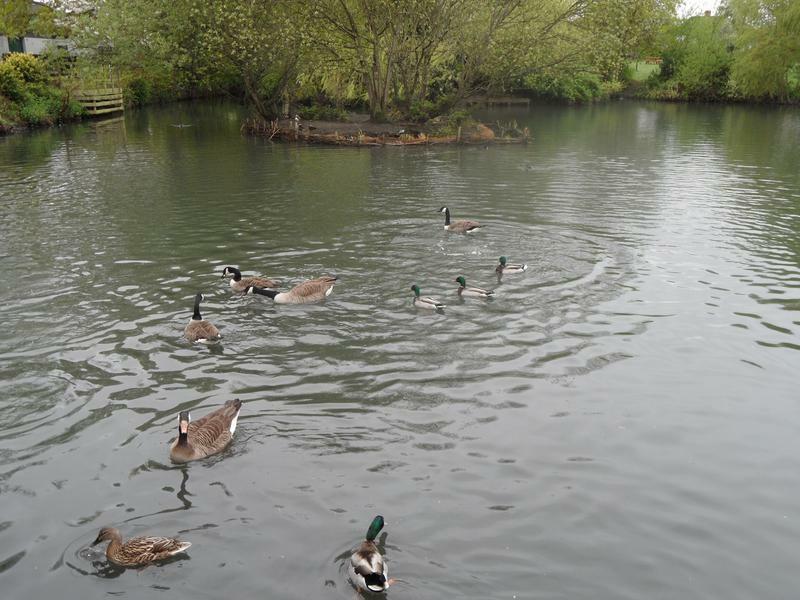 4th May 2015, don't often see the pond this quiet. 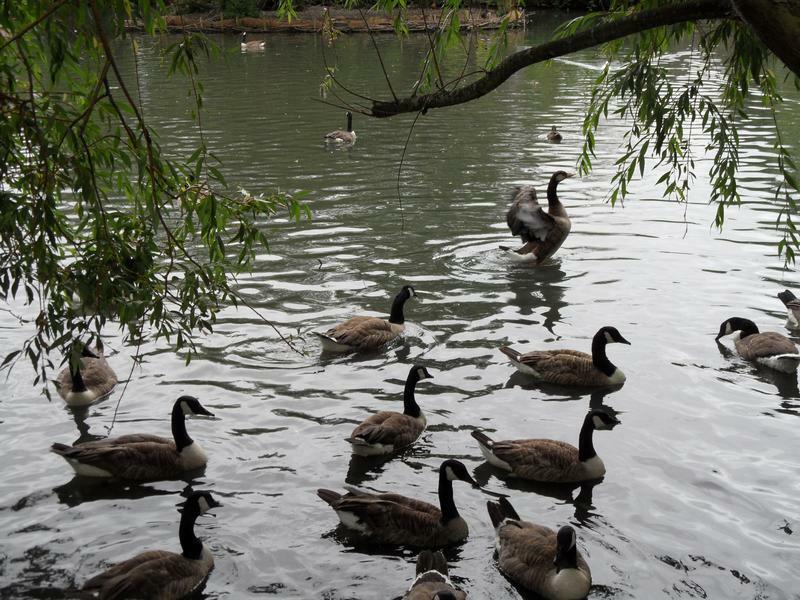 But there are ducks and geese on the far side. 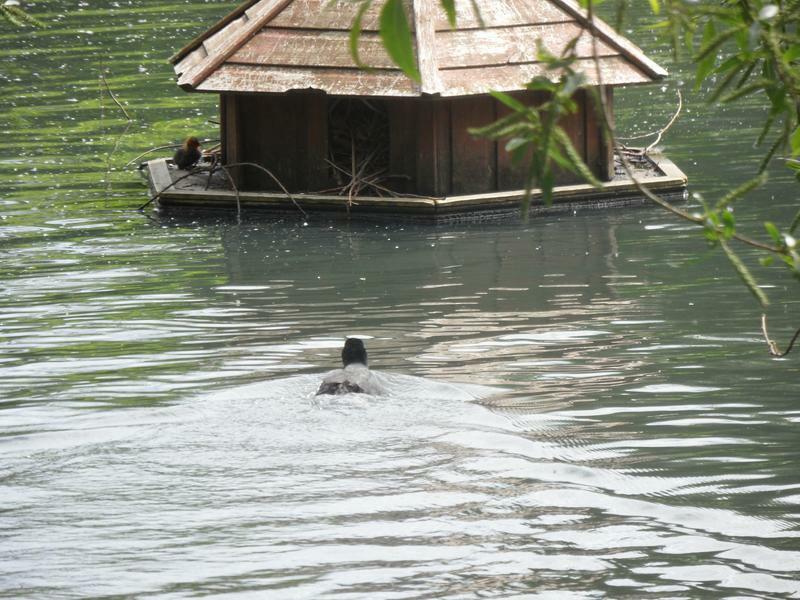 Two of them sleeping on the large island. 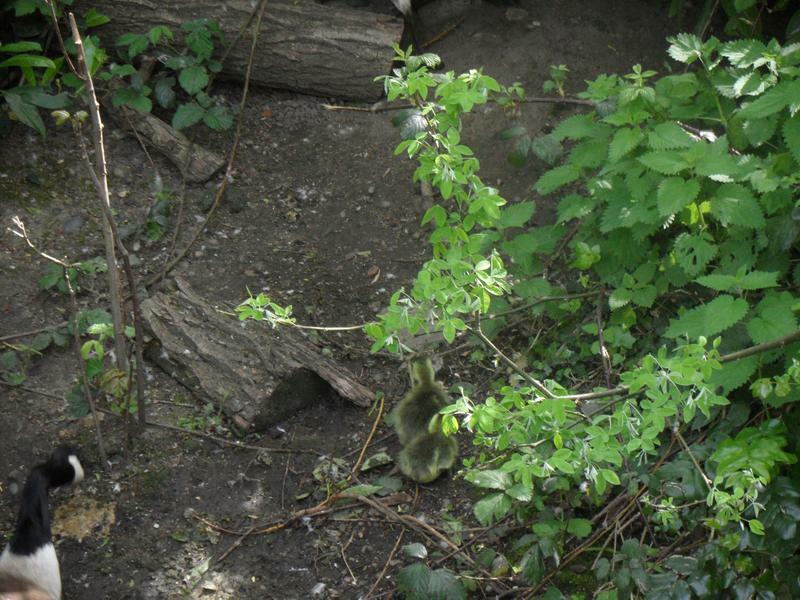 And finally the first Mallard ducklings we've seen here this year. 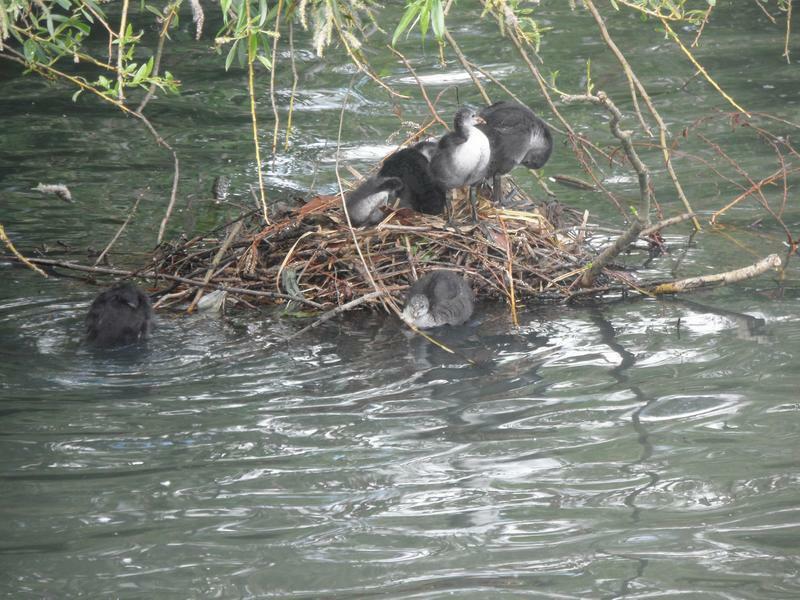 And all the nest building pays off, with a Coot family, two in the next, more on the water.. 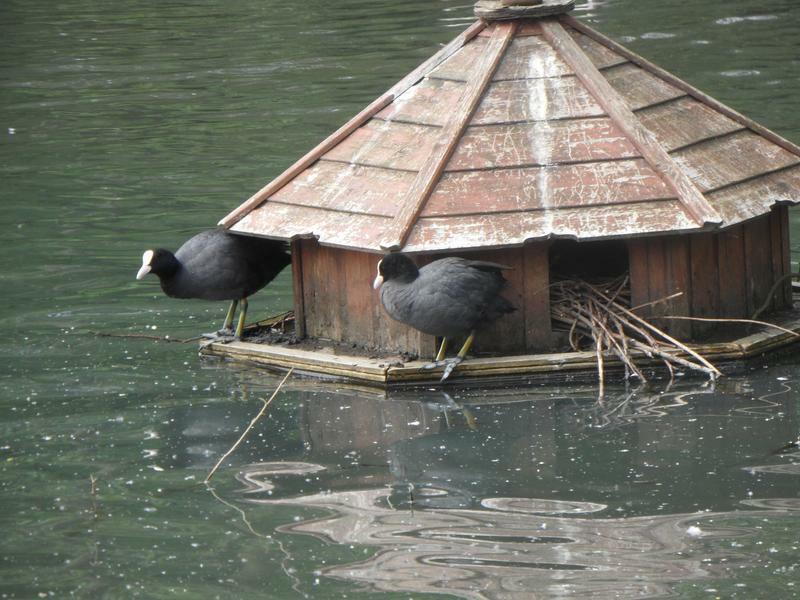 Both Coot parents share upkeep, unlike Mallards where the female does it alone. 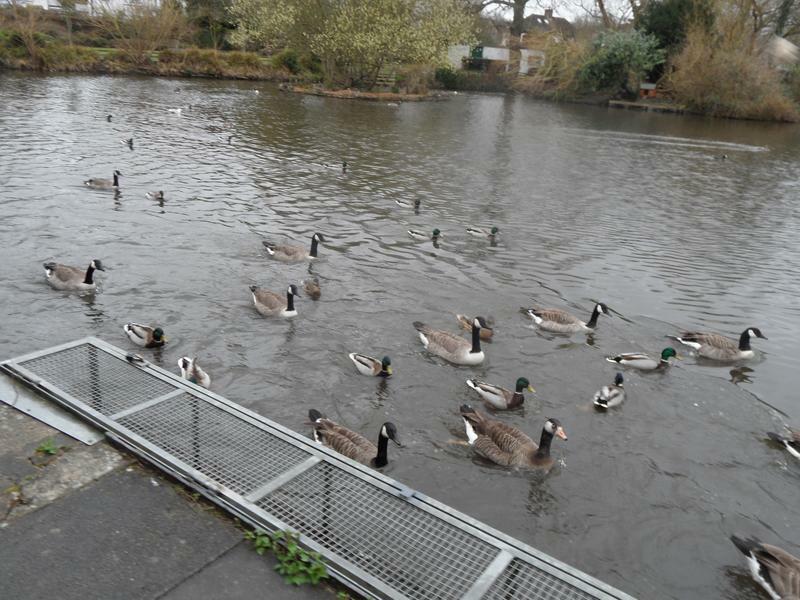 More ducks and geese than normal looking for food. 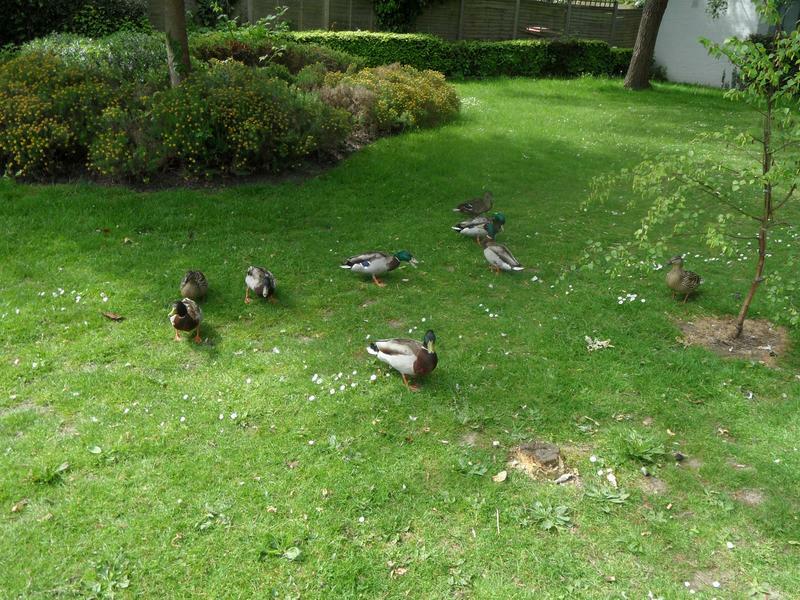 And more Mallards on the grass. 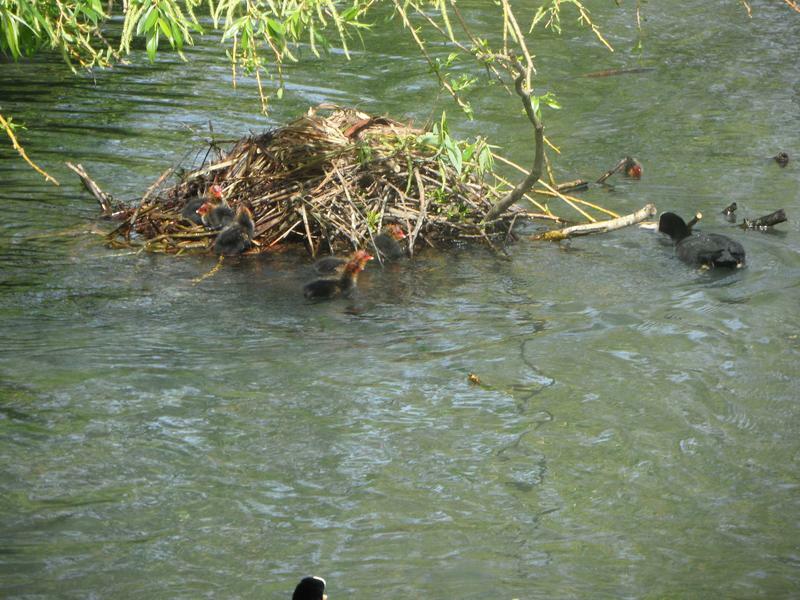 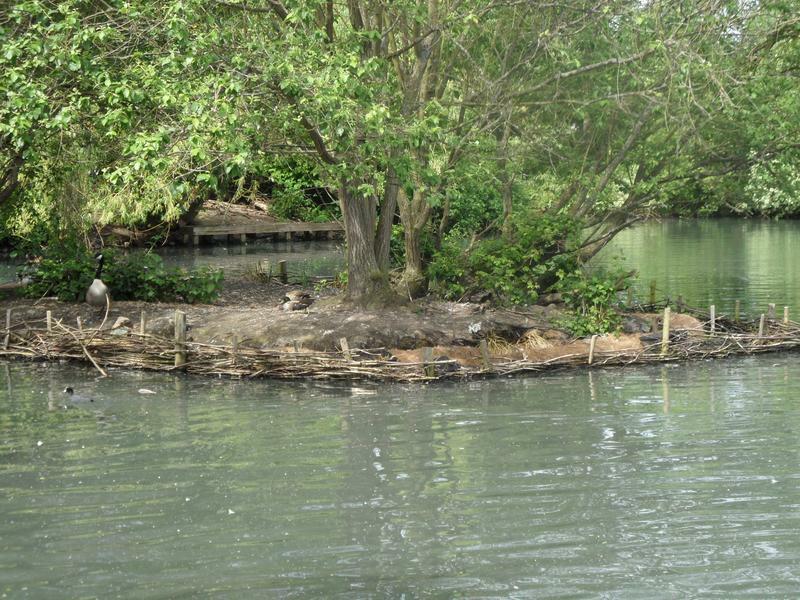 The Moorhens seem to have a nest on the small island, they can just be seen in the foreground. 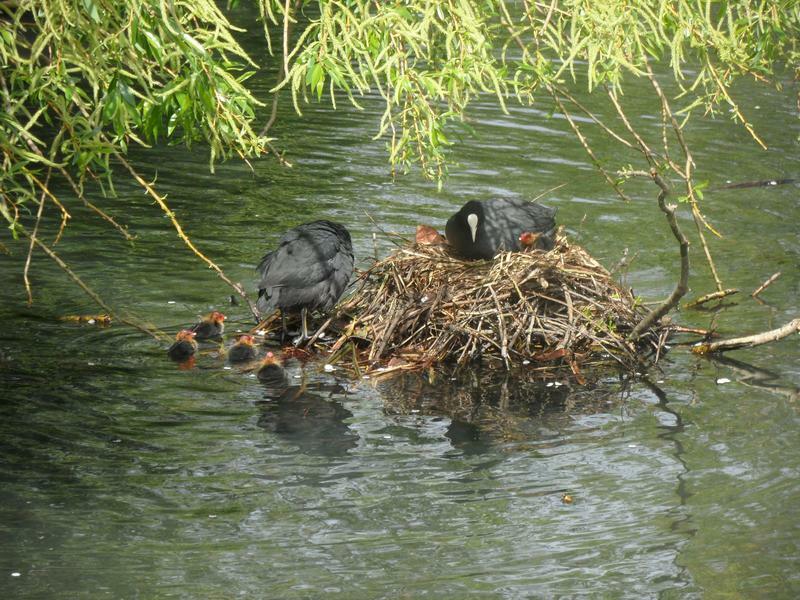 The Coot family is a week older. 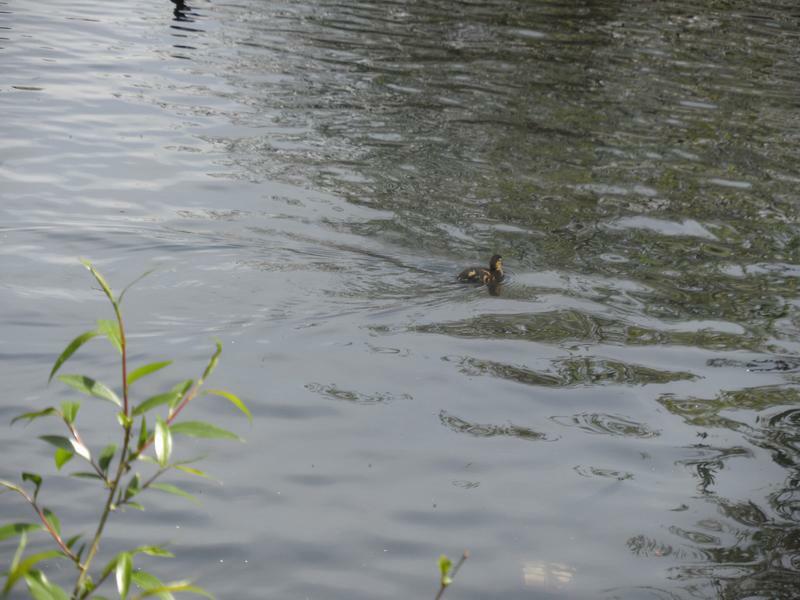 And the Mallard duckling is still swimming around on it's own. 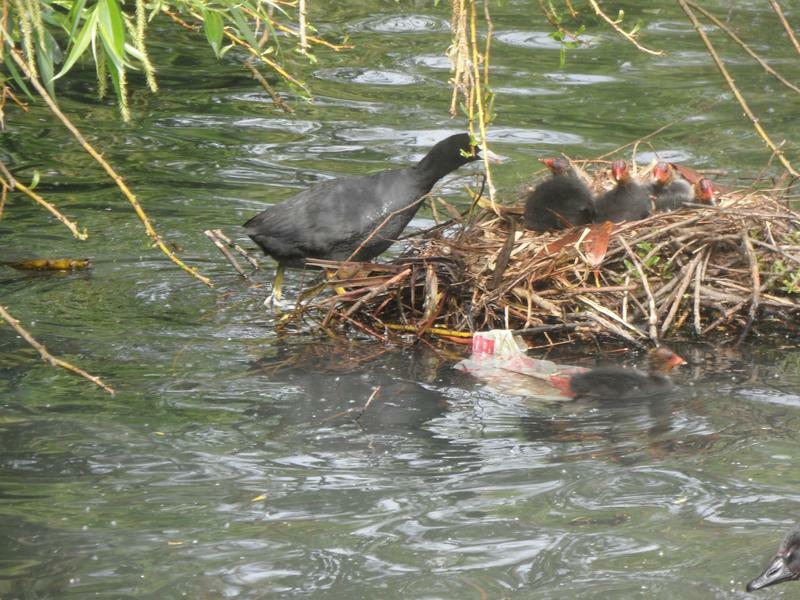 Coot mother feeding a ducKling. 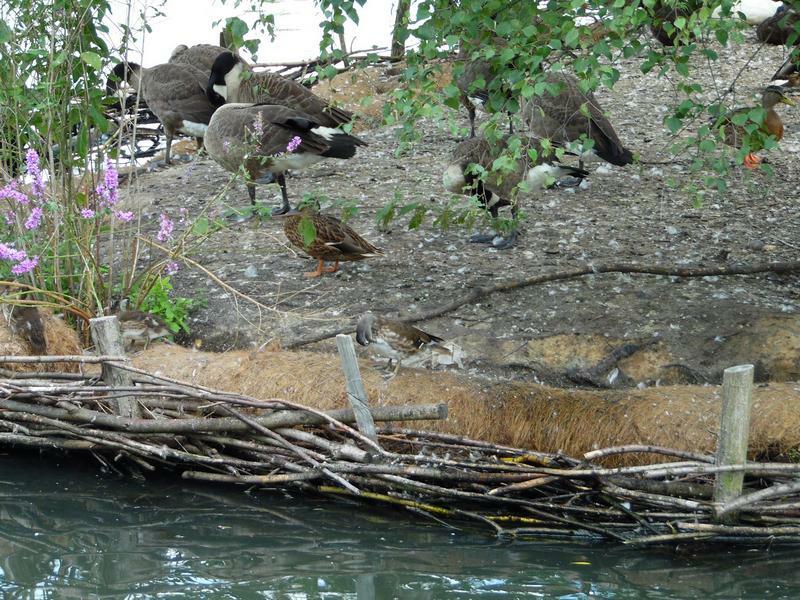 Behind the large island, we find a Canada Goose family, probably hatched overnight, one gosling looking over the log. 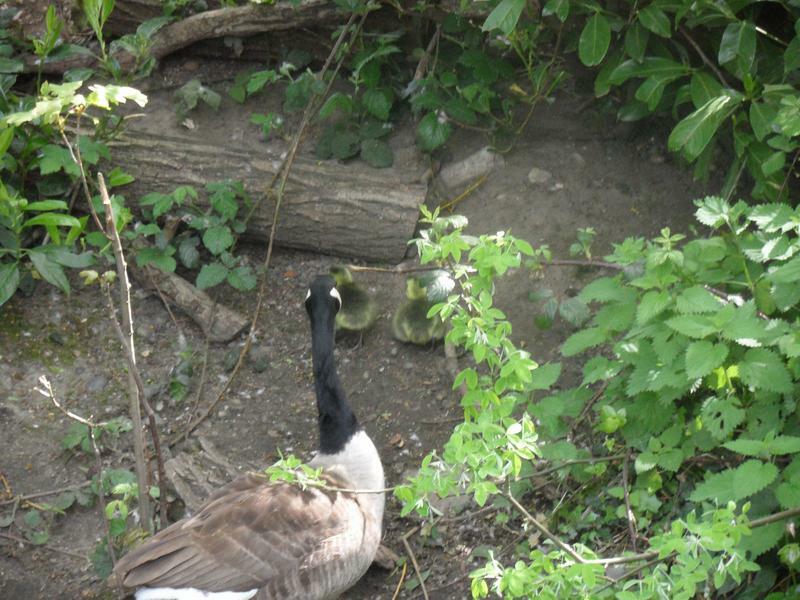 The goslings come part way down the bank, but then turn around. 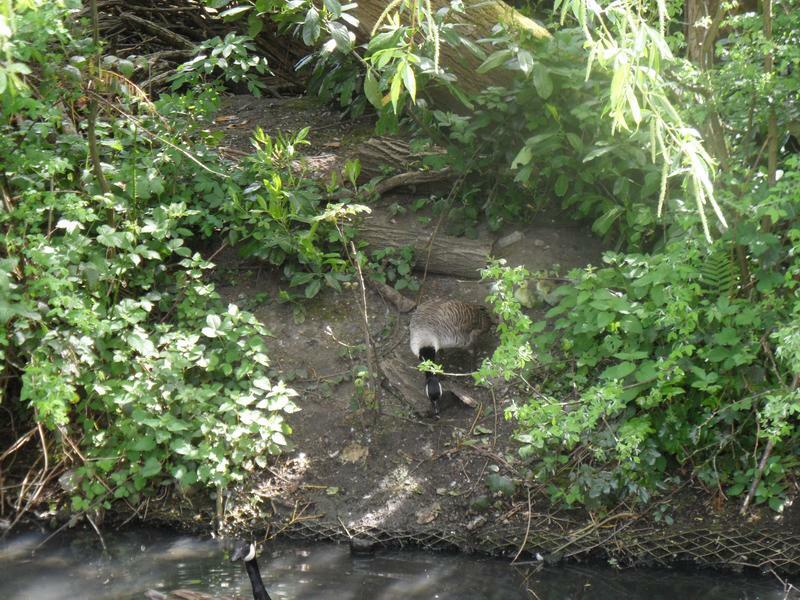 And scurry back up to the logs. 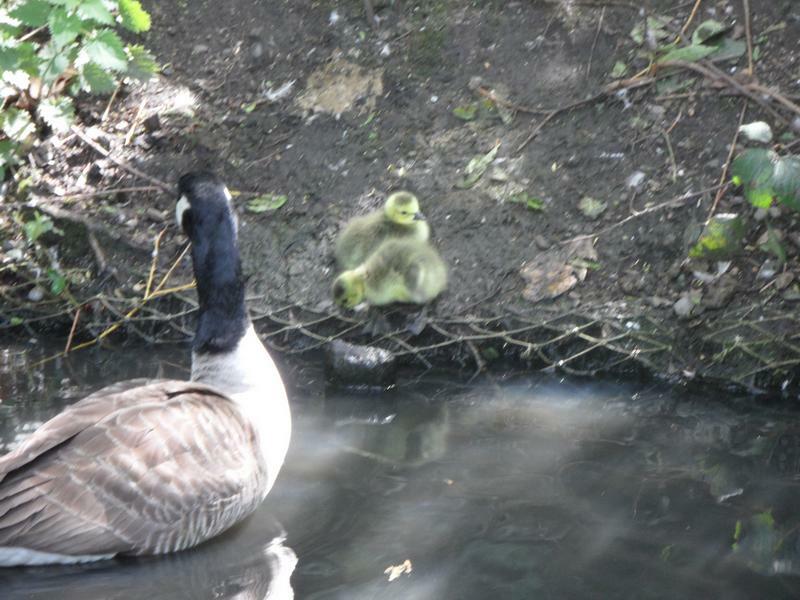 Mother takes to the water hoping the goslings will follow. 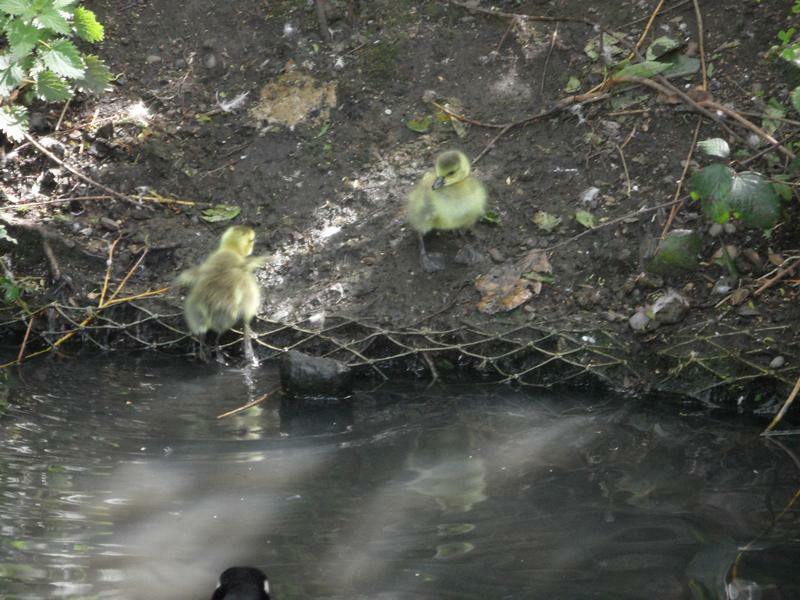 One gosling gets in the water, and straight out again. 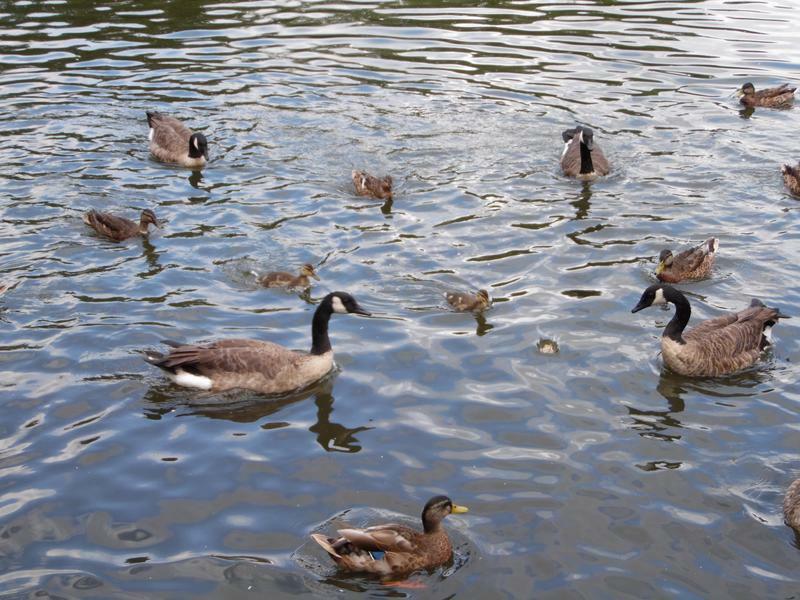 And no amount of attention will get them back in the water. 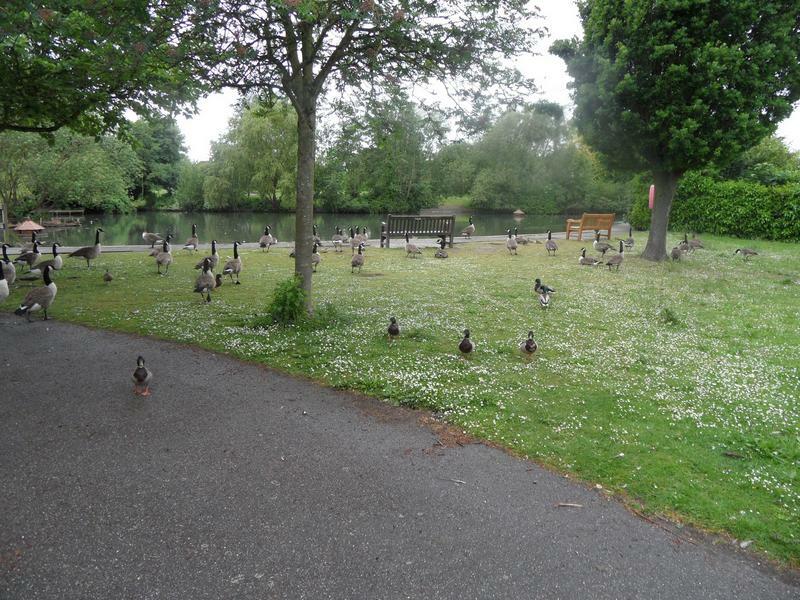 24th May 2015, reasonably quiet today, a few birds on the grass. 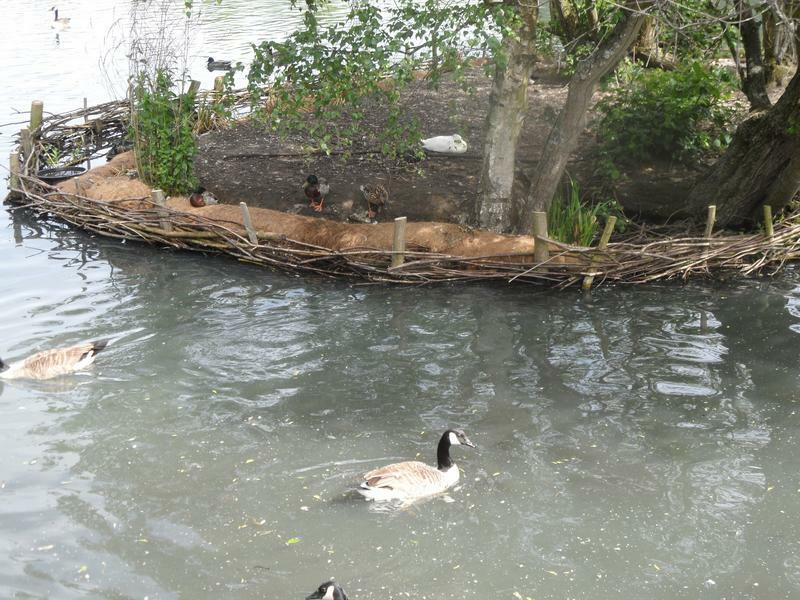 A few more on the small island. 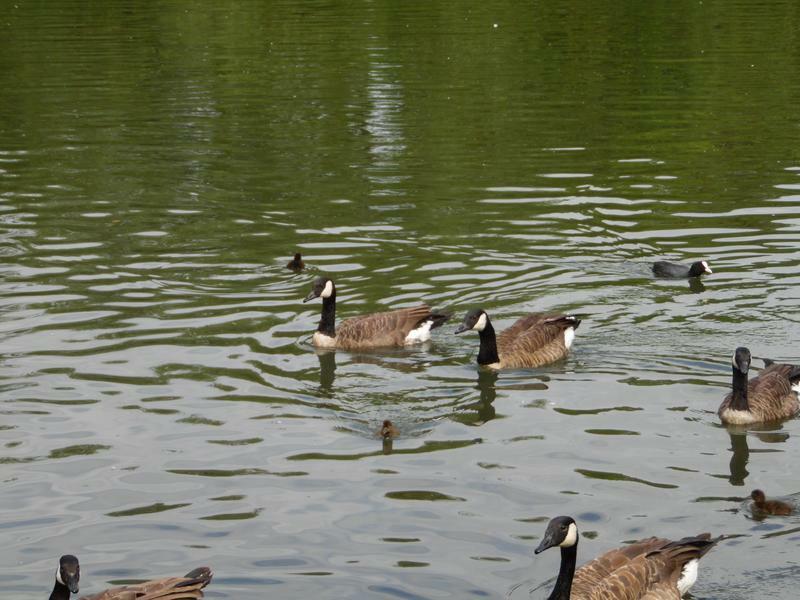 Canada Geese chasing each other around. 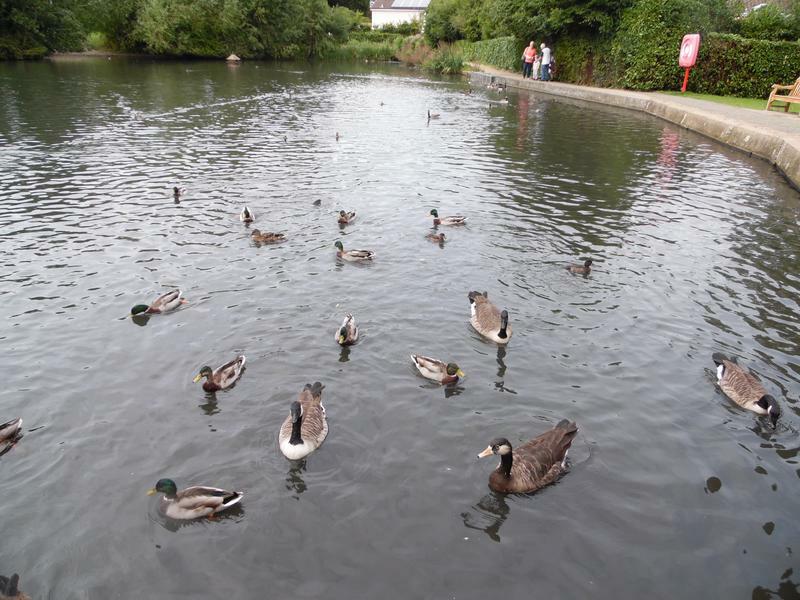 But more birds are spread variously around the park, rather than being on the water. 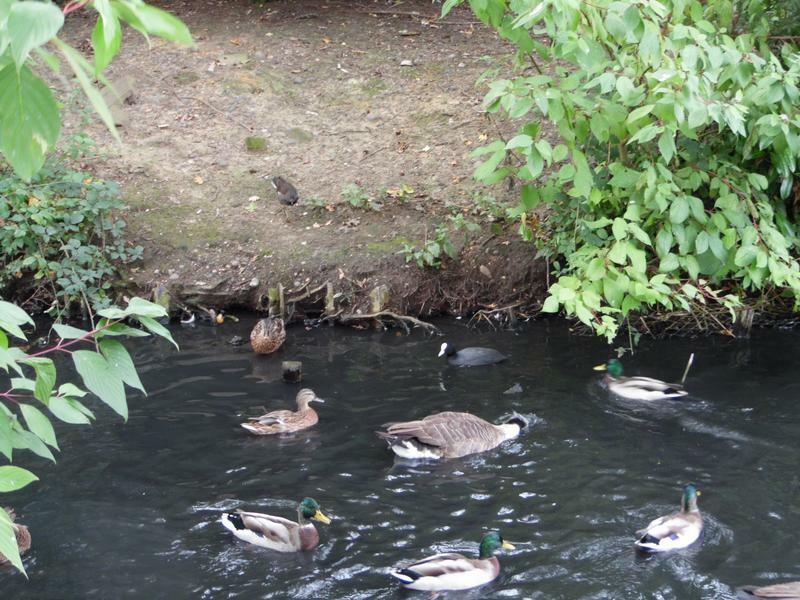 Some ducks are watching the water from a distance. 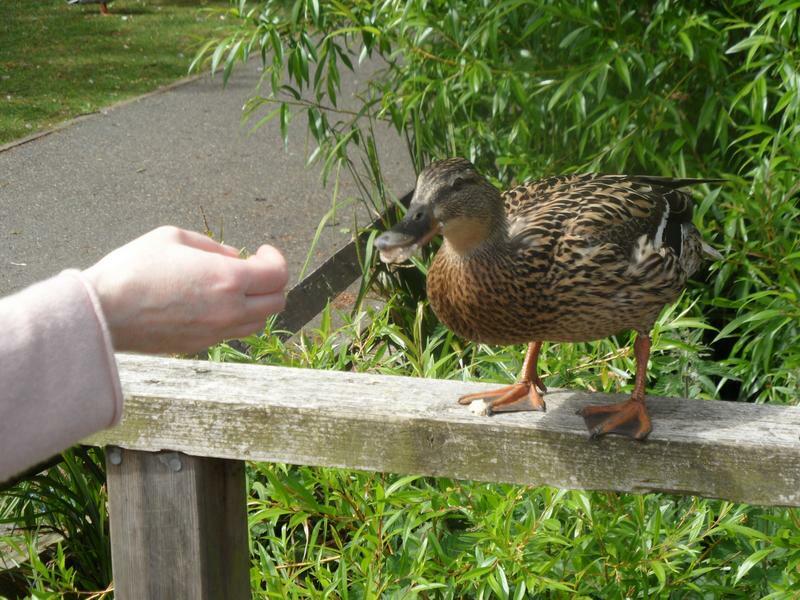 Not often Mallards take food from the hand. 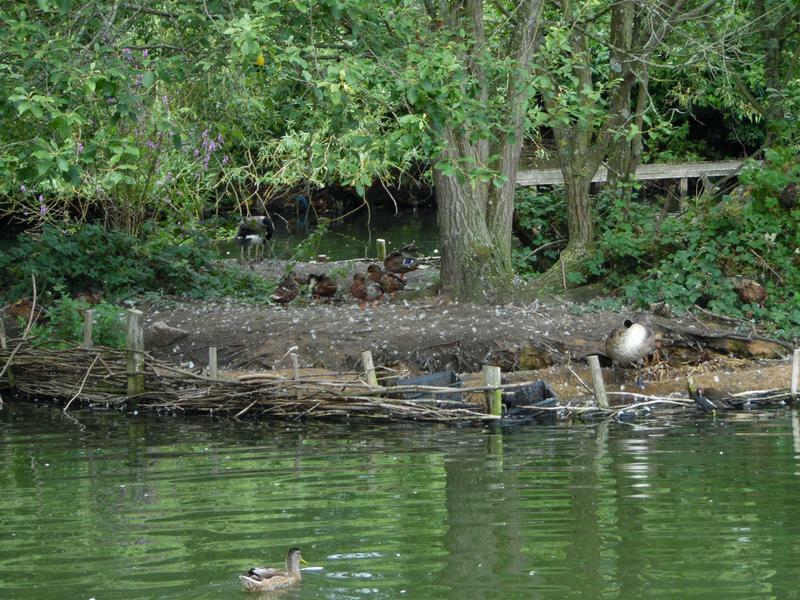 More ducks sleeping on the small island. 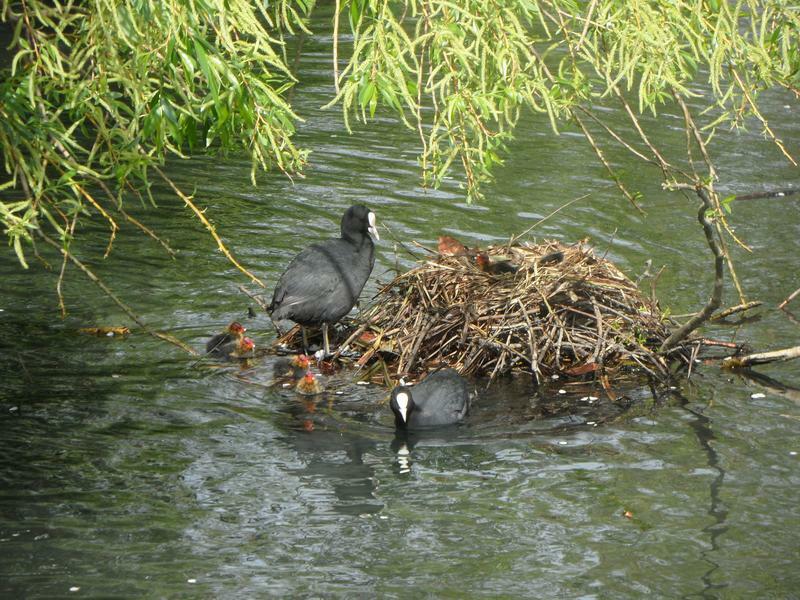 The Coot family is still in the nest, being fed by mother. 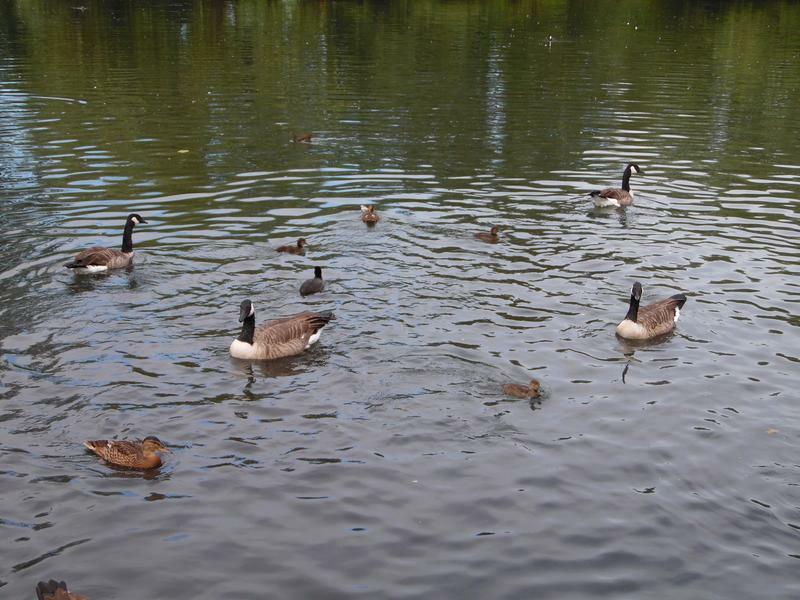 Usually find Canada Geese swimming towards use, not away. 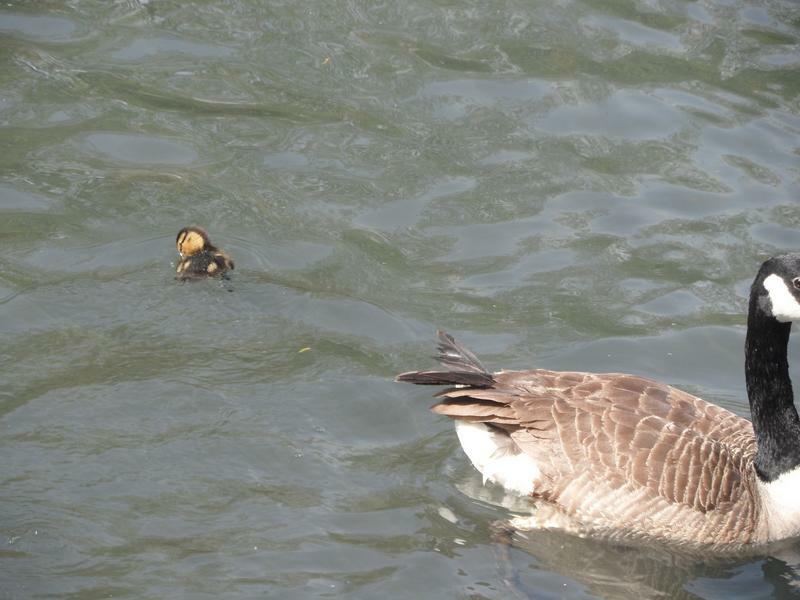 Large enough to eat bread on their own, but the goslings stay close to the parents. 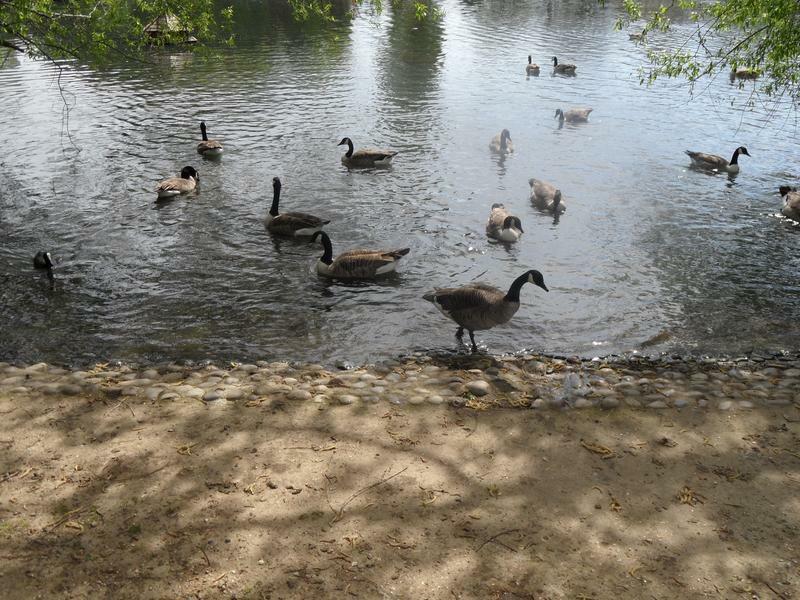 Heading toward the water for a drink. 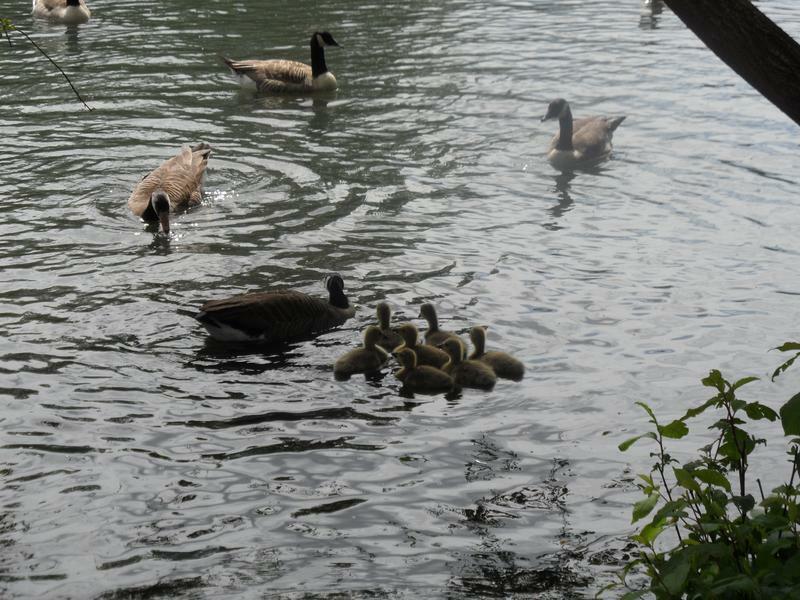 The seven goslings still stay close together for safety. 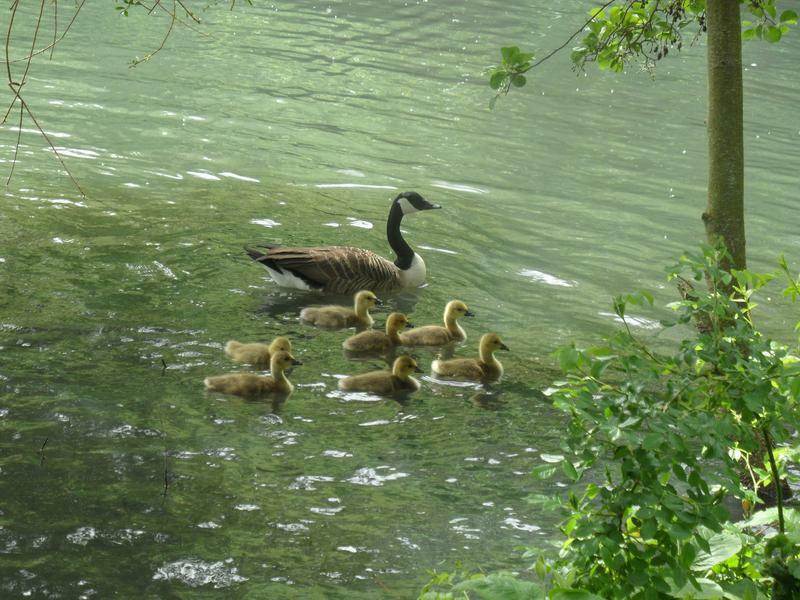 Finally the family swims off to the island. 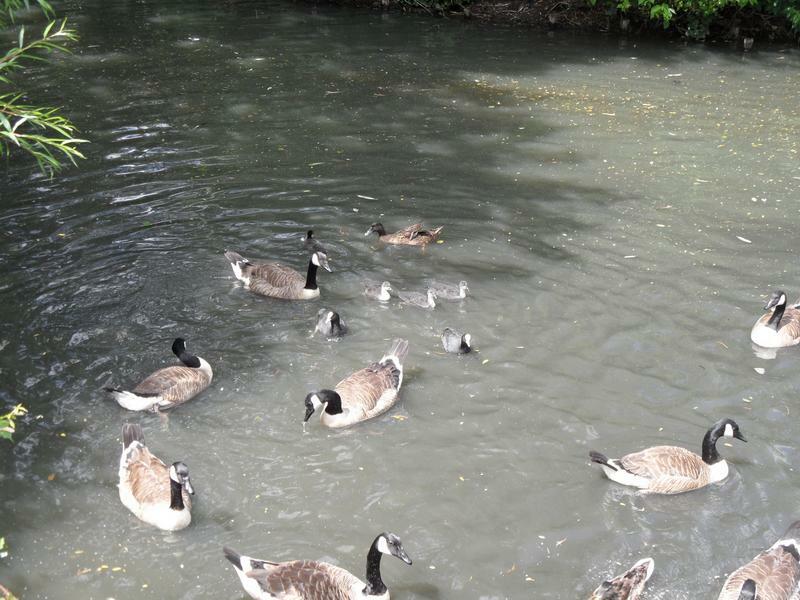 for mother to return with food. 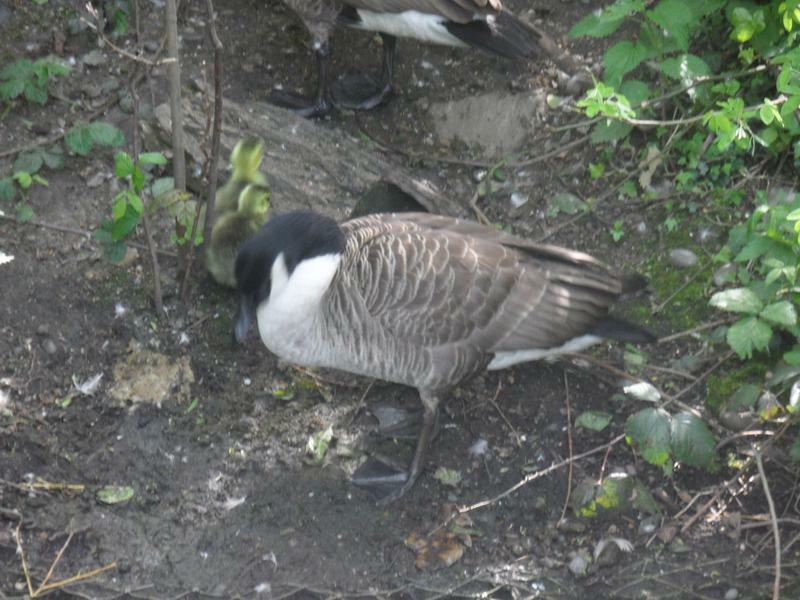 Both parents, chicks must be inside, which looks crowded due to all the bedding. 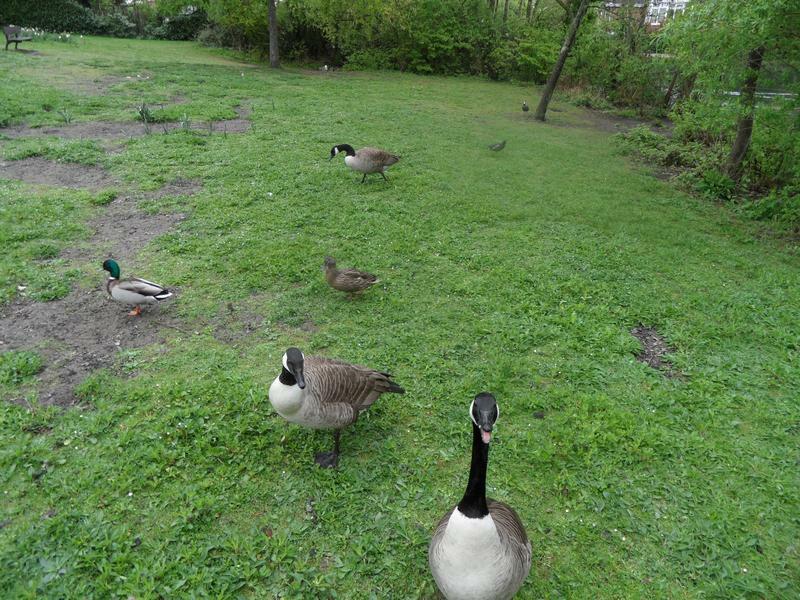 grass here, or jumps up when the see food on the way. 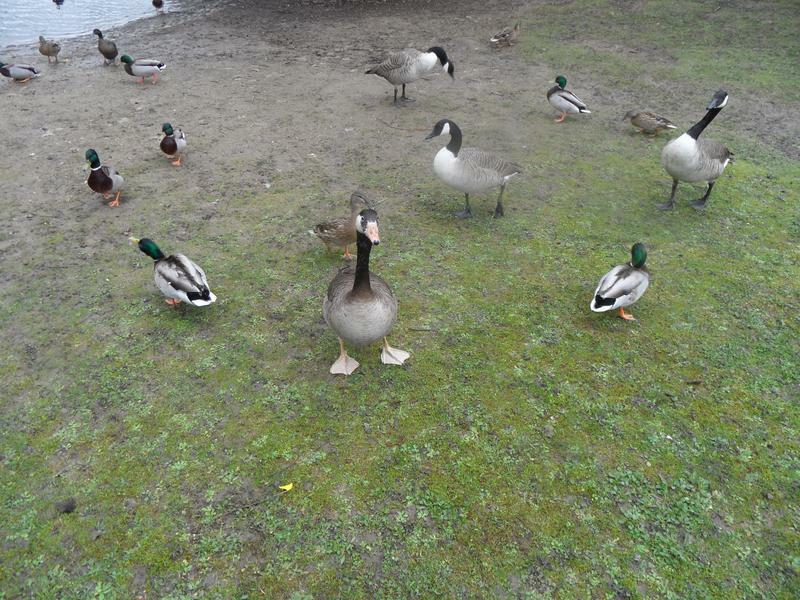 Cold wet day, so not many park visitors, maybe why they are hungr. 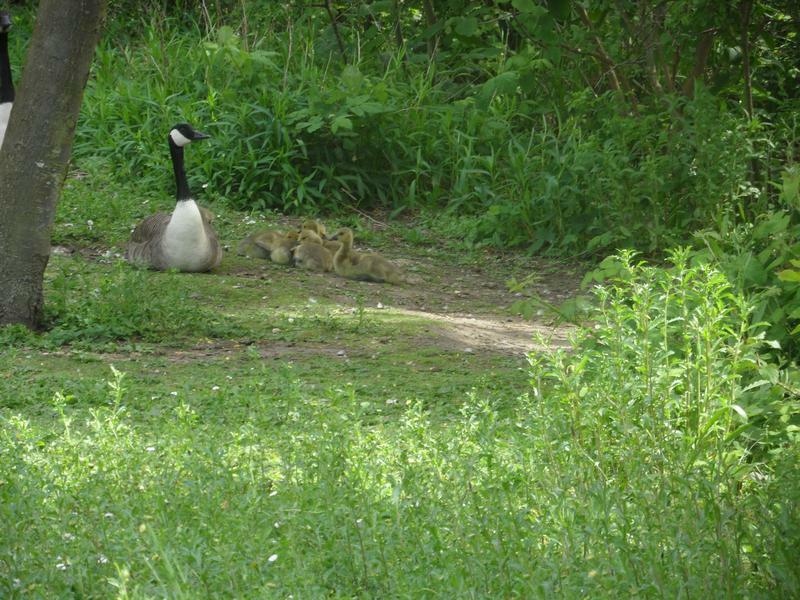 The birds include the Canada Goose goslings, now three weeks old, and behaving more independently now. 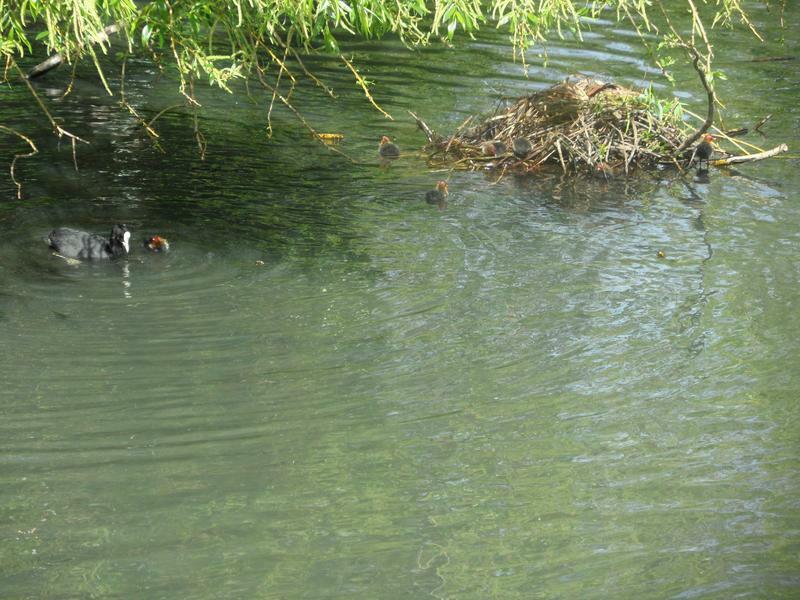 The Coot family is now swimming around the pond, four chicks can be seen here. 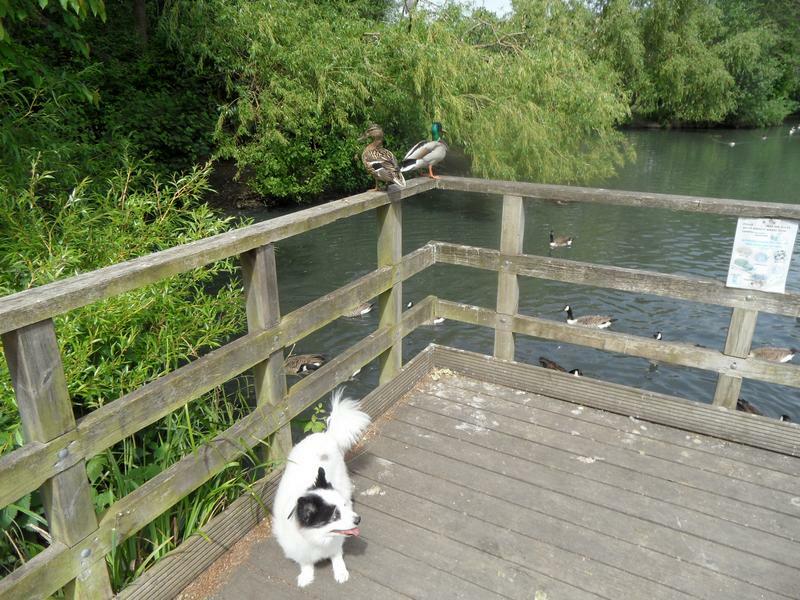 Also a pair of Tufted Ducks are here. 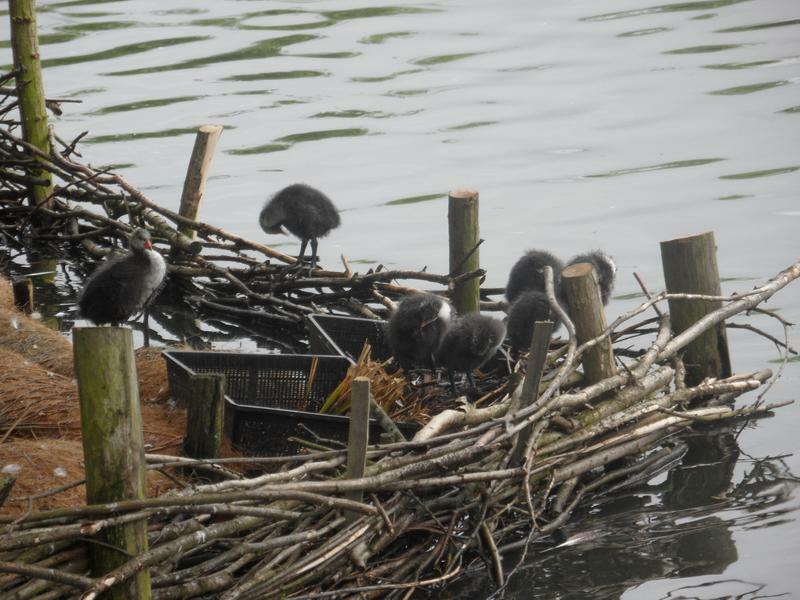 The Coot family is now too large for the original nest, so seven chicks are now on the small island. 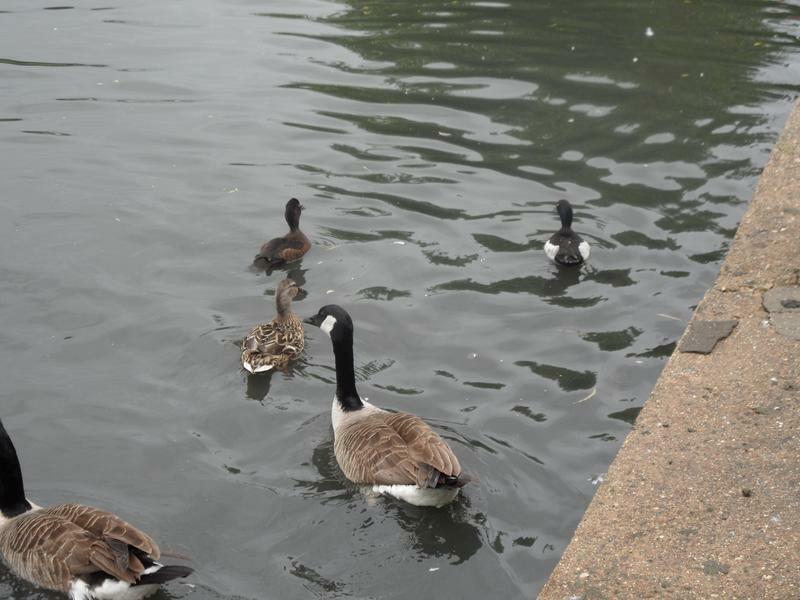 The birds are still hungry, so jumped back into the water and followed us around. 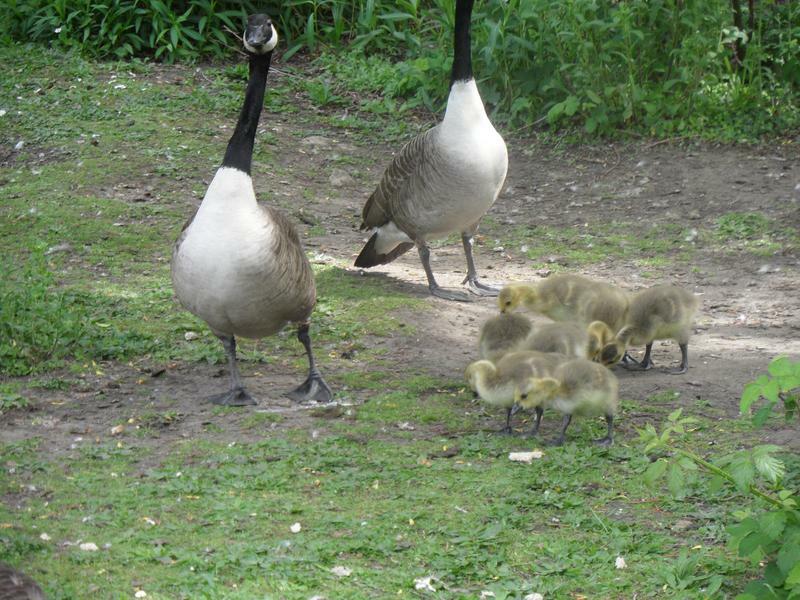 7th June 2015, the Canada Geese goslings are four weeks old today, heading our way for food. 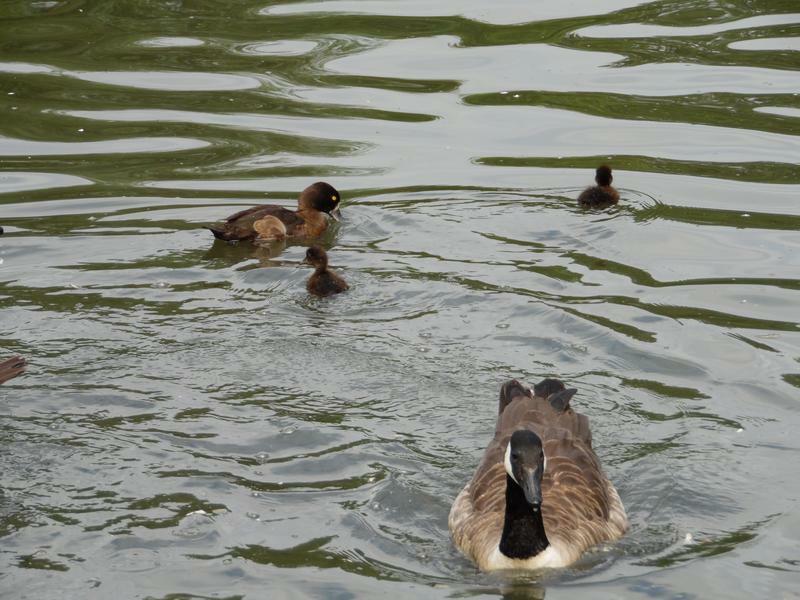 The Coot family is spread out between the Canada geese. 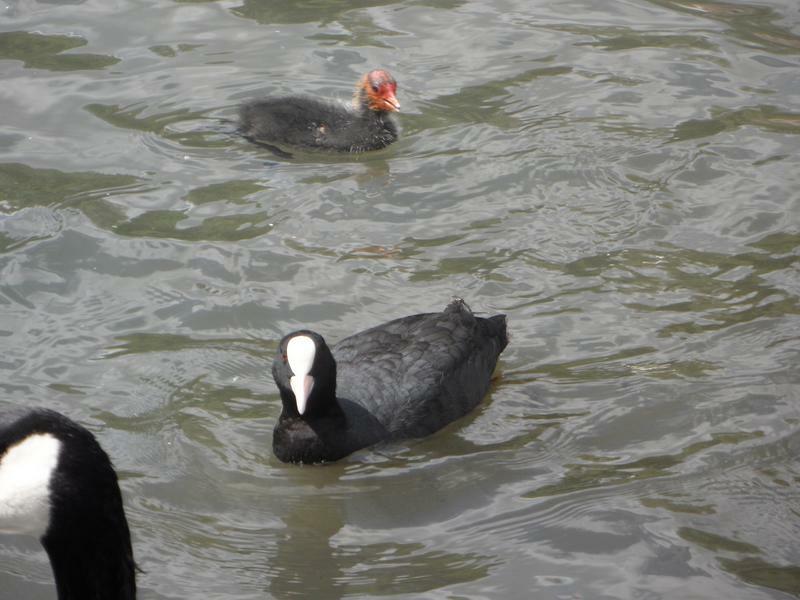 A different Coot family, even smaller. 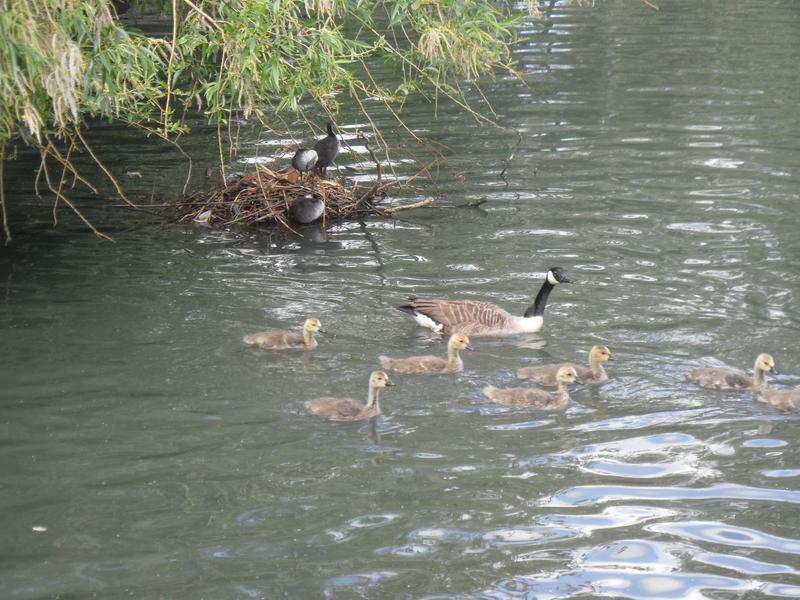 The goose family swimming past the Coot nest, but the chicks are now so large they will not all fit inside the nest. 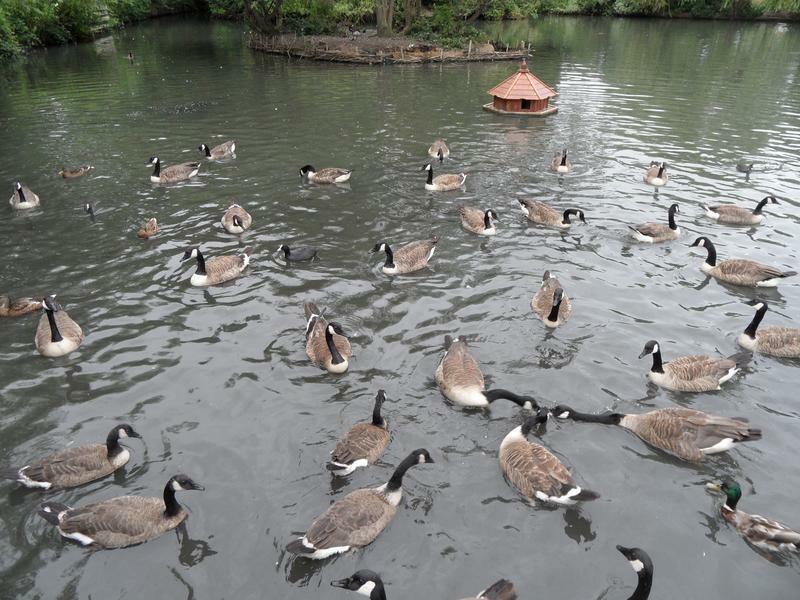 The geese end up on the small island. 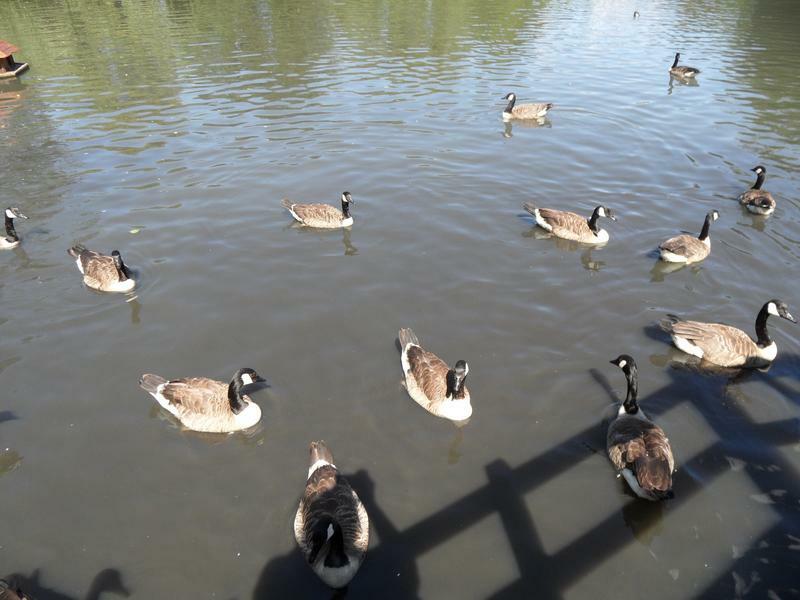 More hungry geese on the far side of the pond. 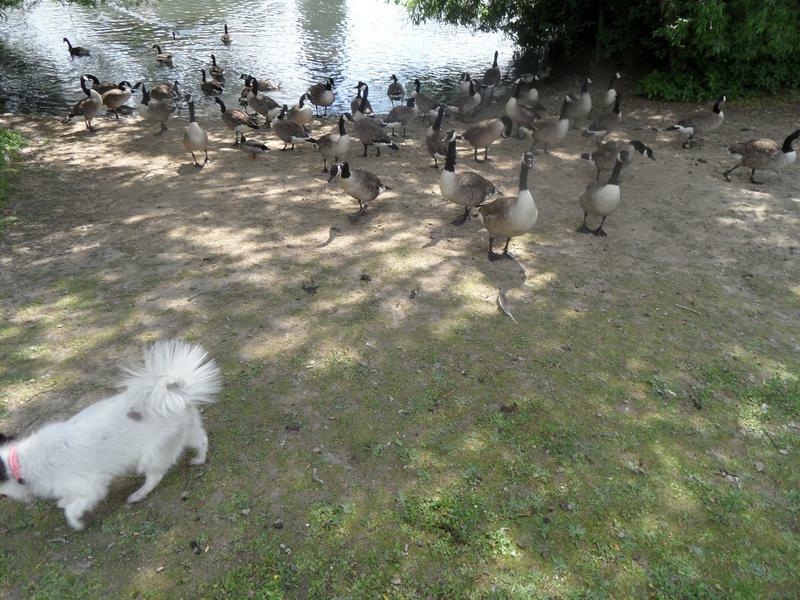 Lucy is getting too old to chase the geese. 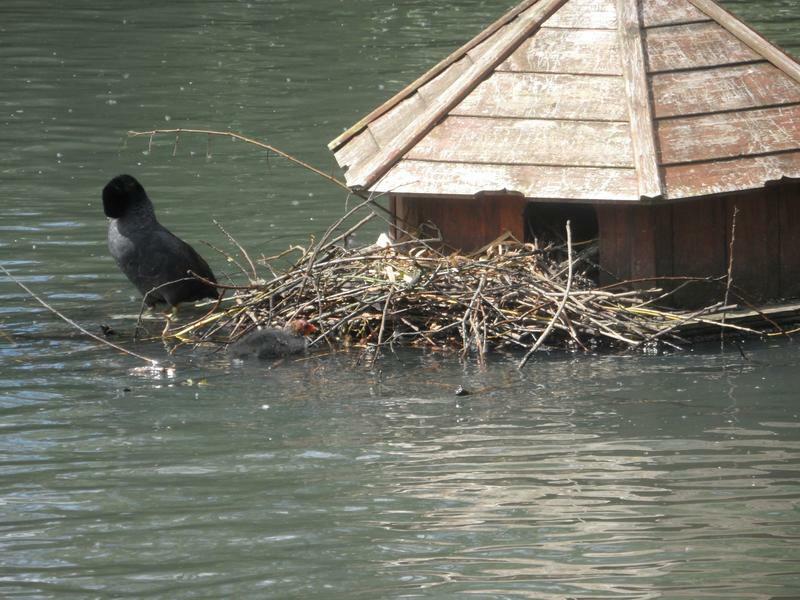 Another Coot nest spilling out of the floating duck house. 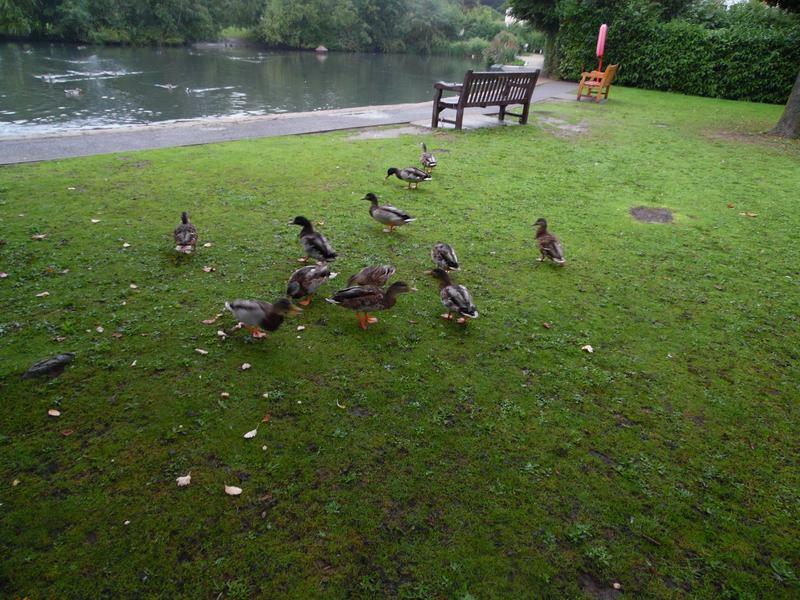 21st June 2015, some of the Mallards on the grass. 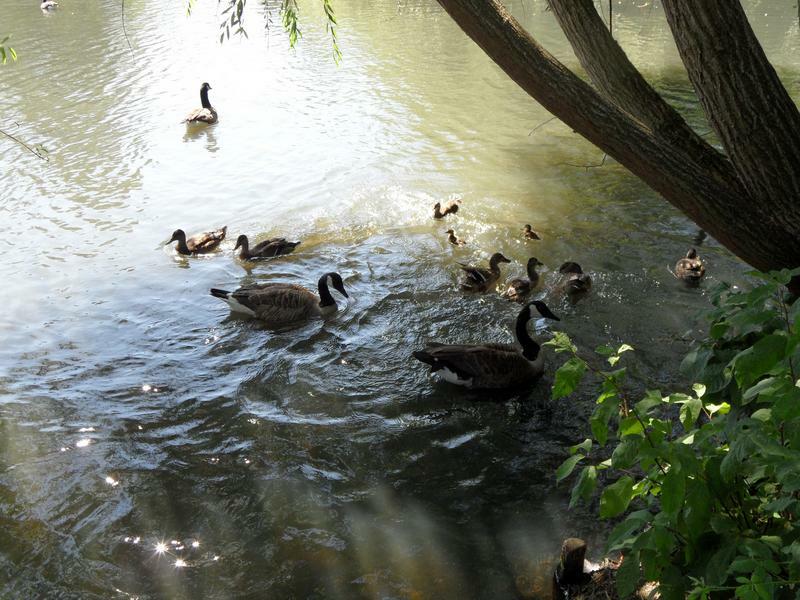 And dozens of geese in the water, including the Canada geese goslings, now six weeks old and at least half fully grown. 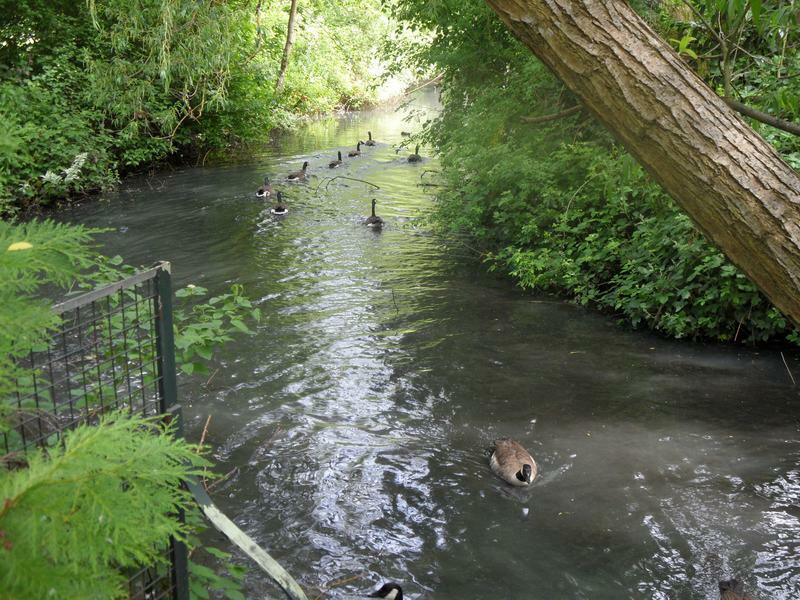 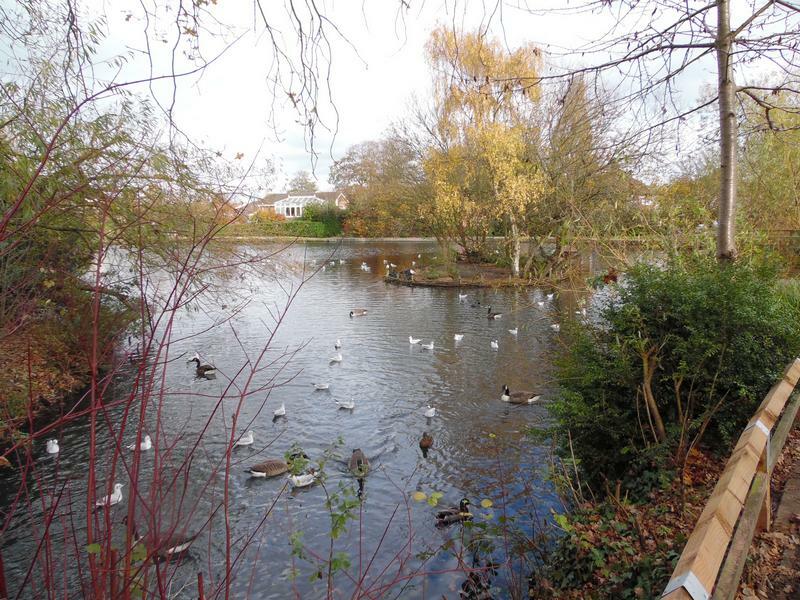 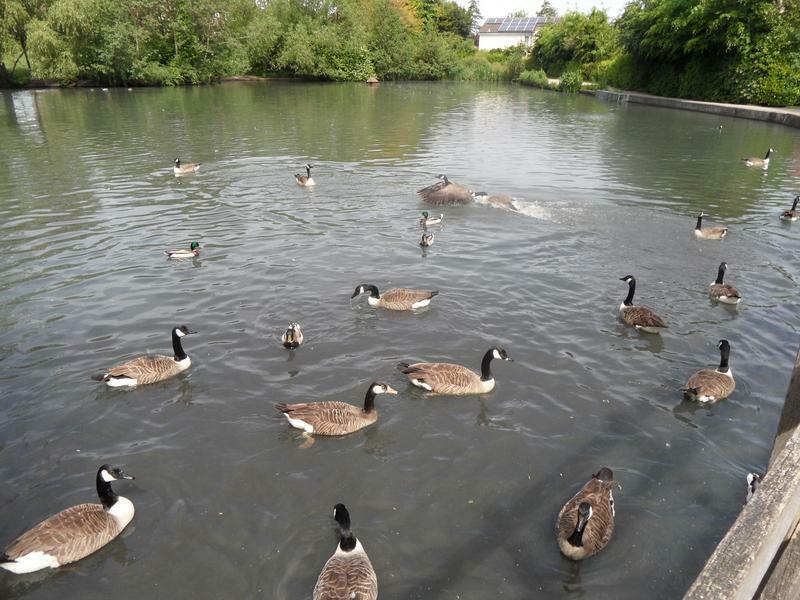 There seem to be Canada Geese here than any other park in Croydon. 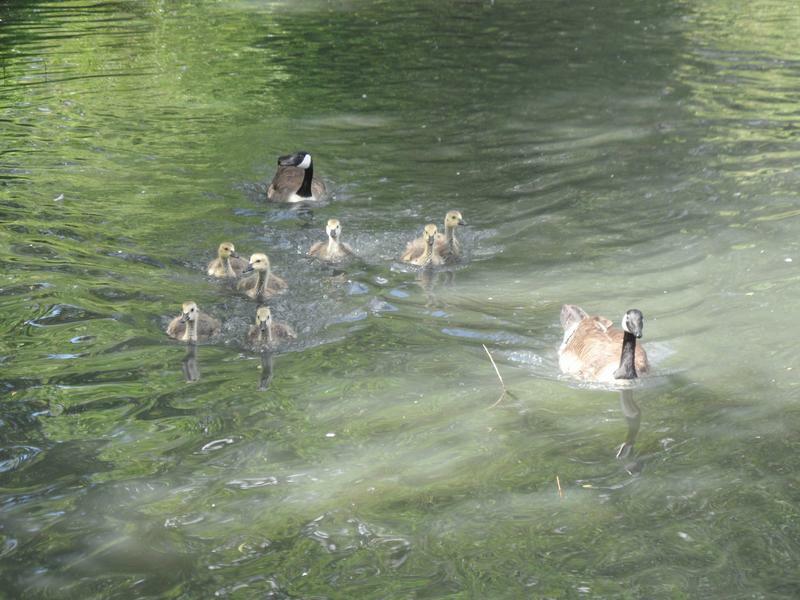 The goslings swim off together. 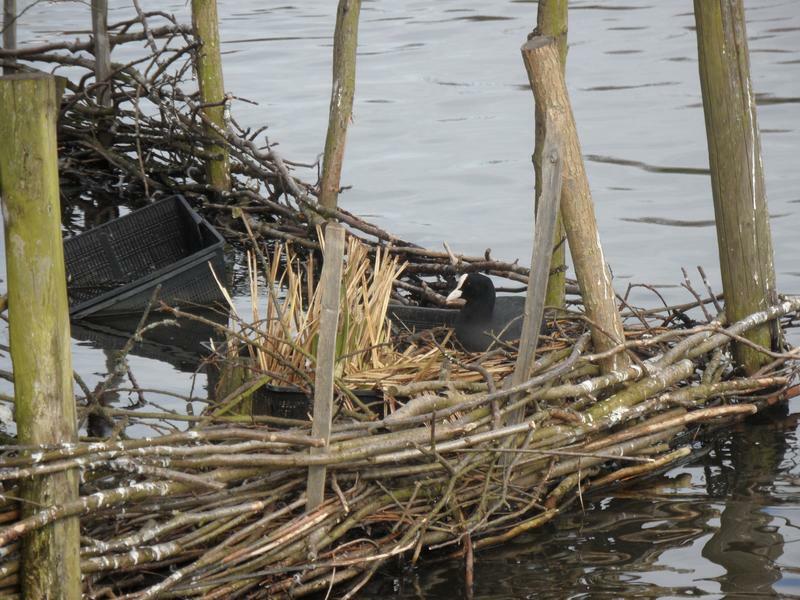 Last time it seemed this Coot nest had spilled out of the duck house, but now it seems to be built on the pond bottom, only a foot or so deep. 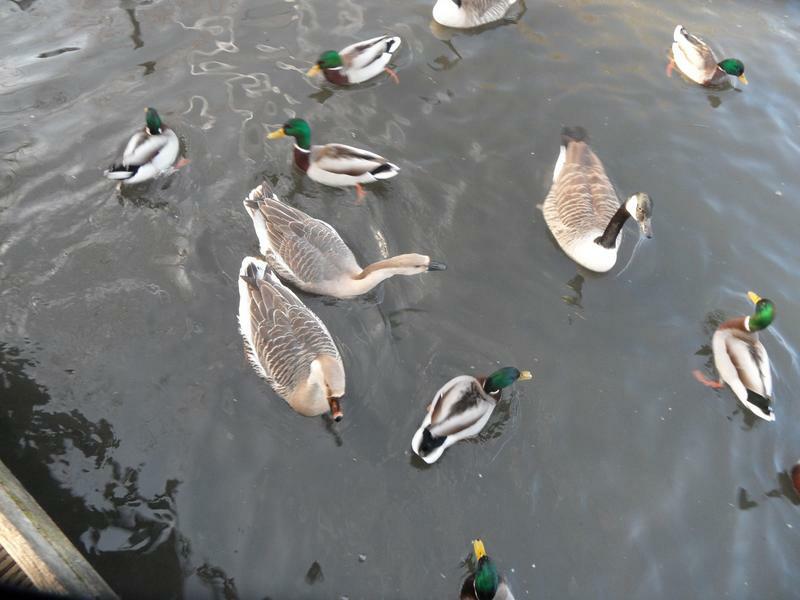 Wide mix of water fowl. 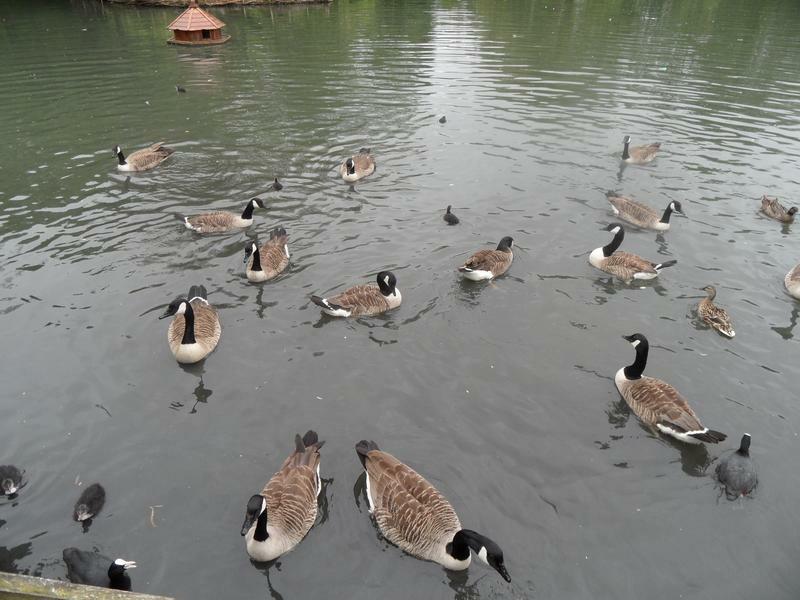 12th July 2015, mostly Canada Geese here today. 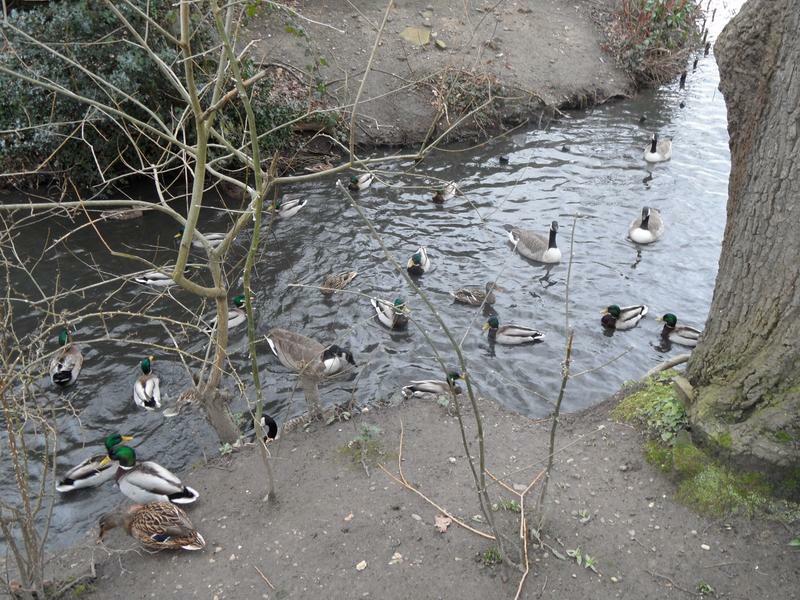 A few Mallards. 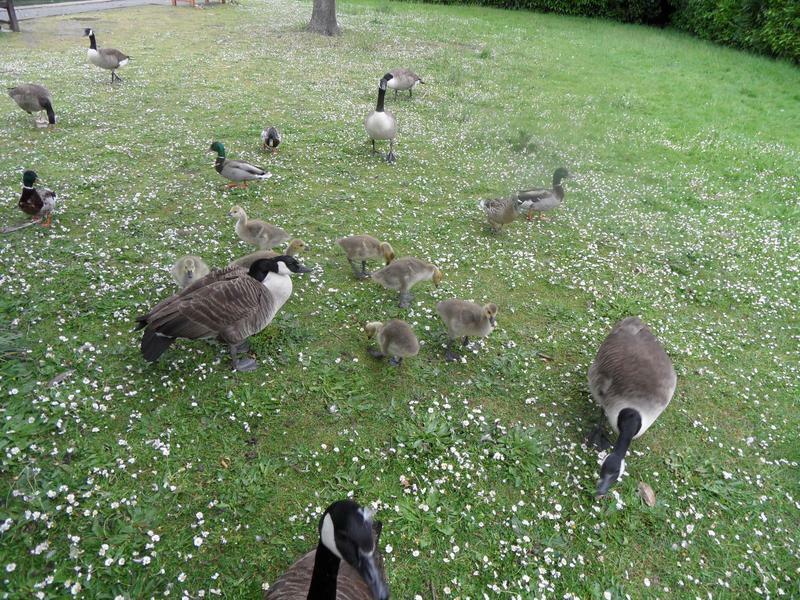 Not very hungry. 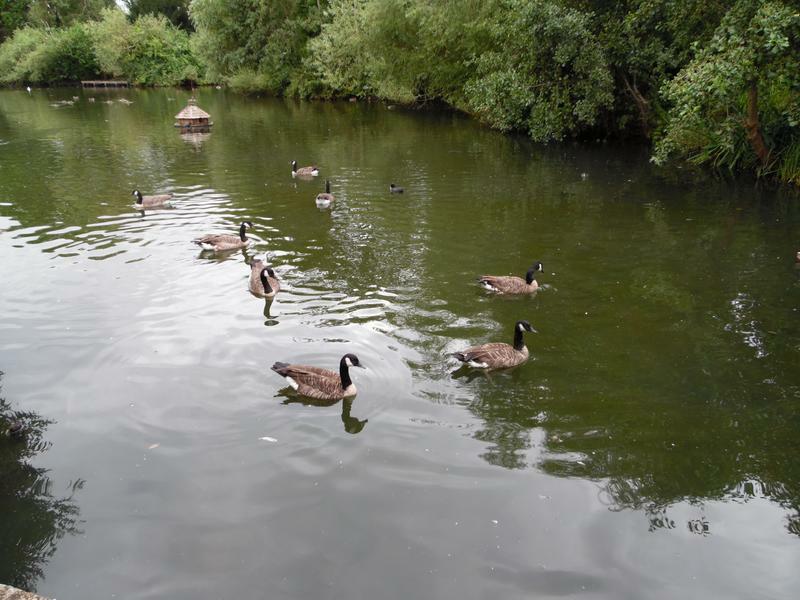 19th July 2015, next week, still mainly Canada Geese. 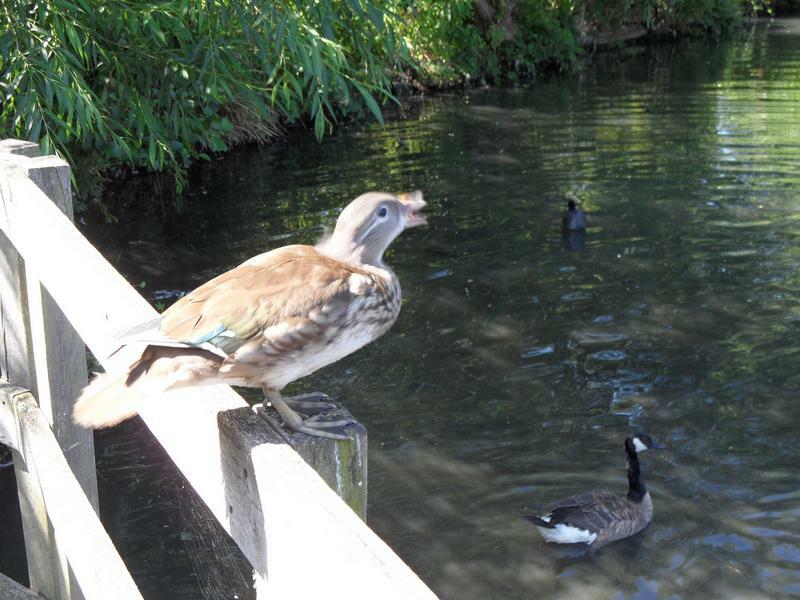 But a hungry female Mandarin Duck flies up onto the fence, very hungry. 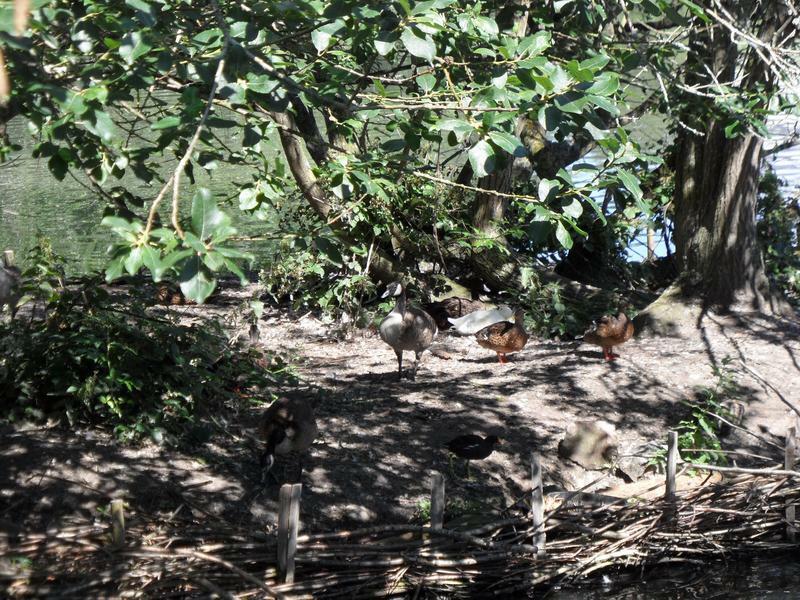 She has a family on the island. 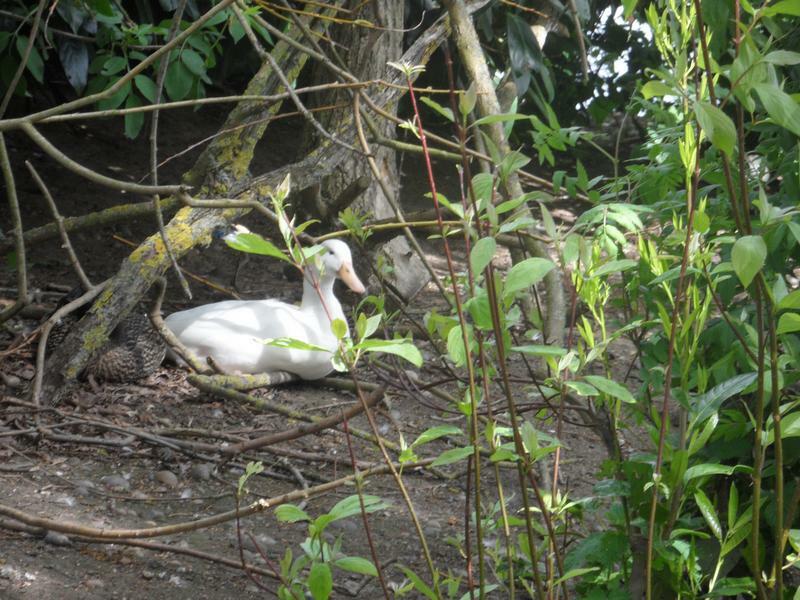 One of the Mandarin ducklings. 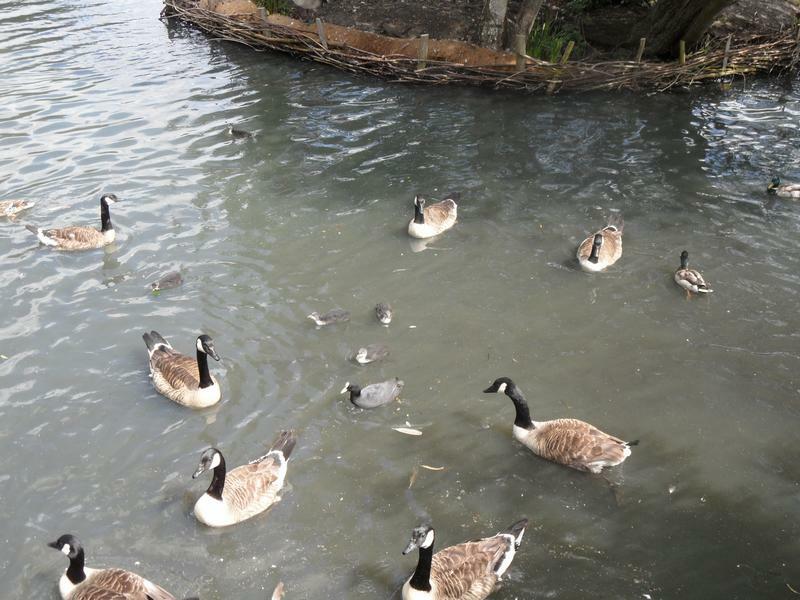 Lots of birds on the small island. 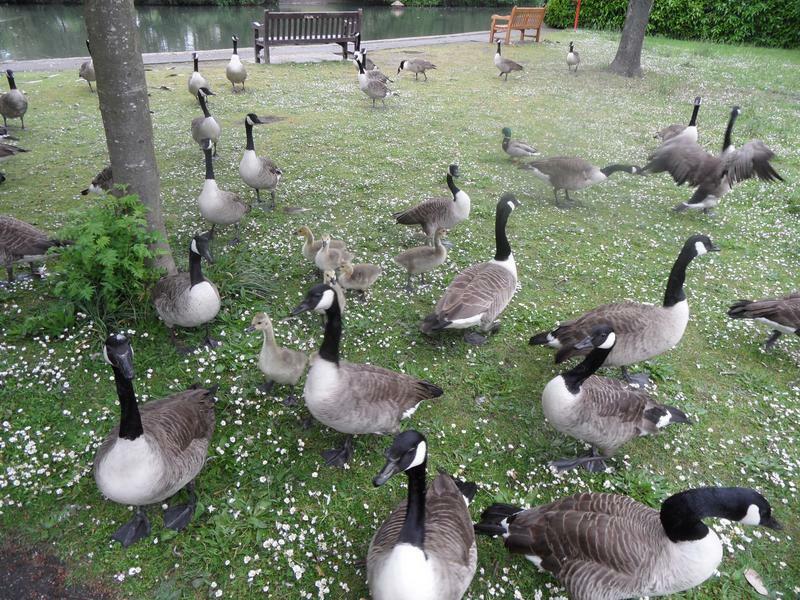 Not that hungry again, lots of park visitors in the summer. 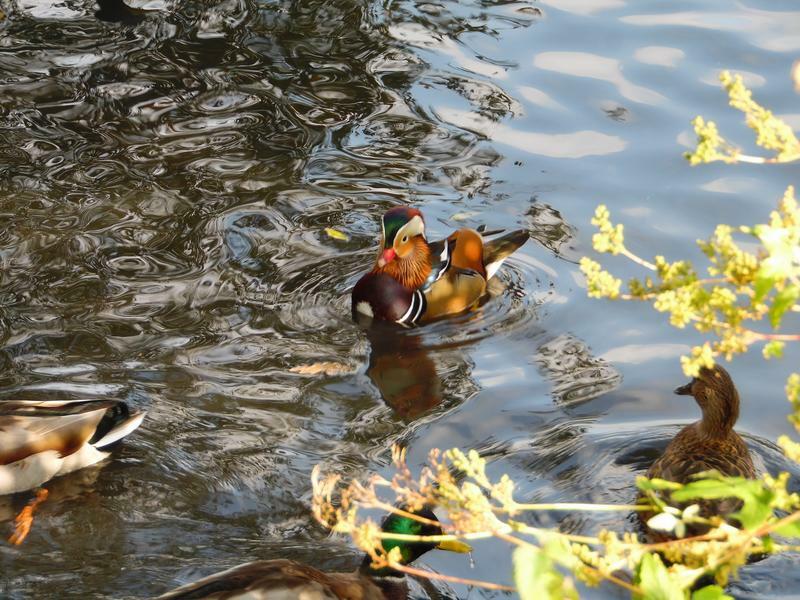 The Mandarin mother again with two ducklings. 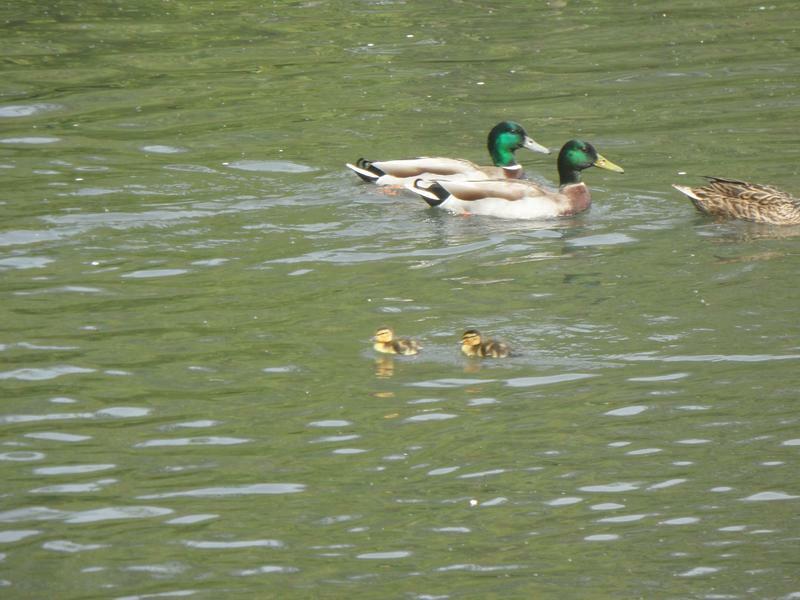 A different mother, this one a Mallard with three ducklings. 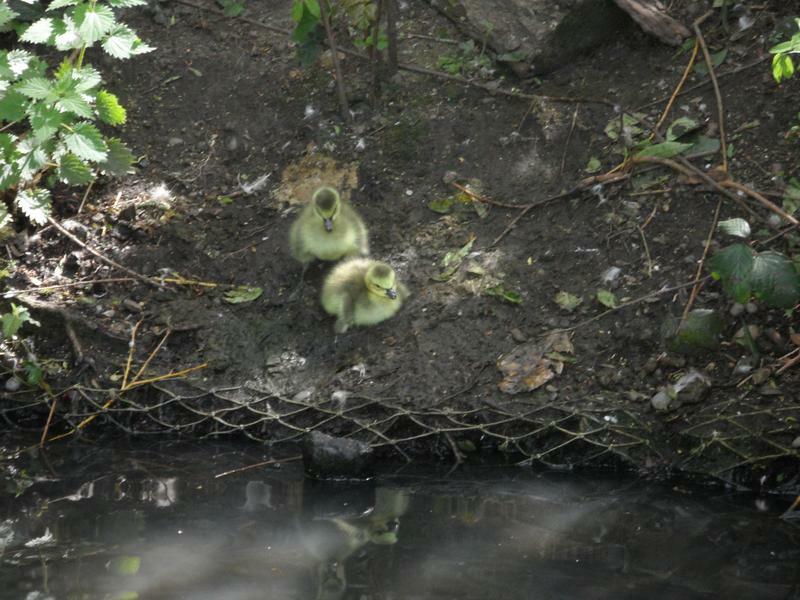 Unusual to get new ducklings in July, late spring. 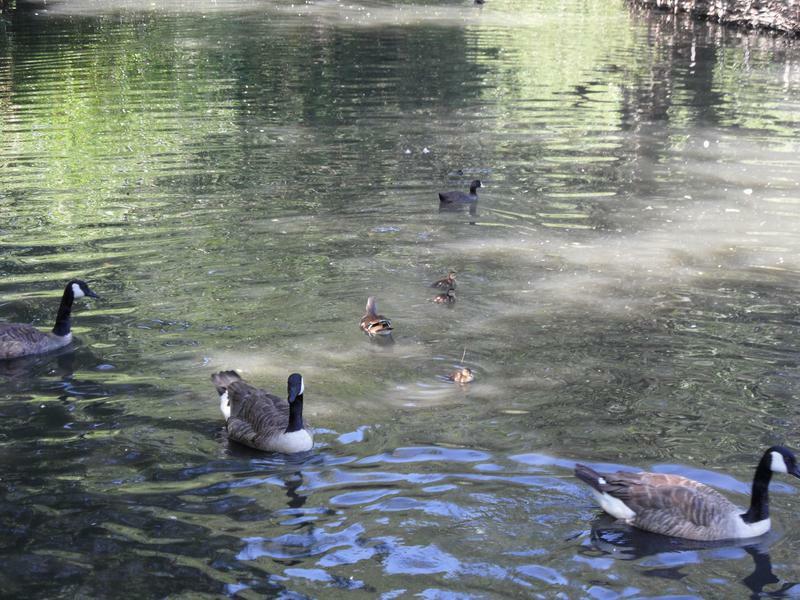 The ducklings may still be small, but they are following us around the pond, no on the far side. 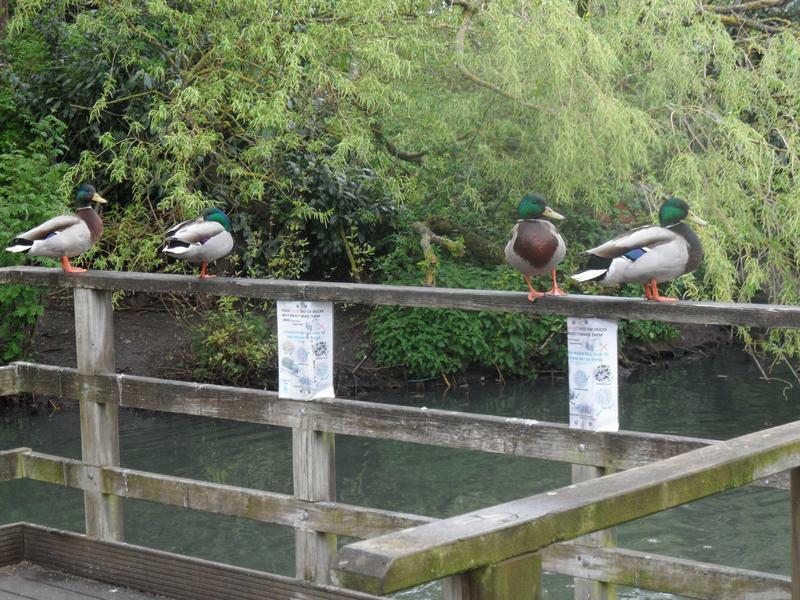 More ducks heading our way. 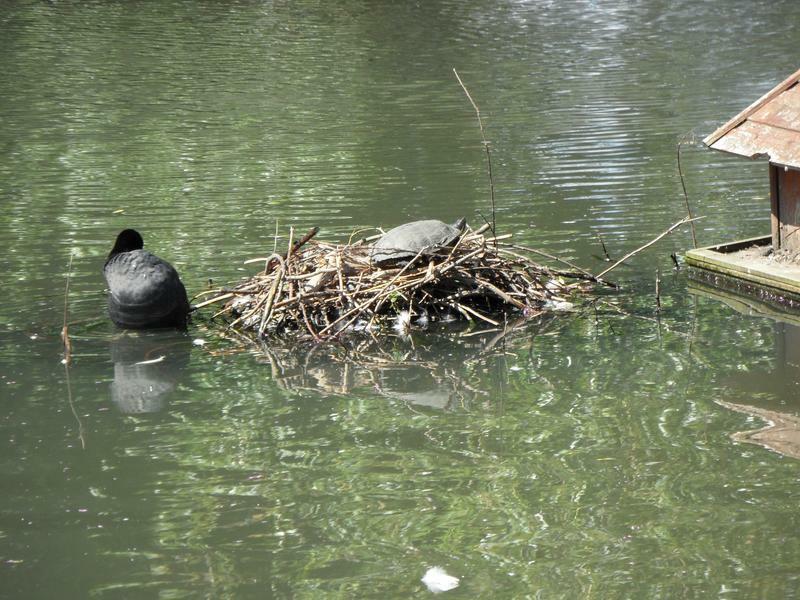 A turtle sunbathing on the Coot nest, normally they live on the bottom of the pond, and try to catch ducklings swimming above them. 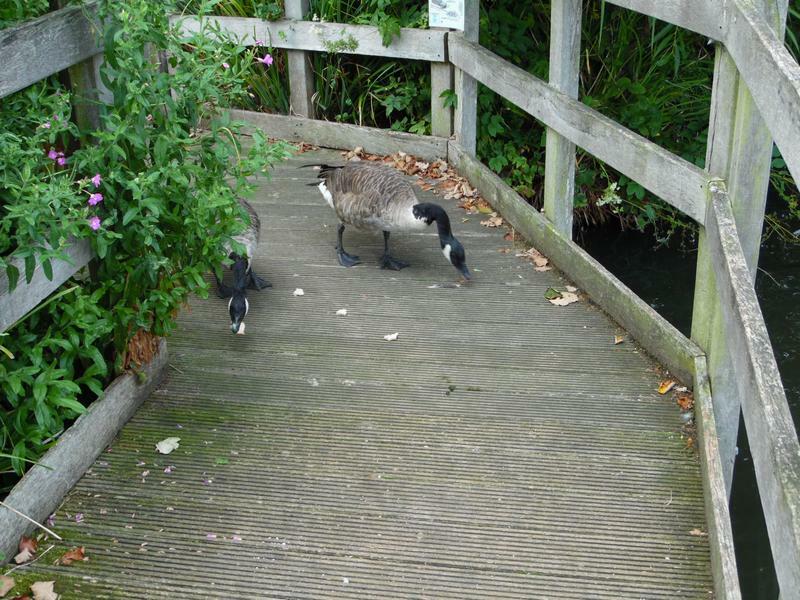 7th August 2015, a goose family heading our way, all fully grown. 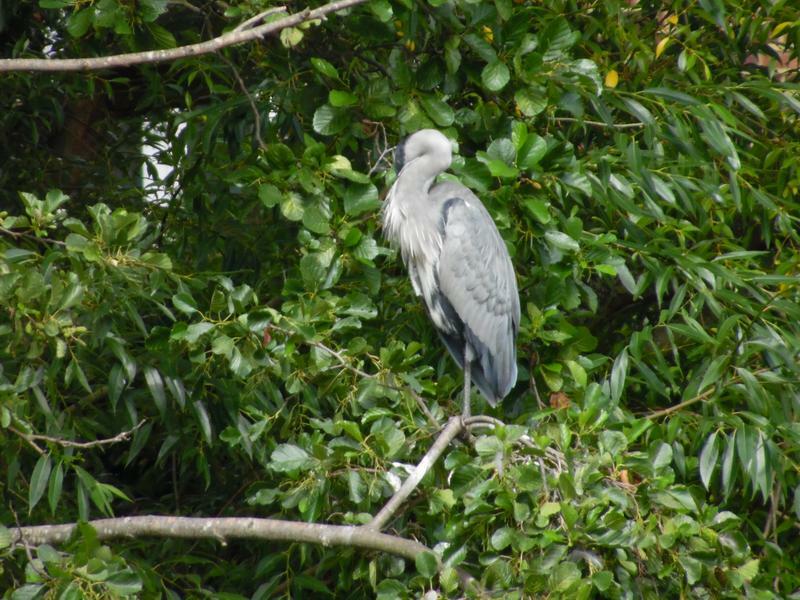 A heron roosting on the far side of the pond. 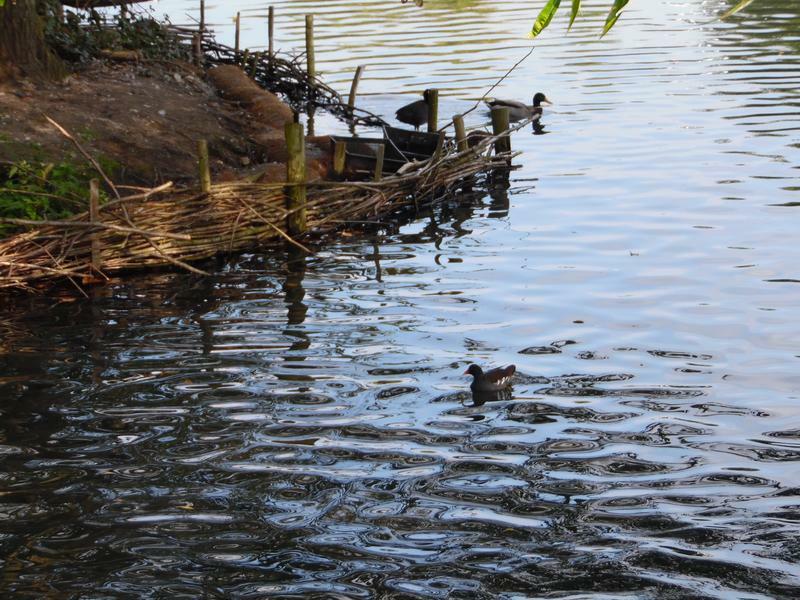 The ducks are still breeding, two Tufted Ducklings. 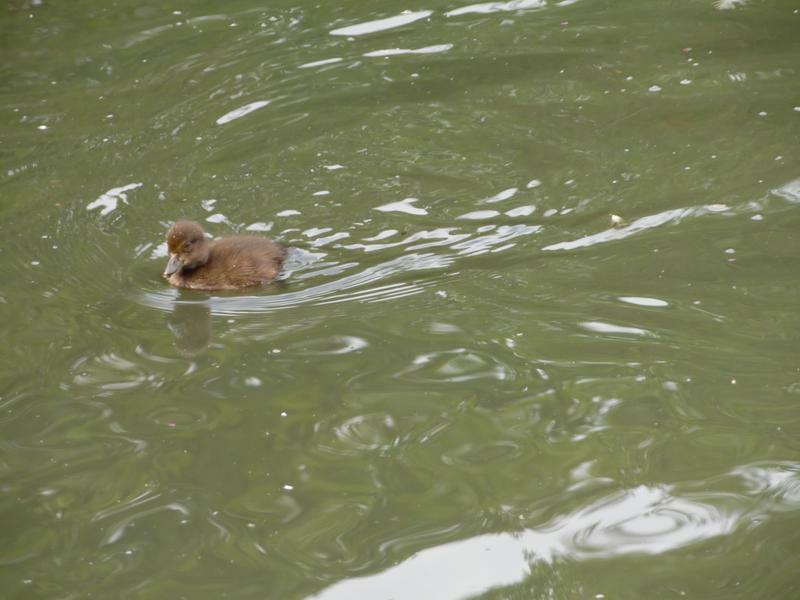 Tufted duckling, probably less than a week old, still fluffy. 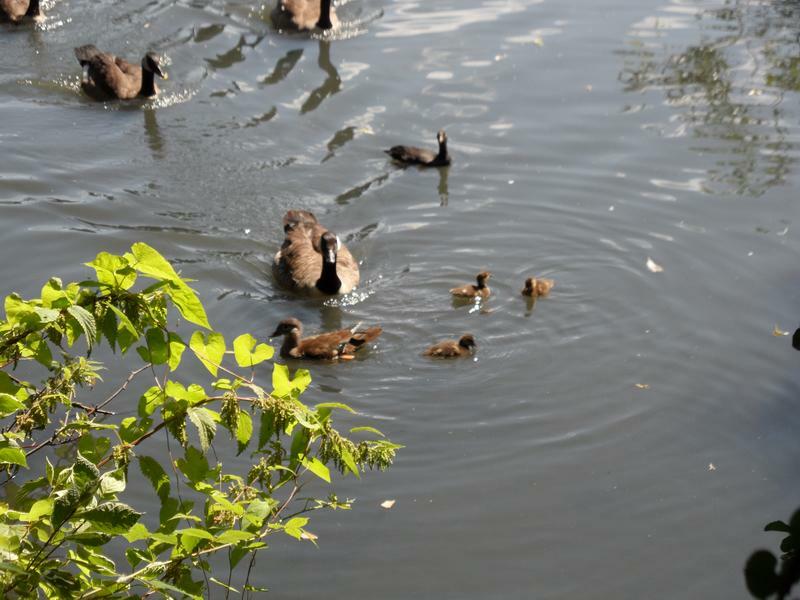 Tufted mother and her ducklings. 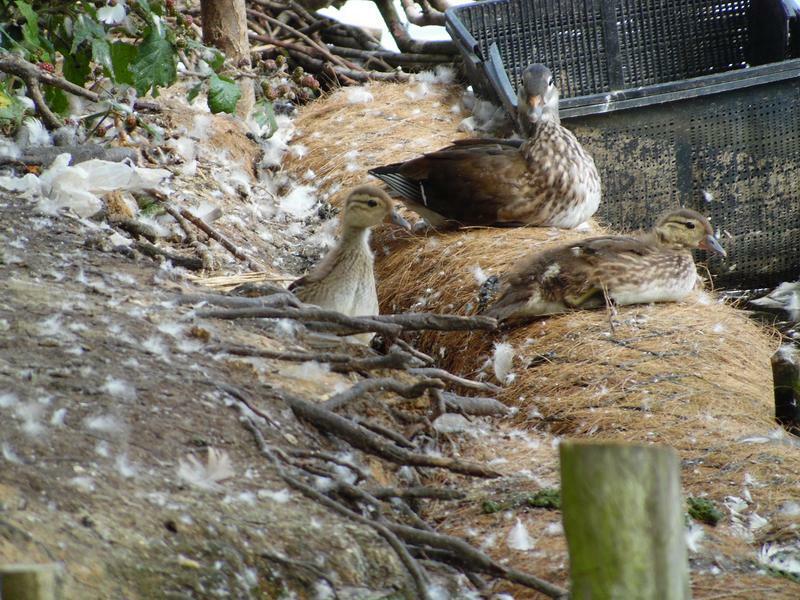 On the small island the Mandarin ducklings are now five or six weeks old, mother behind. 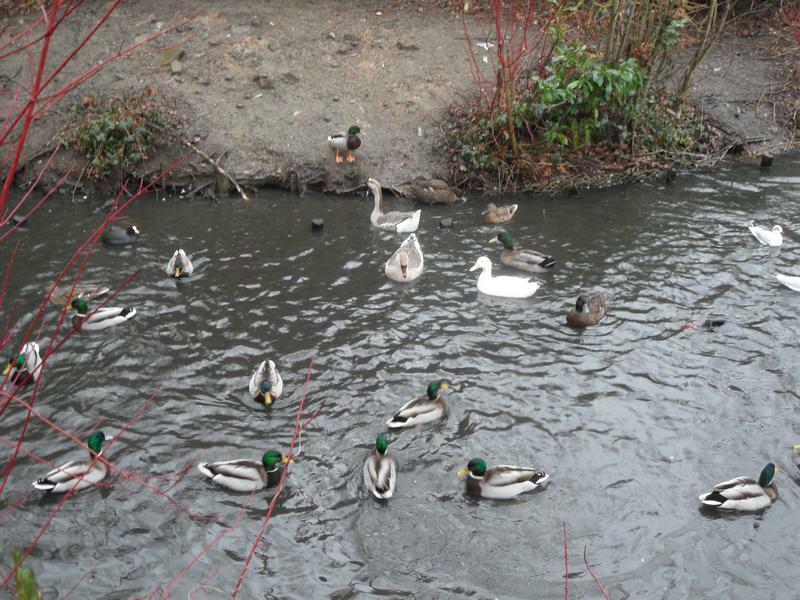 It's molting season for the ducks. 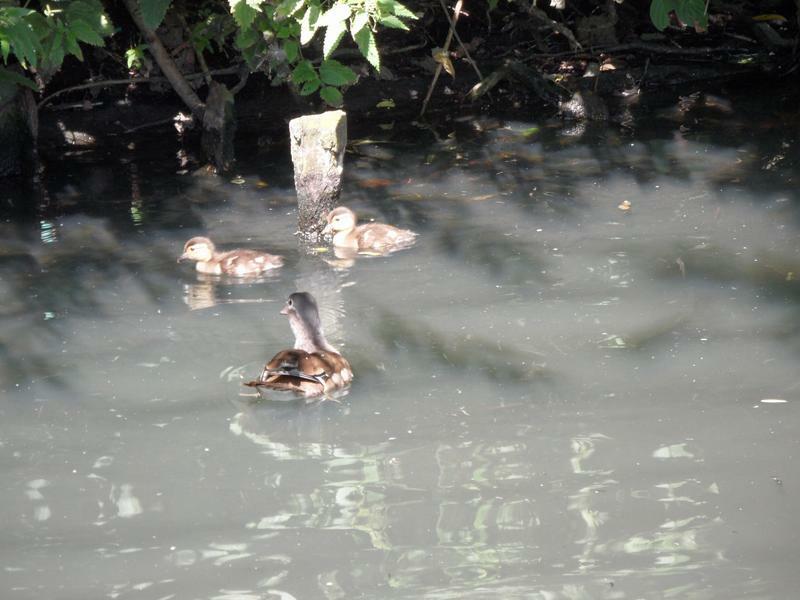 The Mandarin mother and her ducklings are walking around the island. 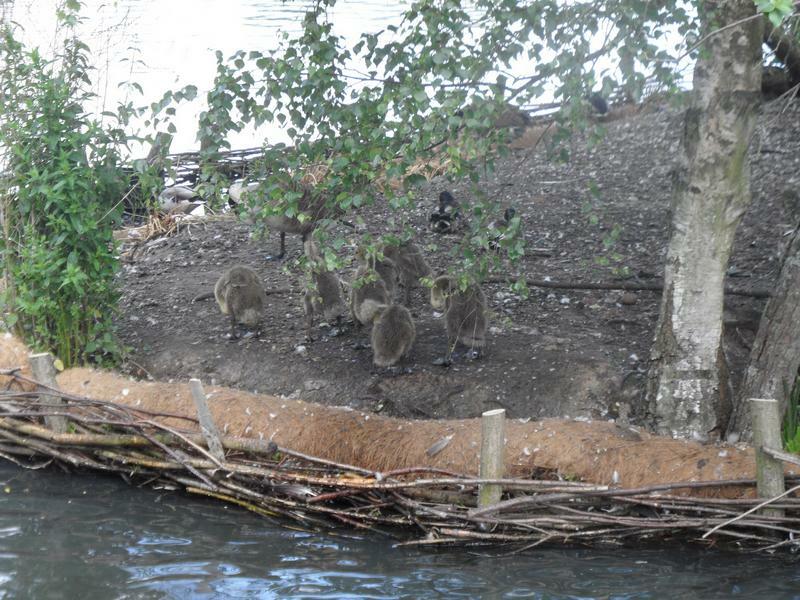 And end up near a Moorhen nest. 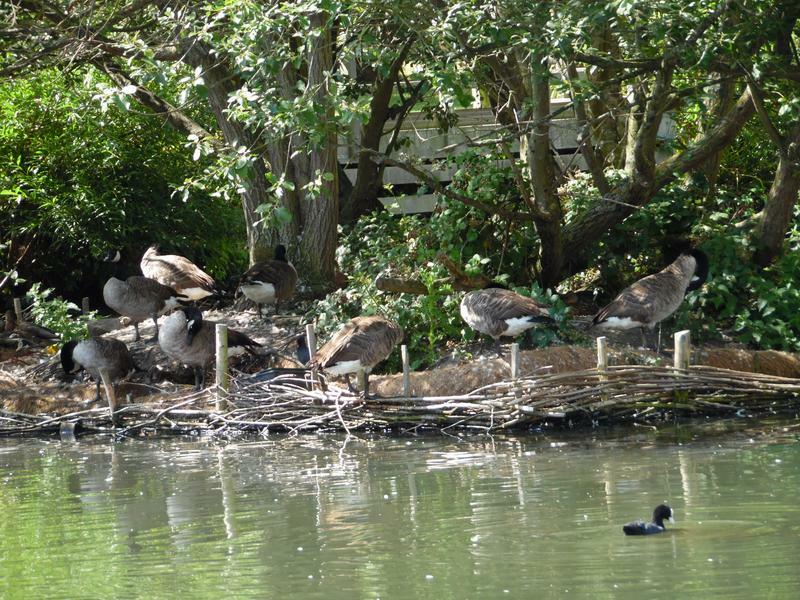 Lots of birds enjoying the beach area. 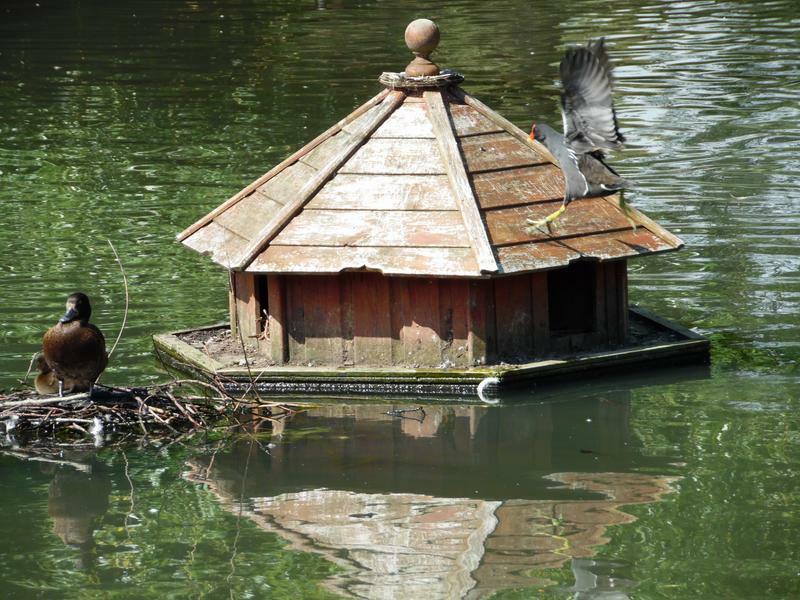 Not sure why the Moorhen wants to climb the duck house roof. 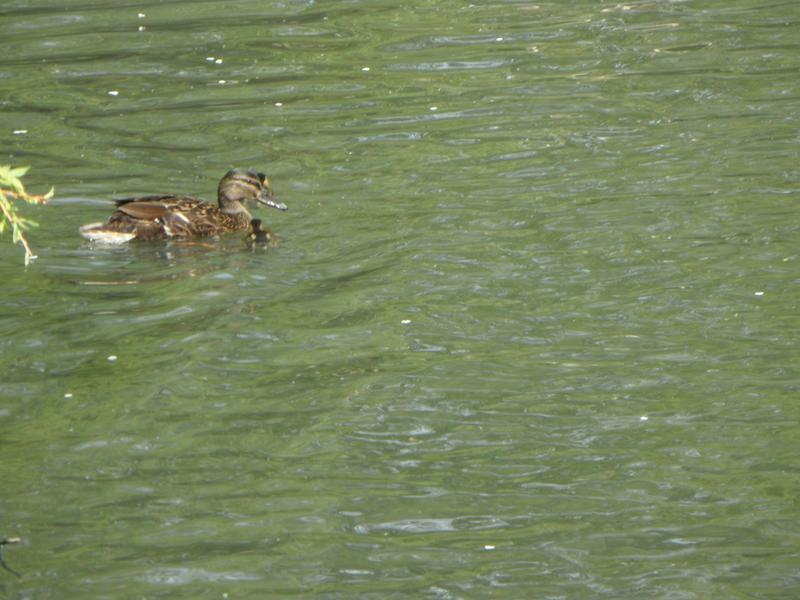 Mallard mother with two ducklings. 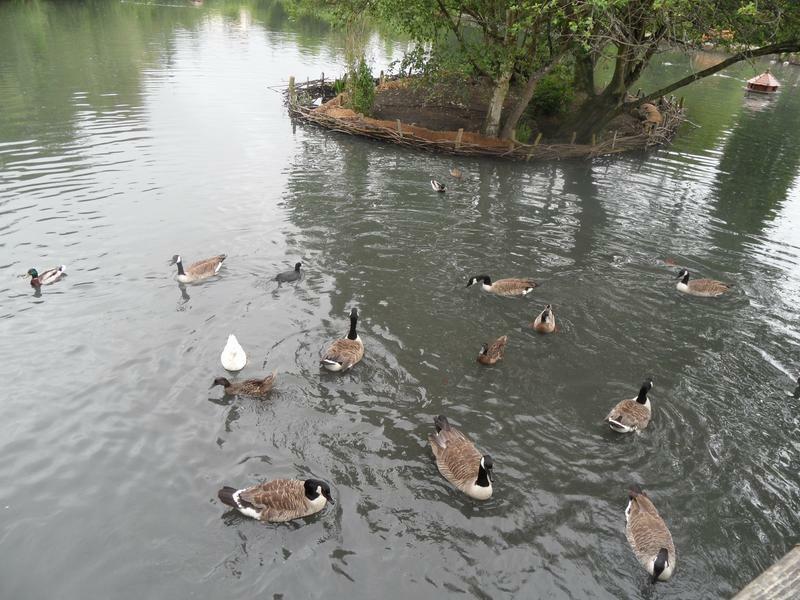 Lots of geese on the small island. 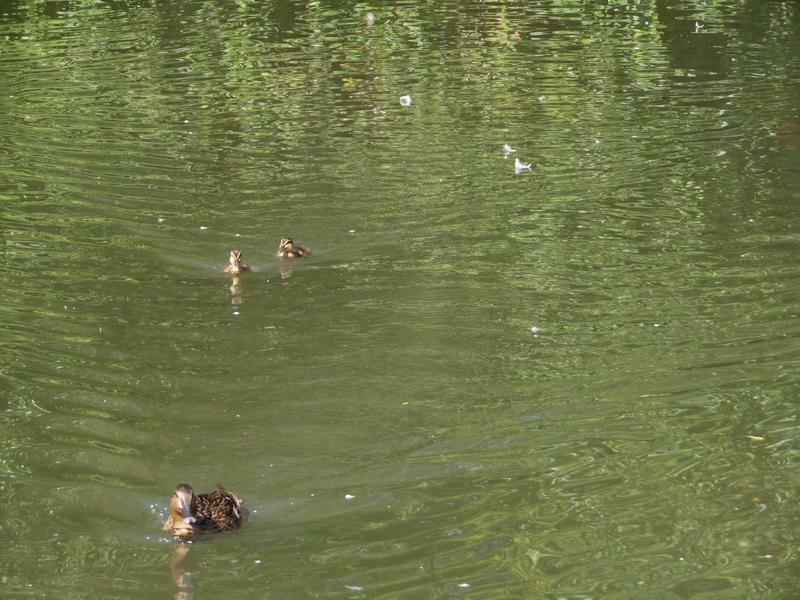 16th August 2015, the Mallard ducklings are still safe. 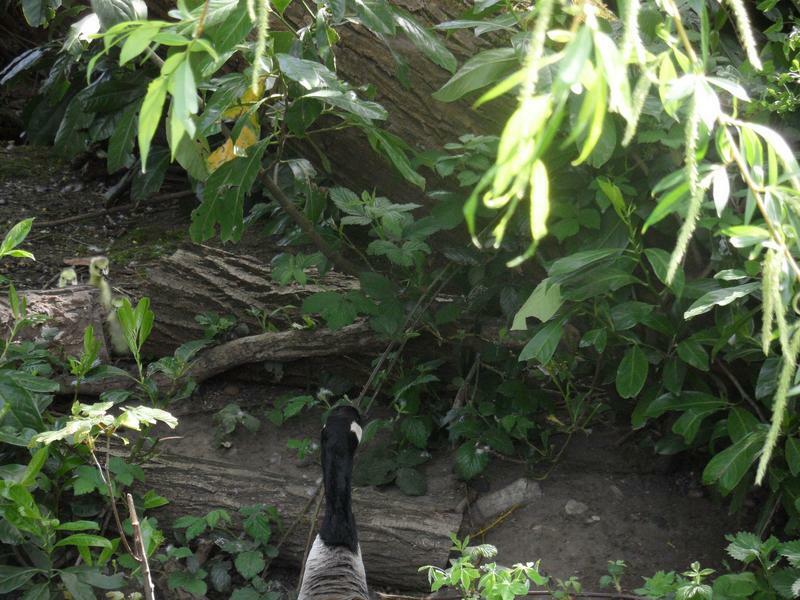 Two hungry geese come looking for breakfast. 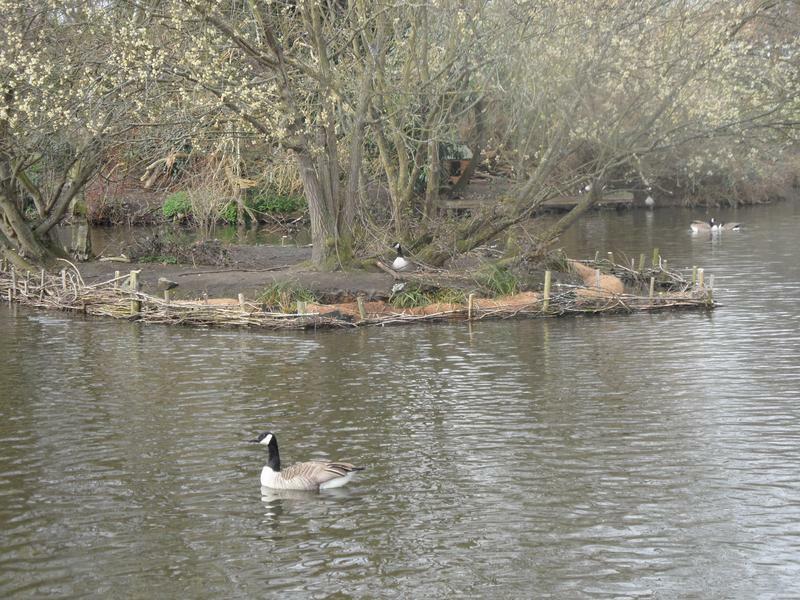 The small island is quieter than some weeks. 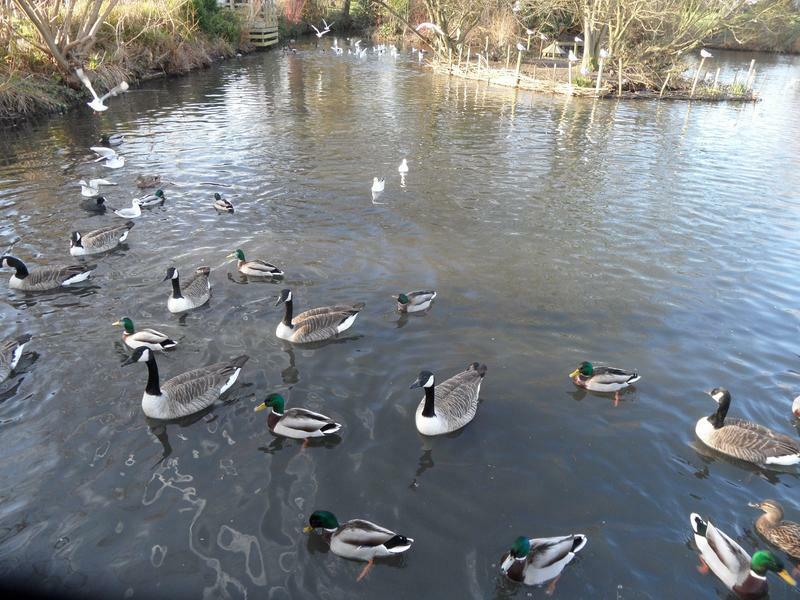 Not much activity on the pond today. 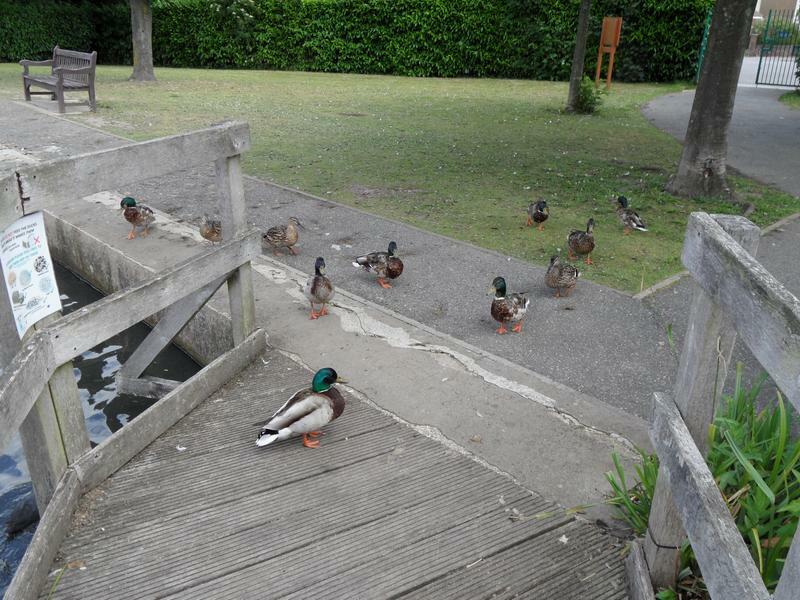 31st August 2015, the Mallards are hungry today and fly out of the pond to the grass as soon as we come in the park gate. 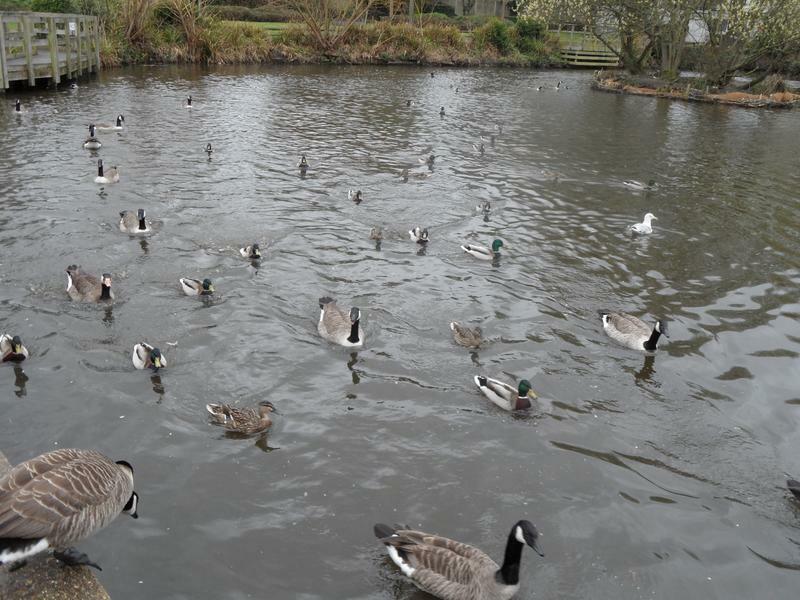 And the pond is only ducks today, not a single goose anywhere. 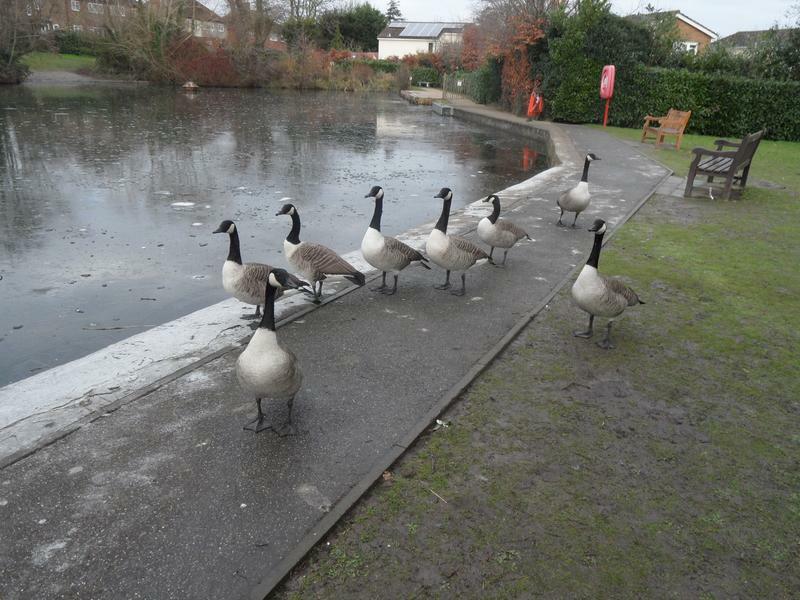 No idea where the geese have gone. 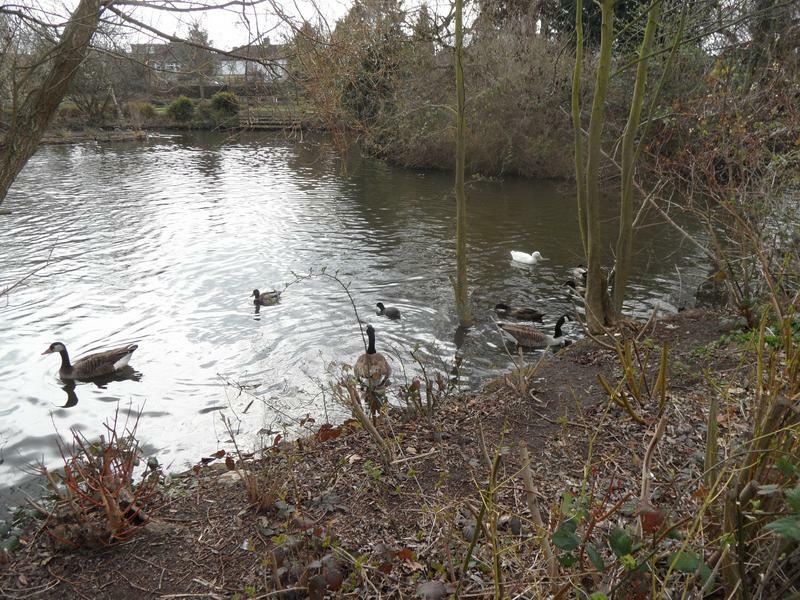 Trying to feed the Moorhens in the distance by the large island, hard to throw bread that far. 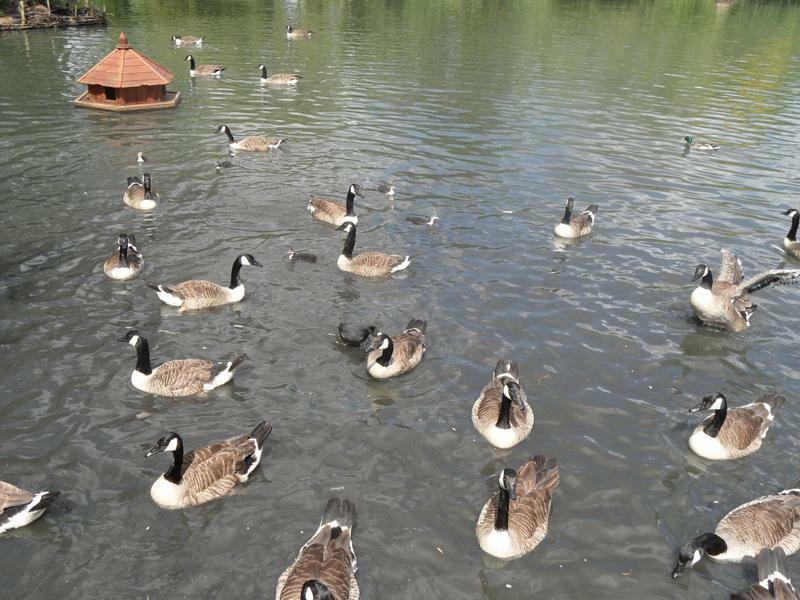 6th September 2015, a week later and the geese have returned. 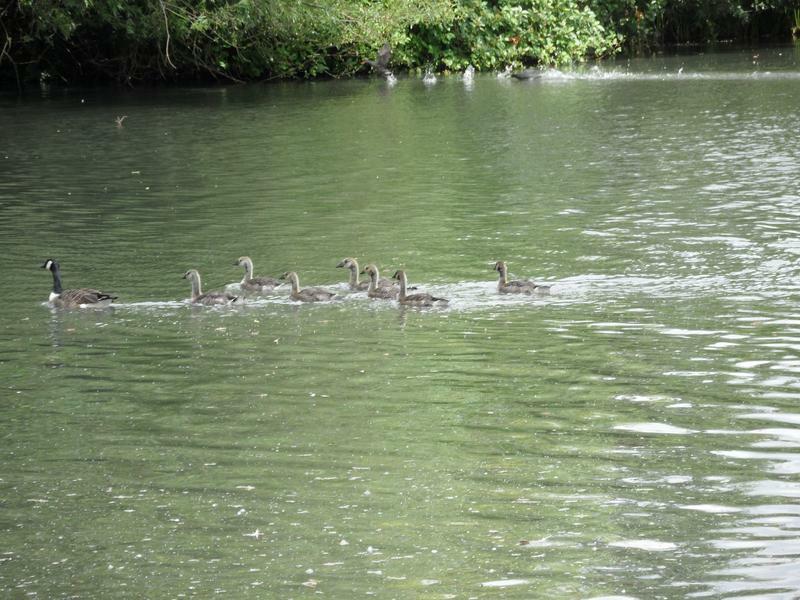 The Tufted duck family is still safe. 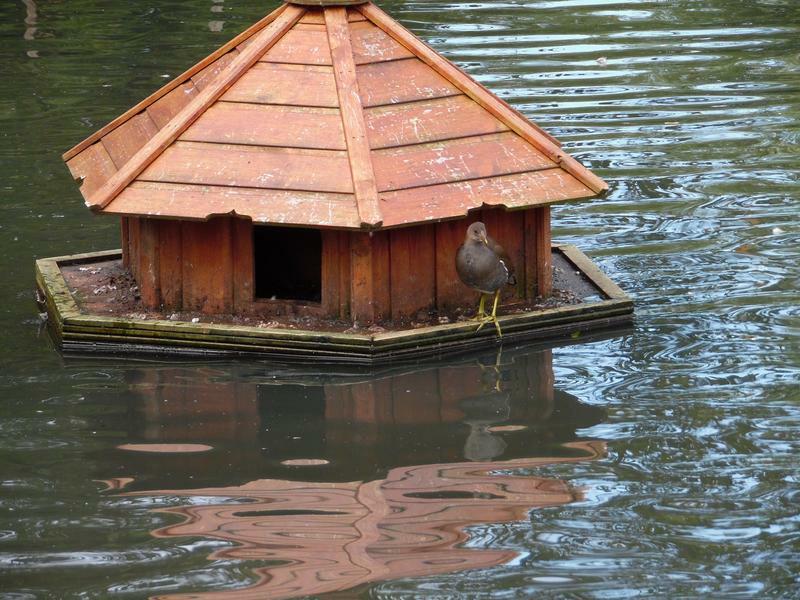 A Moorhen on the duck house. 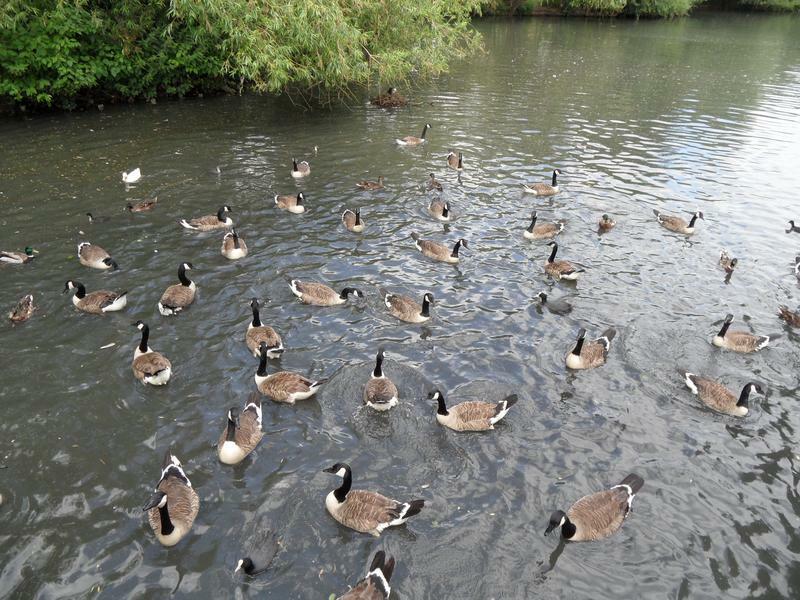 Hungry birds heading our way. 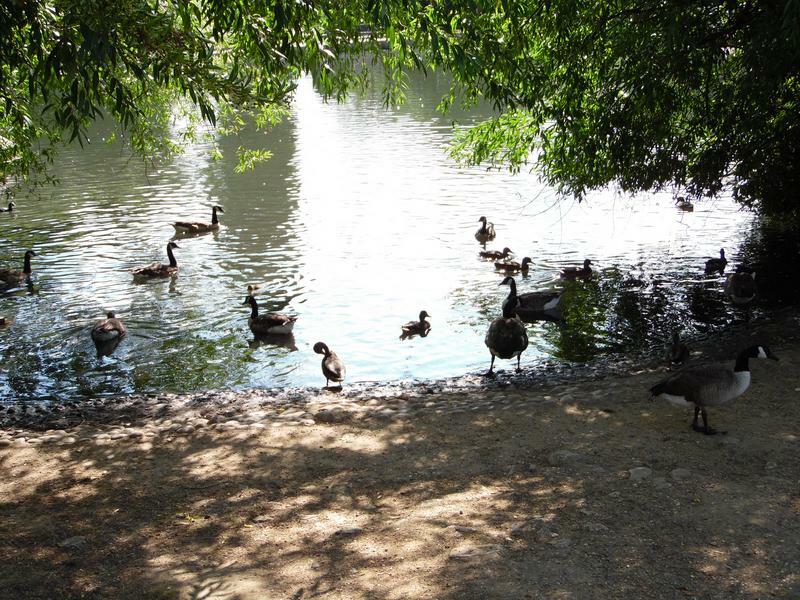 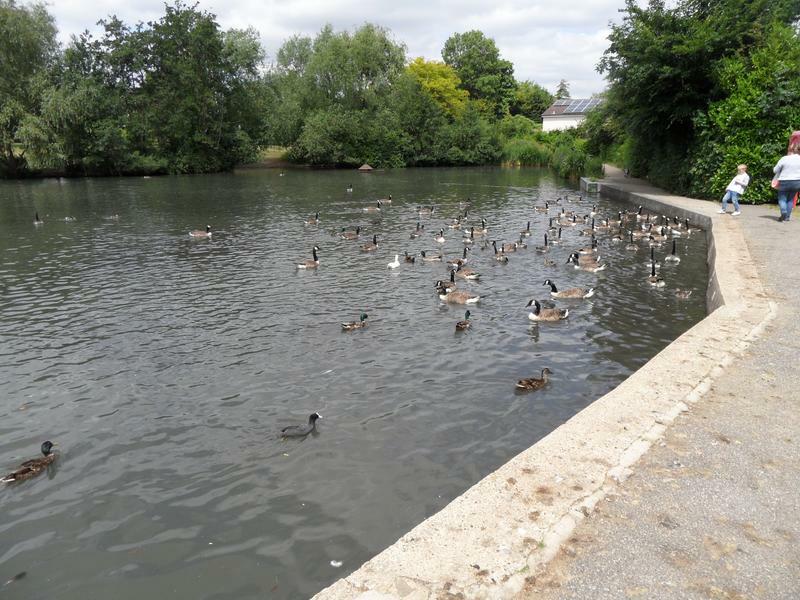 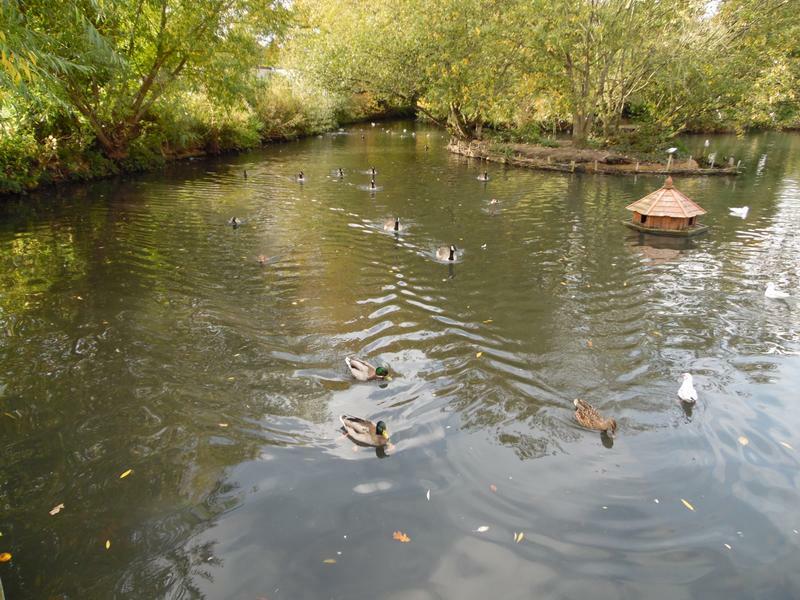 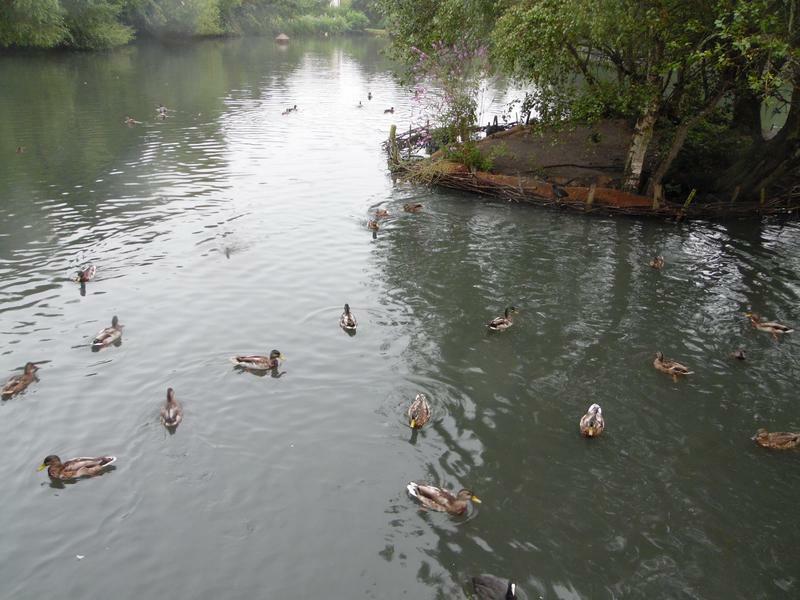 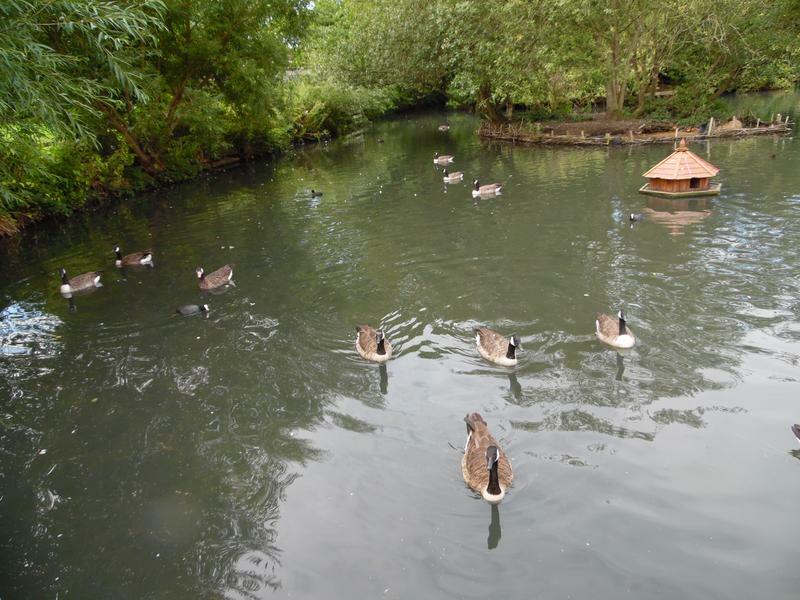 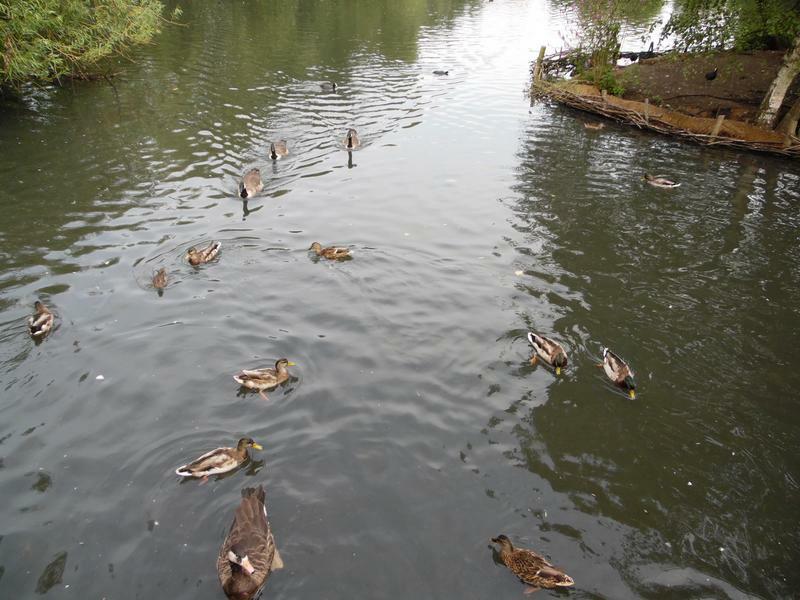 13th September 2015, good turn out of ducks and geese. 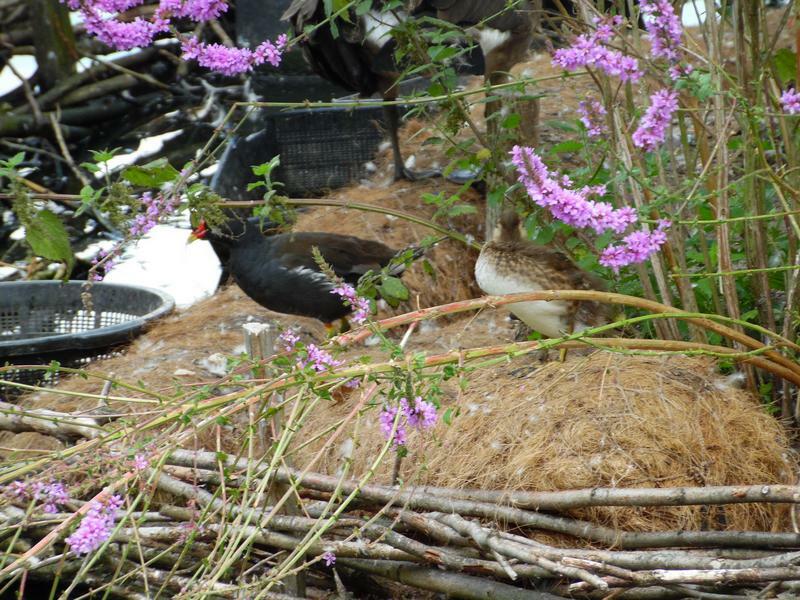 A Moorhen on the large island. 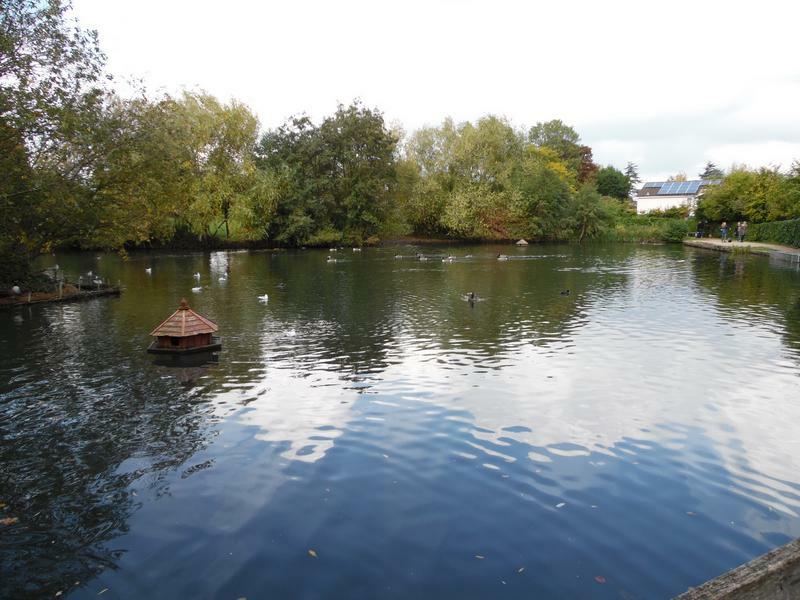 4th October 2015, no sea birds yet. 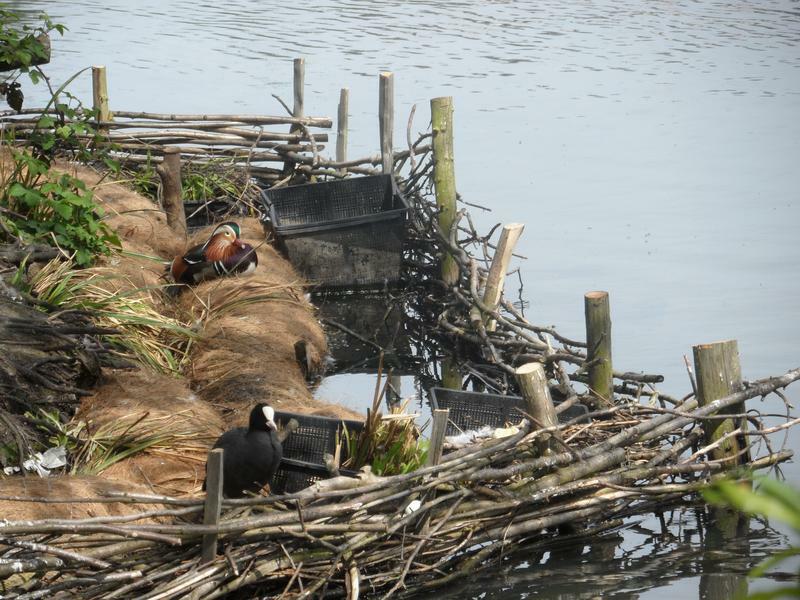 The Coots are protecting their corner of the island, and will build a massive nest in that plastic crate during the winter. 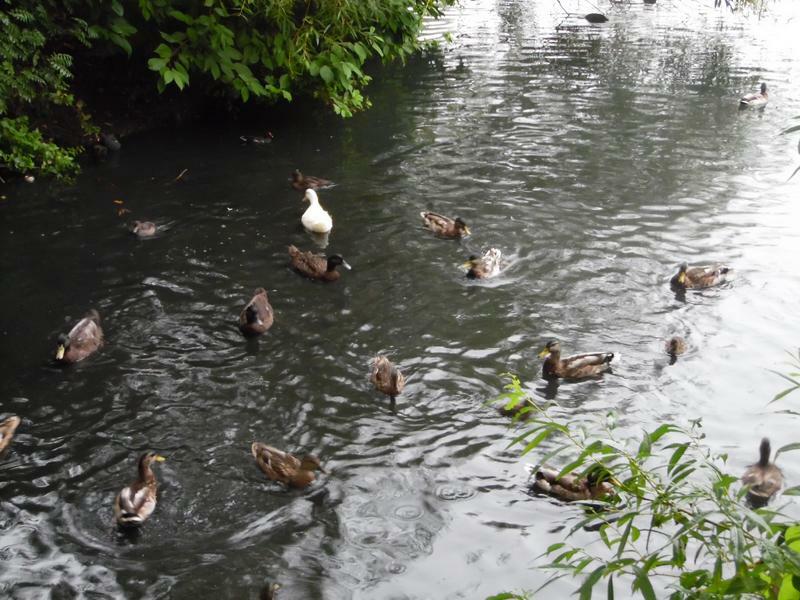 A Manadrin duck, with a pair of Mallards. 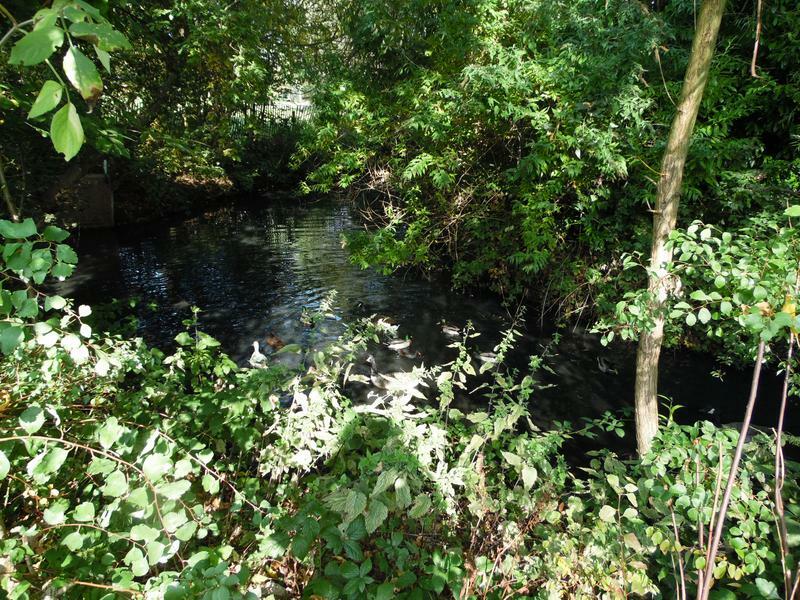 The stream behind the large island is still heavily overgrown, but not for much longer. 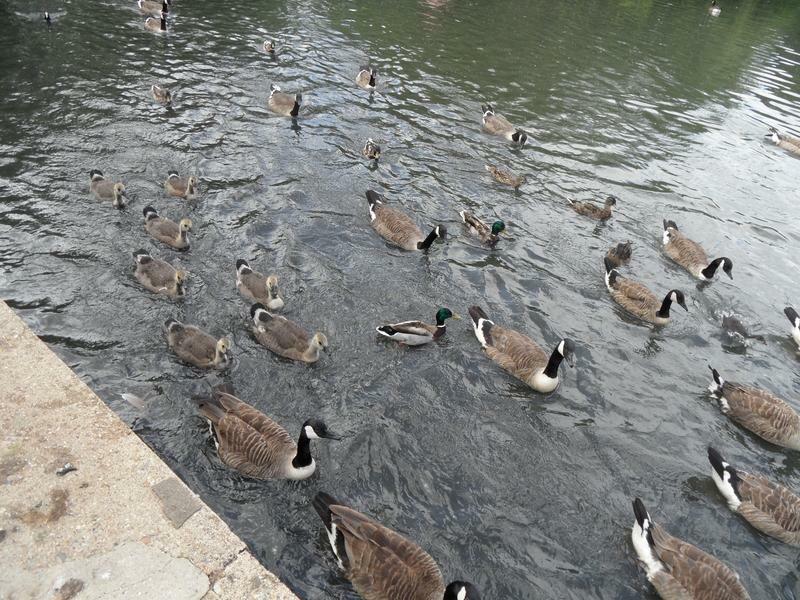 18th October 2016, seems quieter this week, although they are hungry, heading our way. 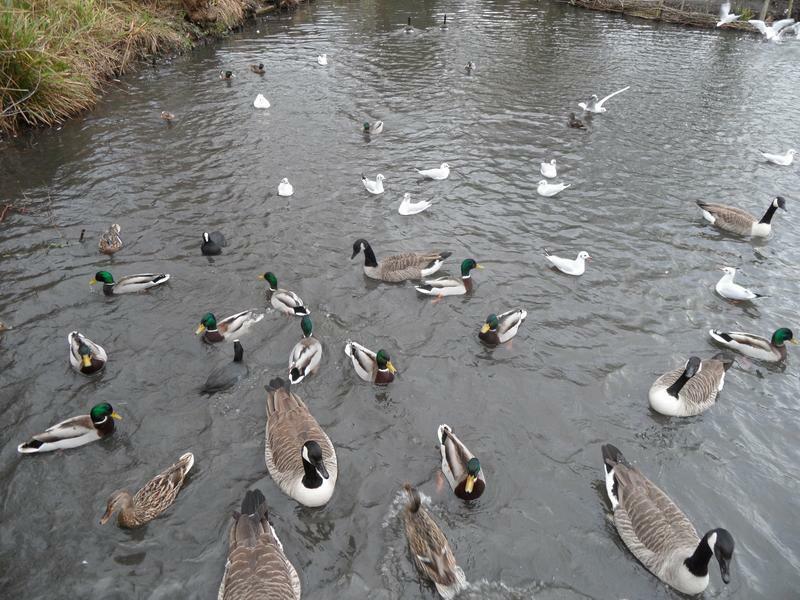 A few sea gulls have arrived. 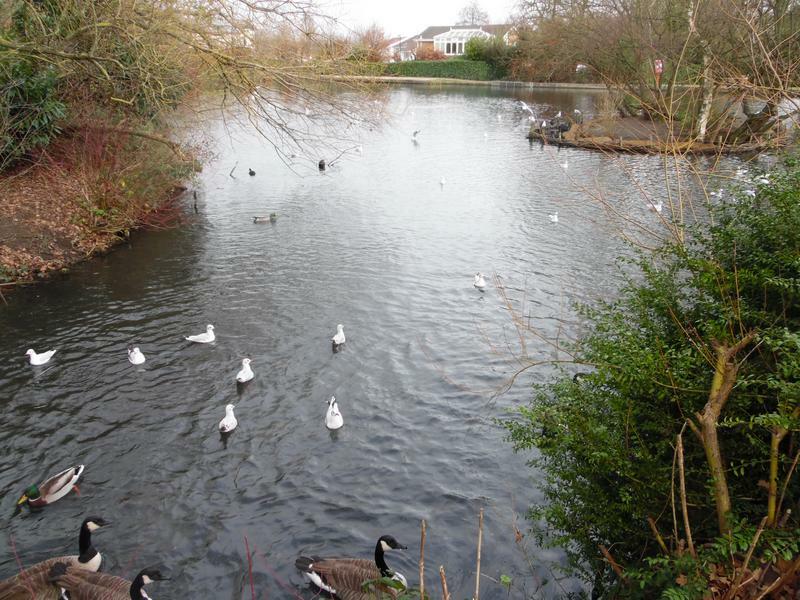 25th October 2015, even more noisy sea gulls. 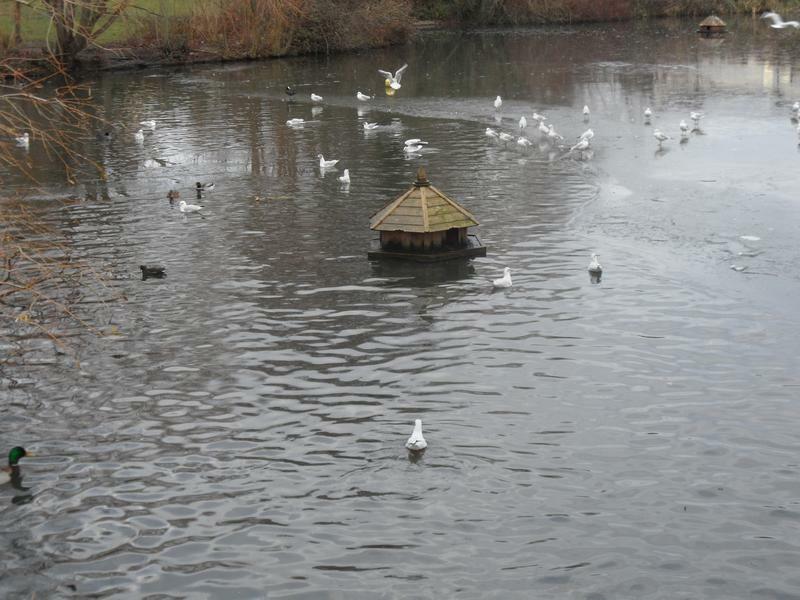 The gulls must be hungry, they don't often come behind the large island. 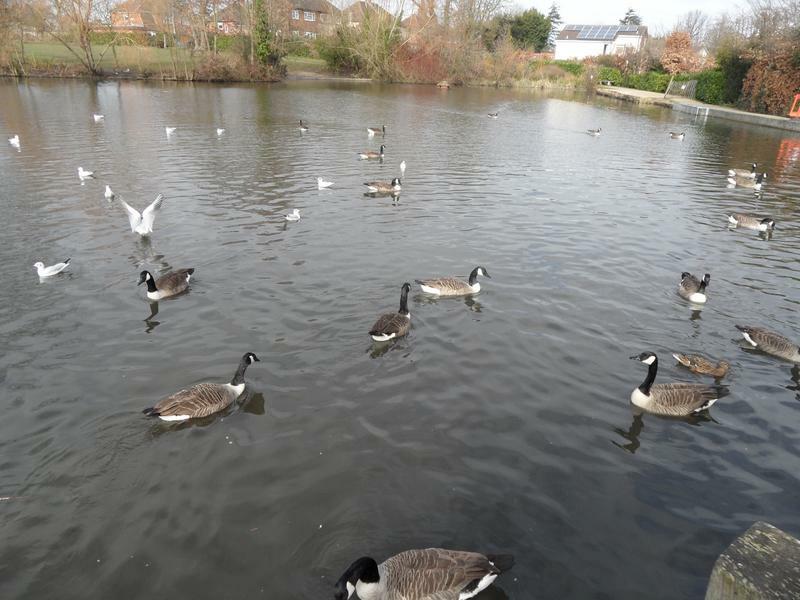 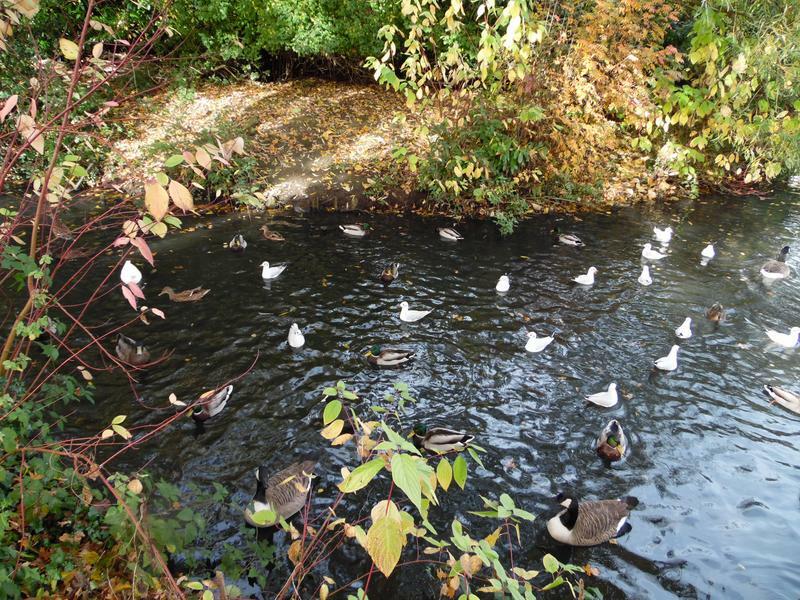 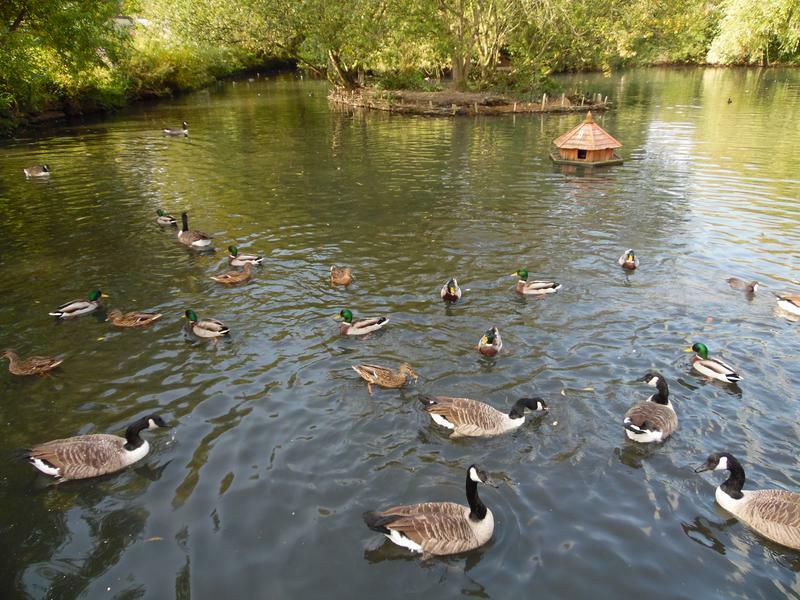 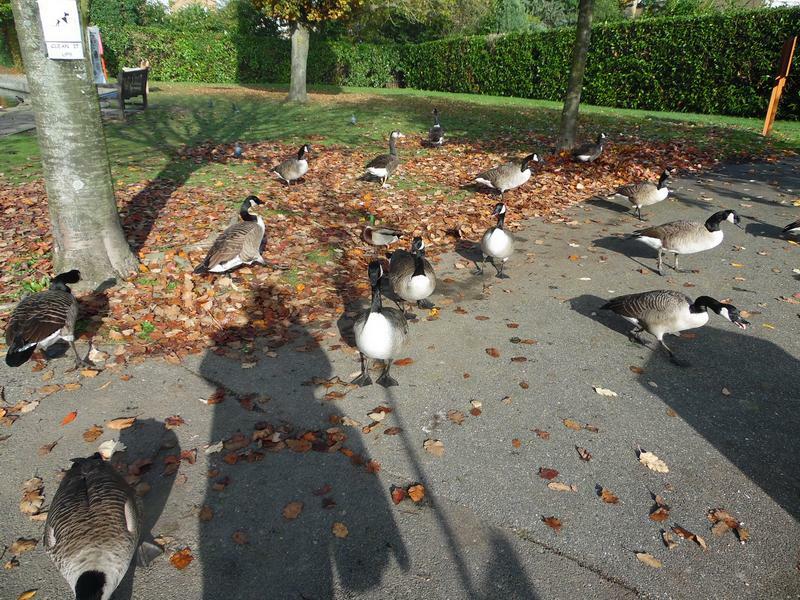 1st November 2015, large number of Canada Geese near the entrance to the pond. 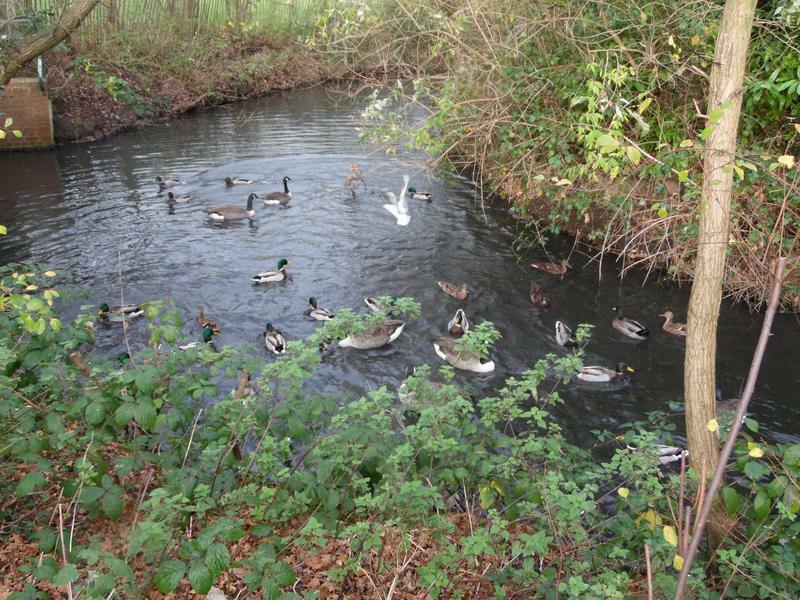 The pond is very busy this wek. 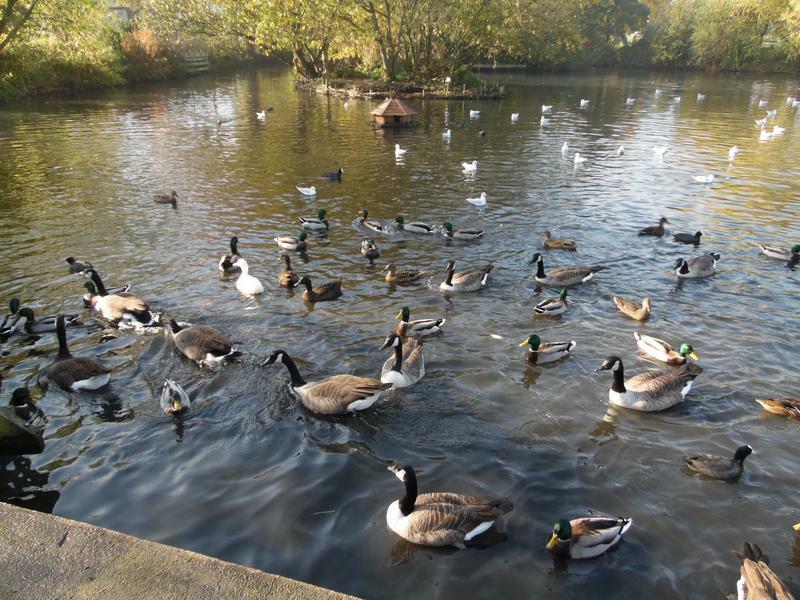 15th November 2015, both pond islands, still a lot of birds. 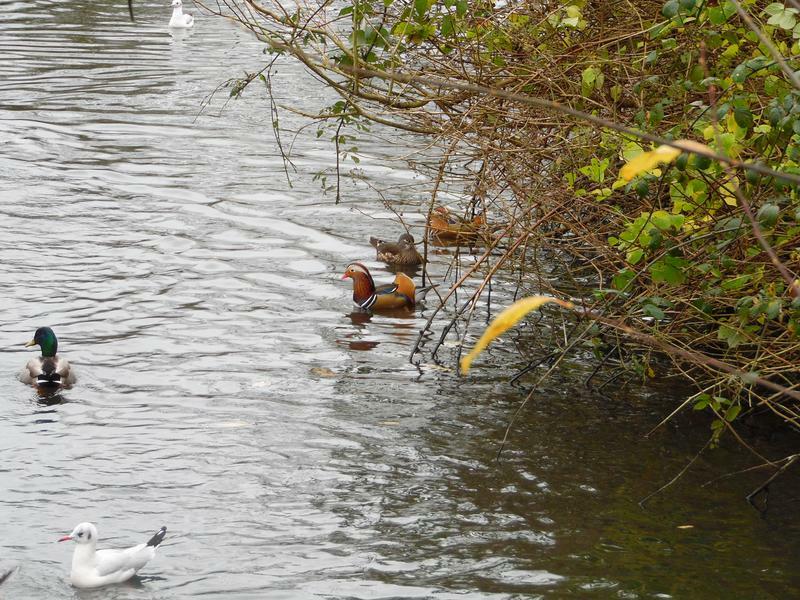 6th December 2015, two male and one female Mandarin ducks, and a Mallard boy. 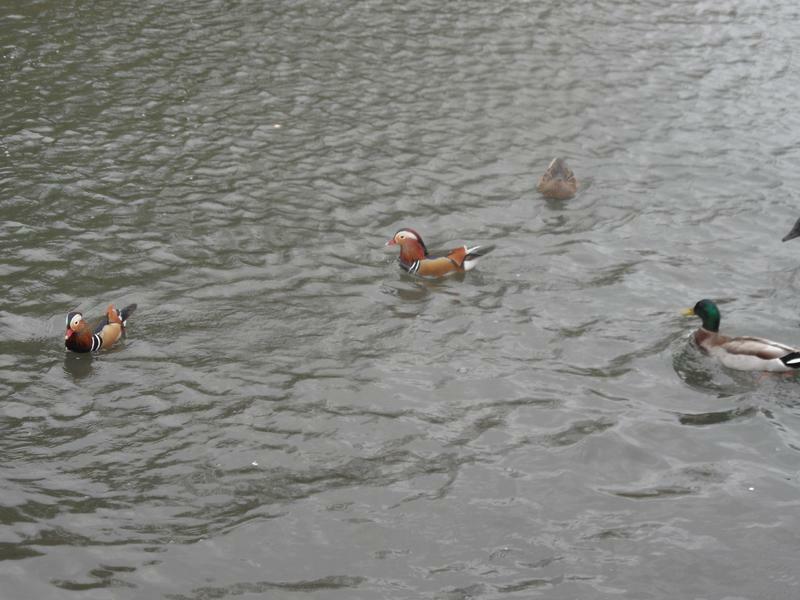 The three Mandarins again, and three sea gulls. 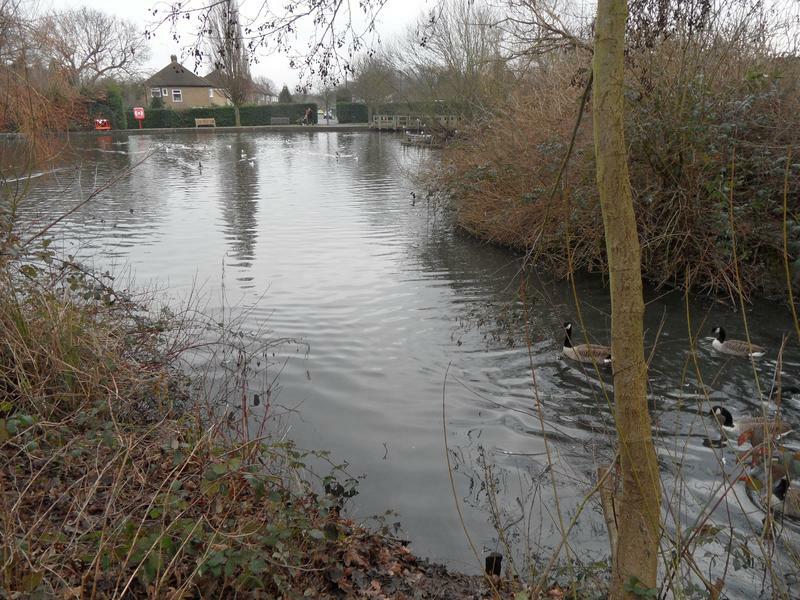 20th December 2015, behind the large island, a buried culvert delivers a slow trickle of water to the pond from next to the brick wall. 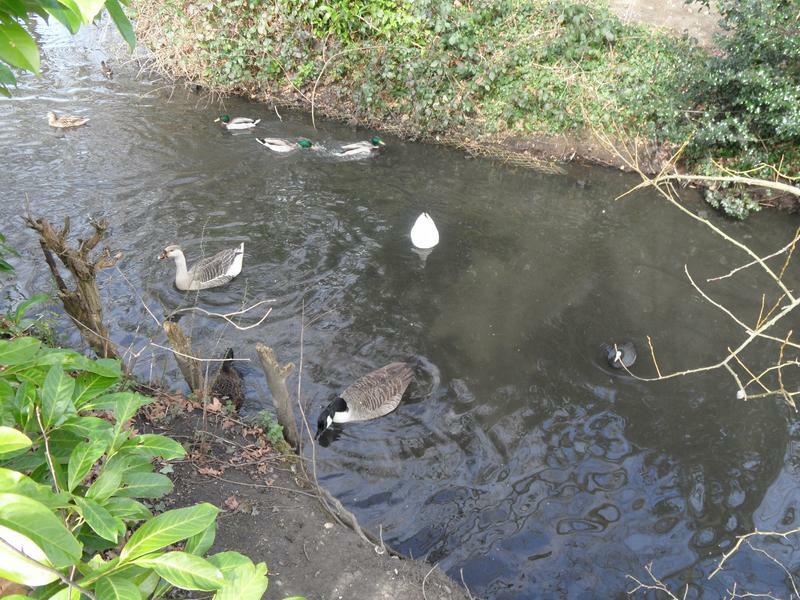 Perhaps the ducks and geese are hiding from the sea gulls.